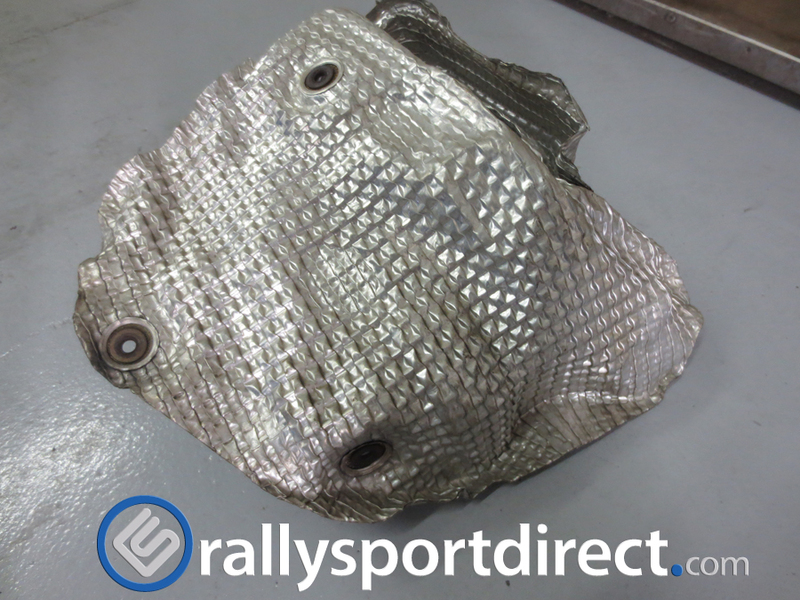 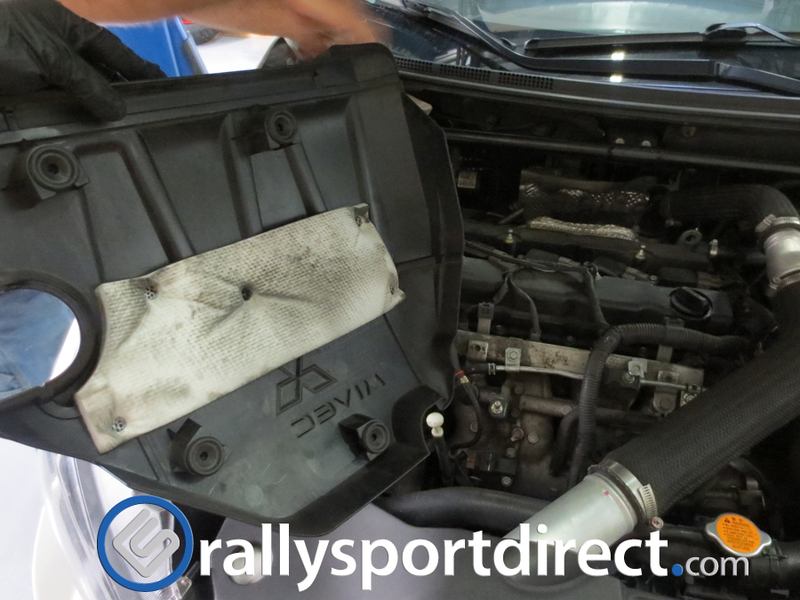 Start by removing the plastic cover the covers your engine. 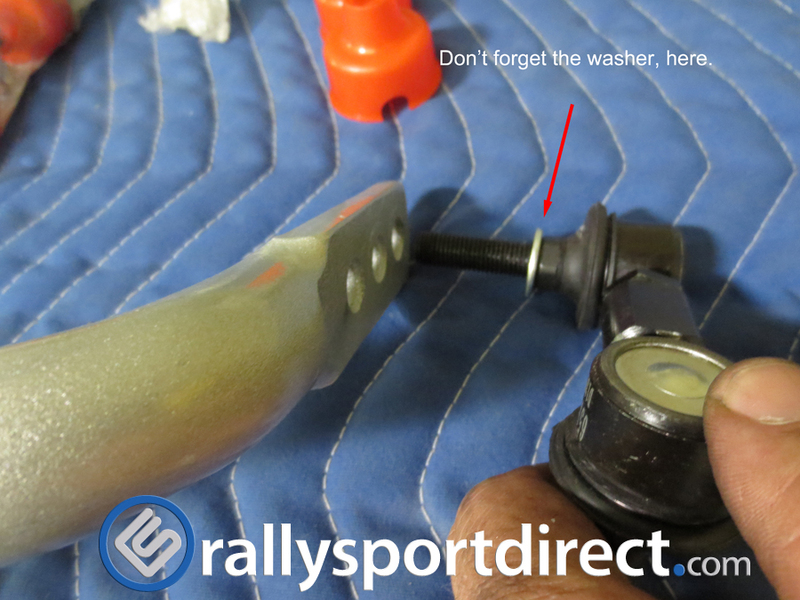 To remove simply pull up on it gently with one hand on the back and front. 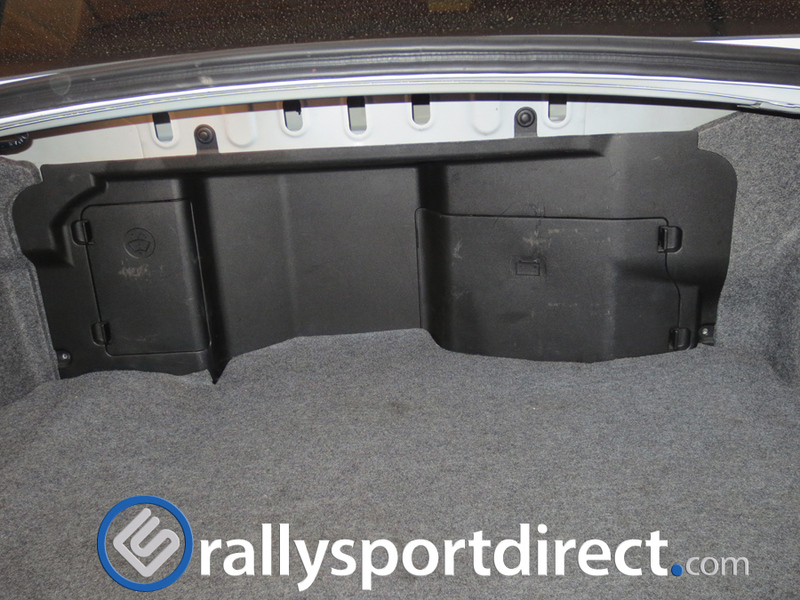 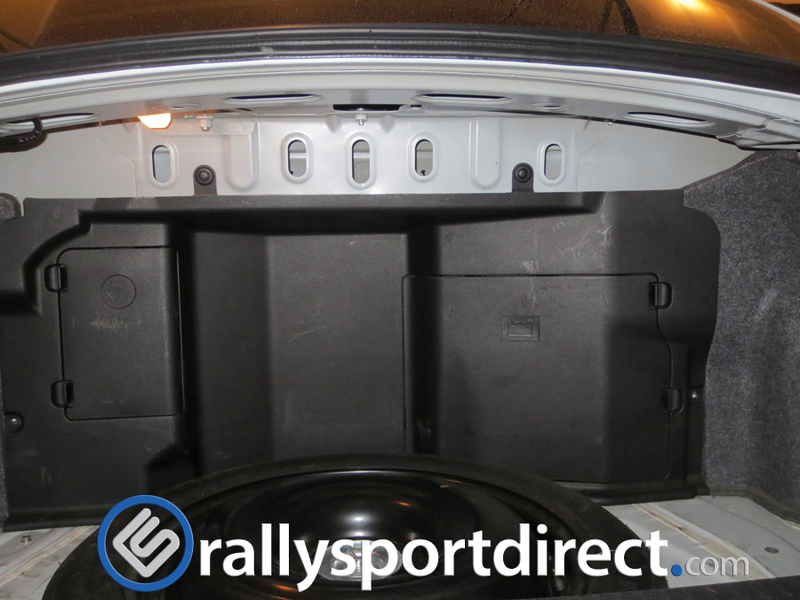 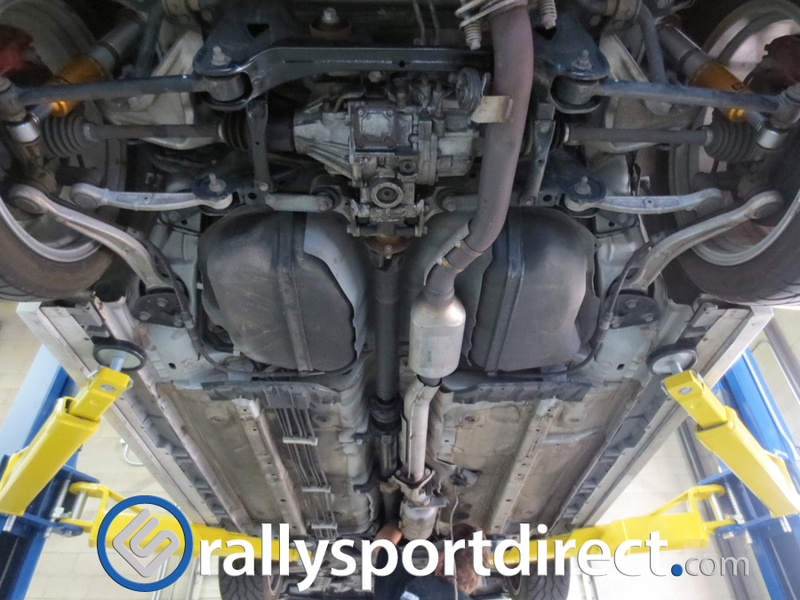 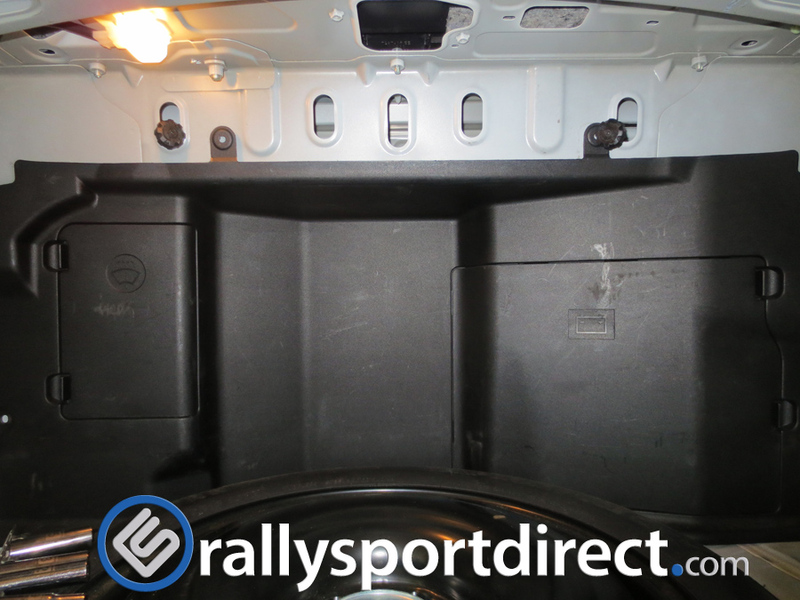 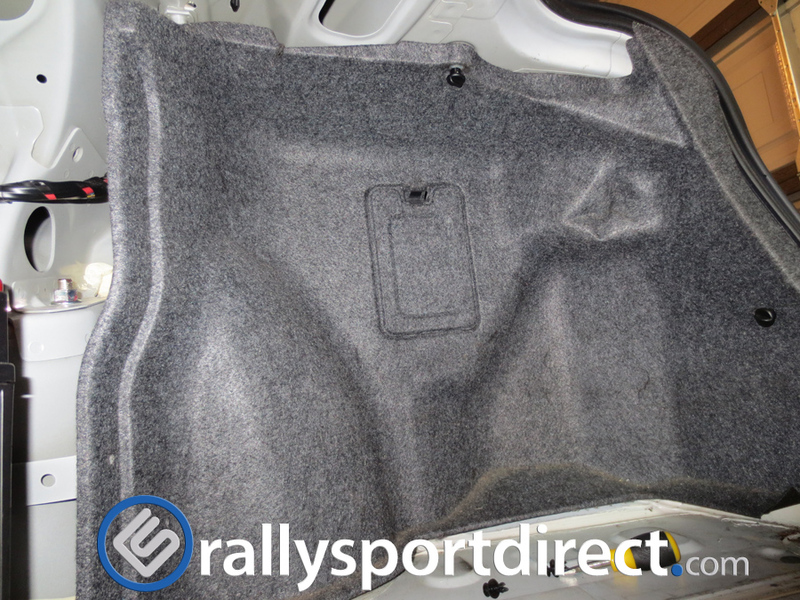 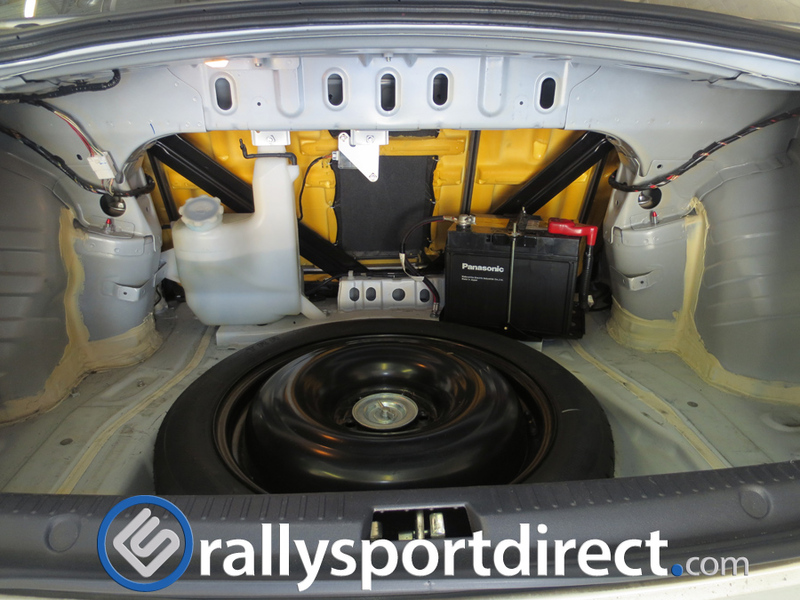 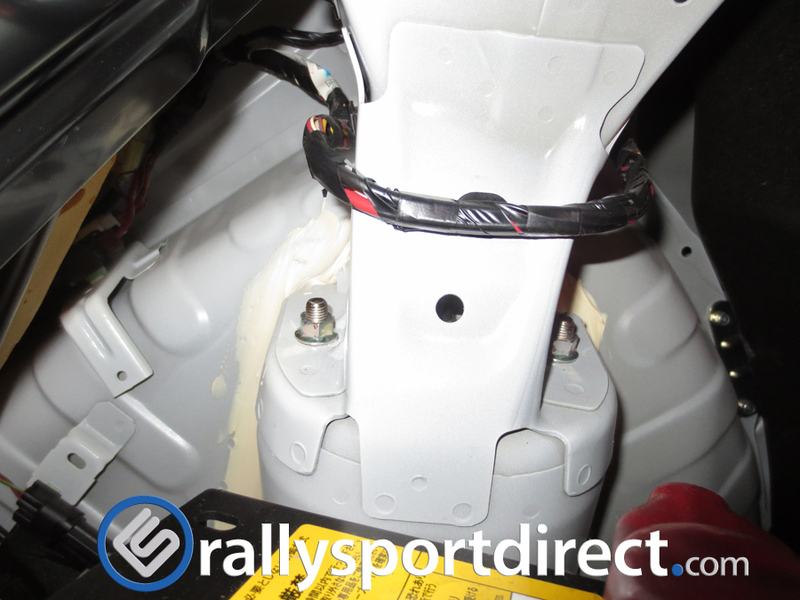 Remove your Strut Tower Brace as well to give you more room to work with. 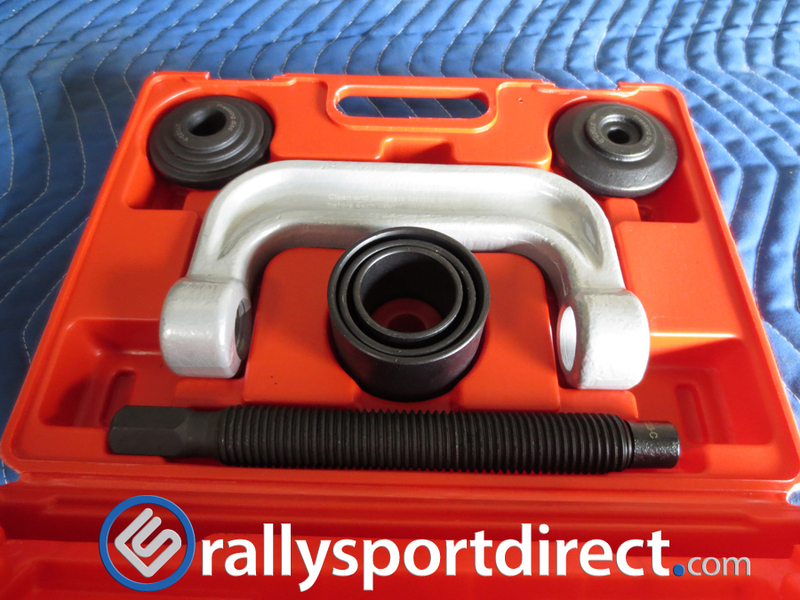 You will need a 14mm socket or wrench for the 6 nuts and 2 bolts that hold this on. 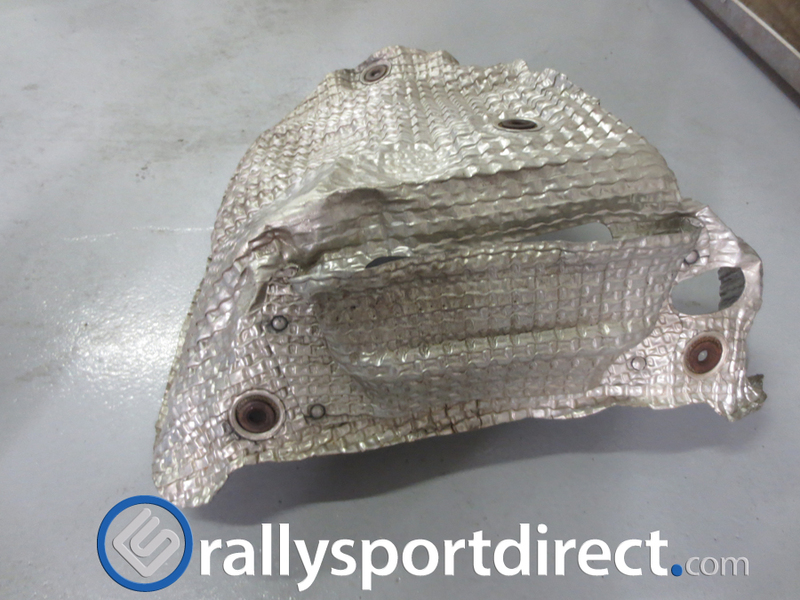 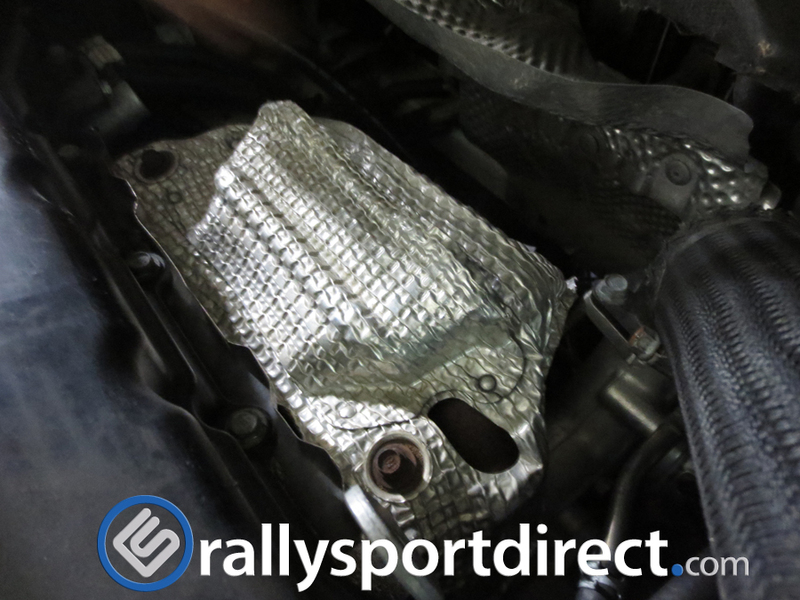 You will now have much better access to the heat shield located on the back of the motor. 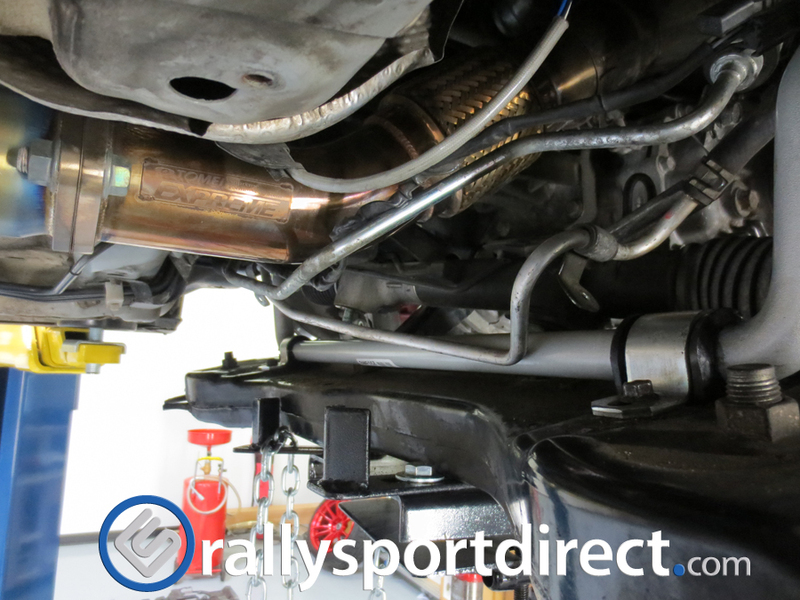 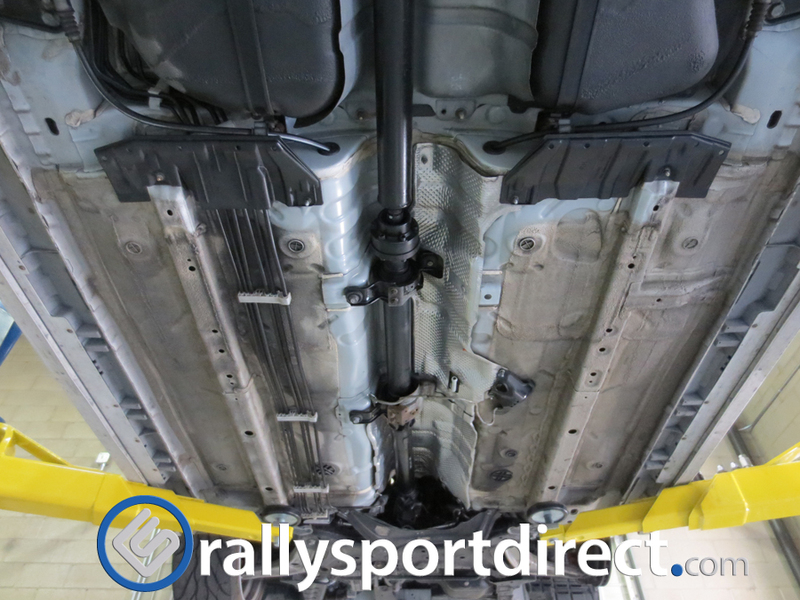 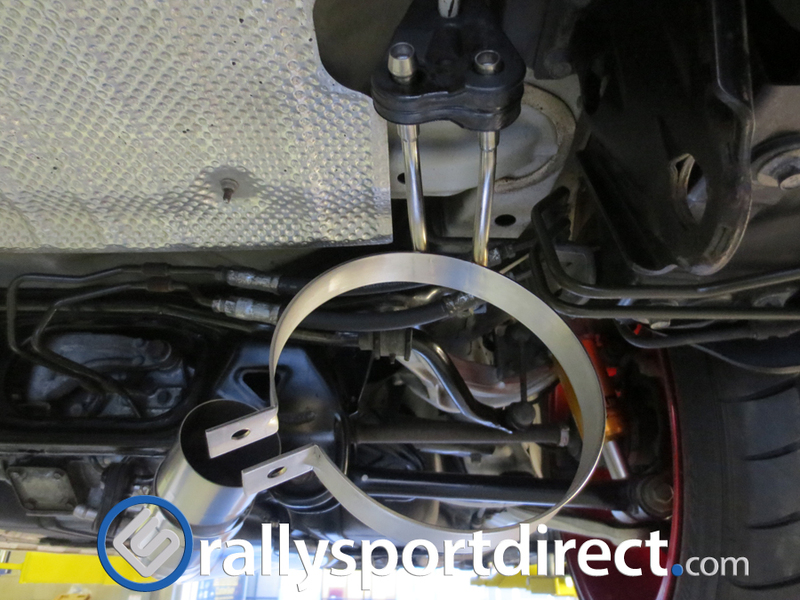 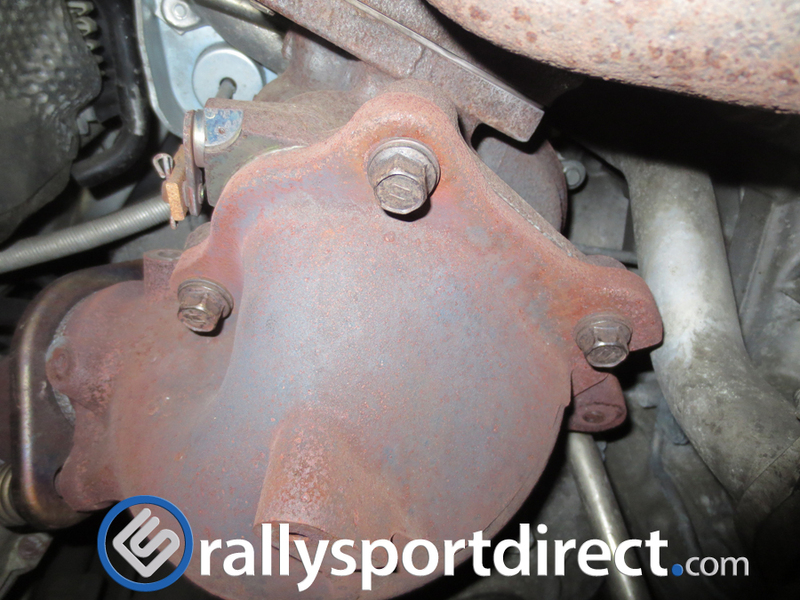 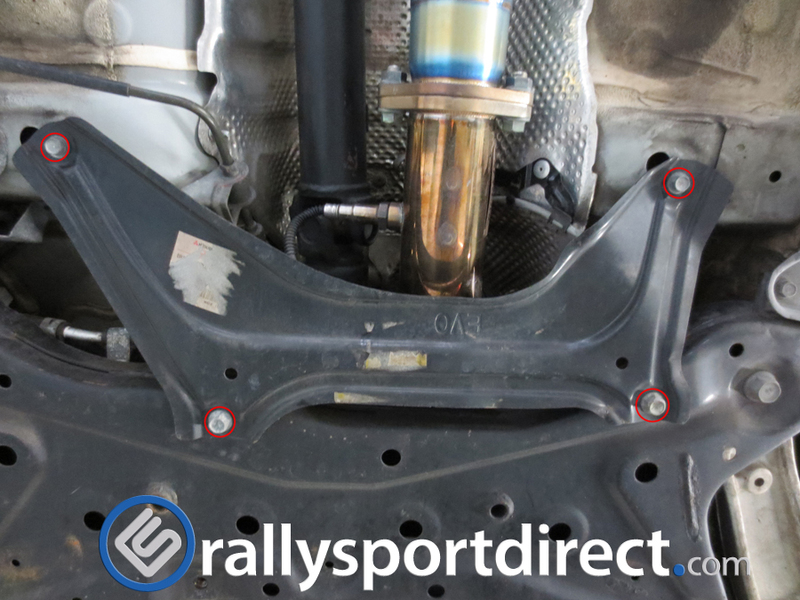 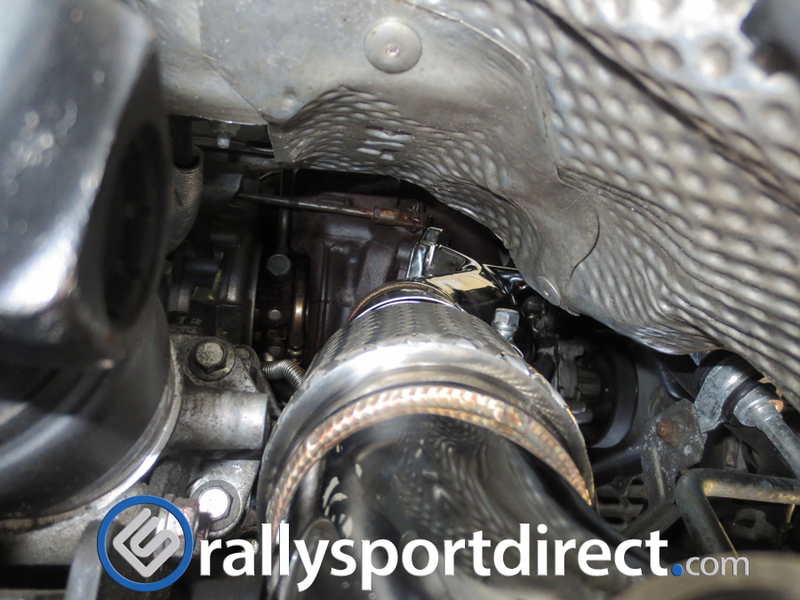 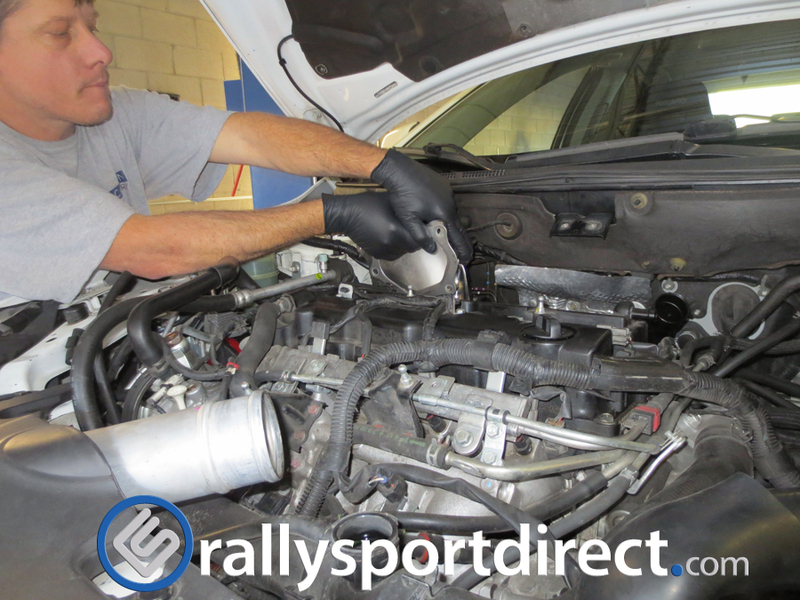 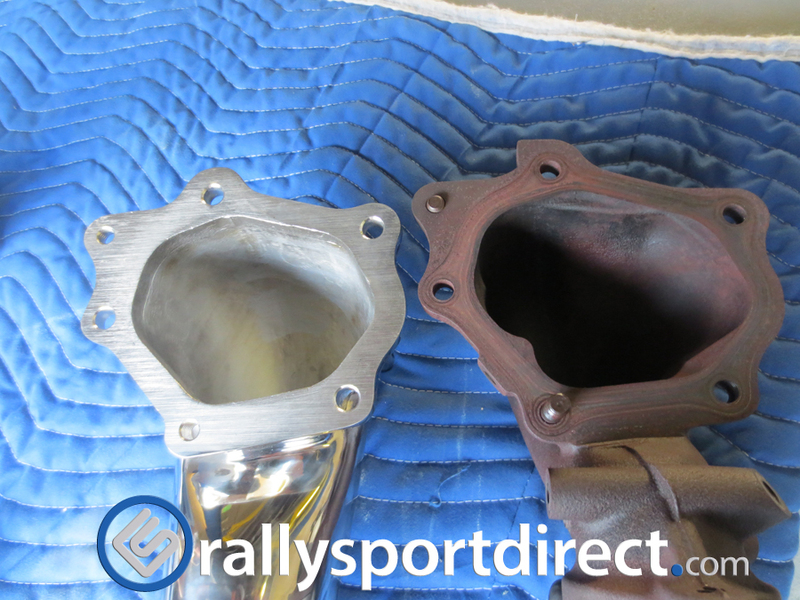 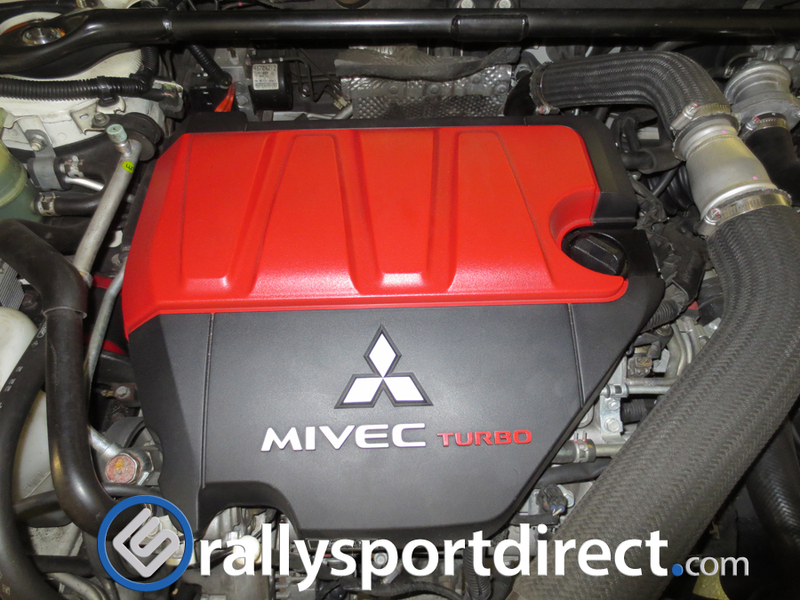 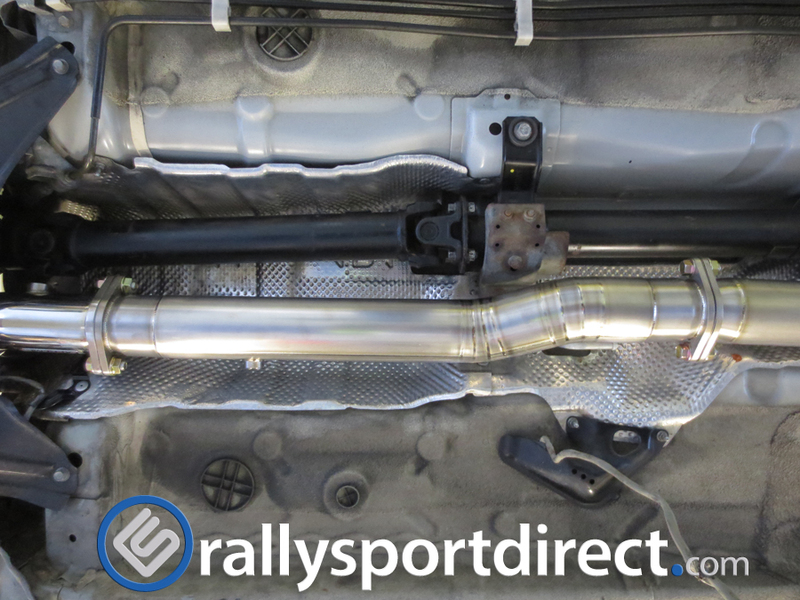 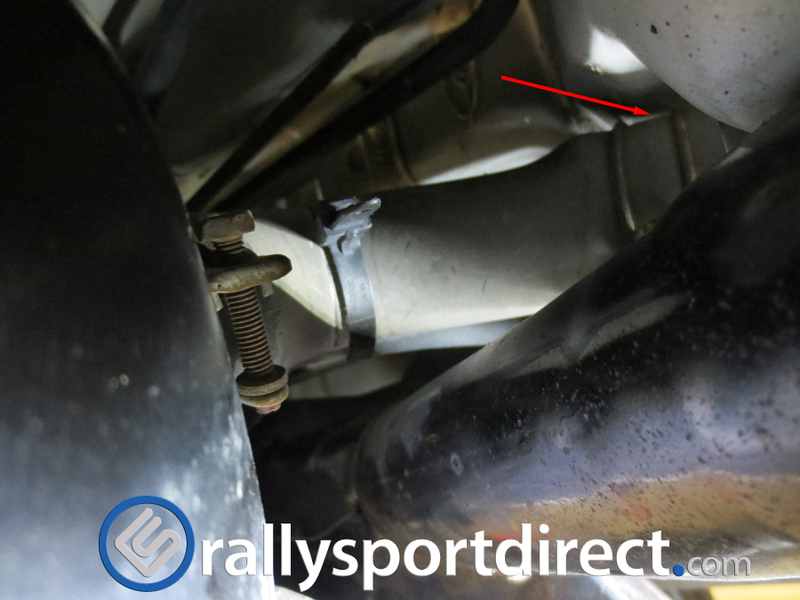 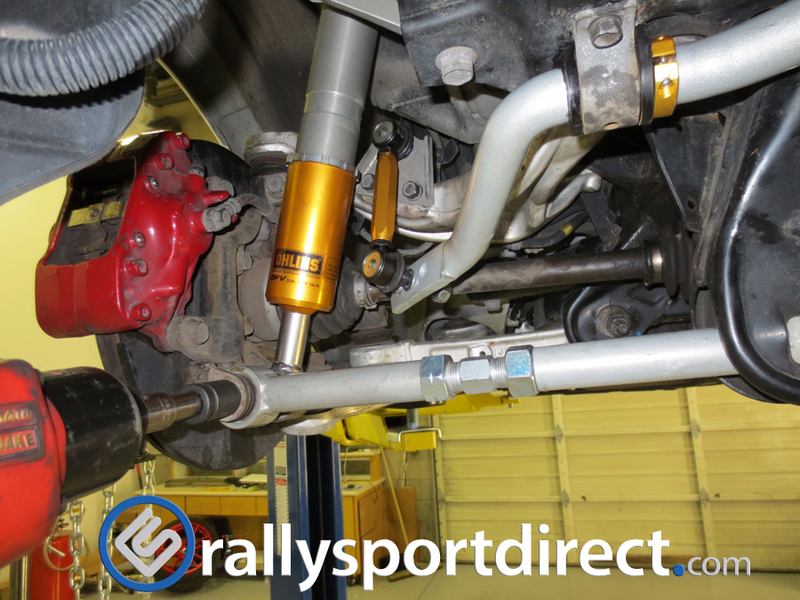 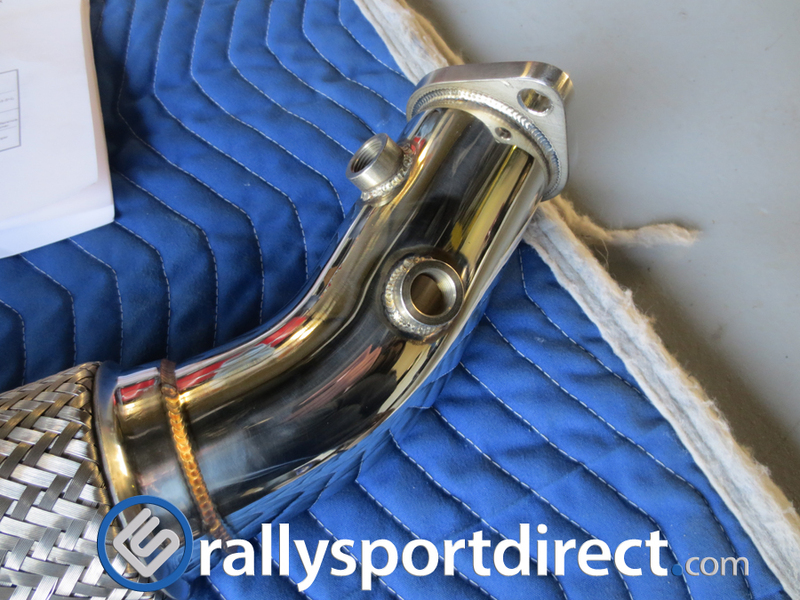 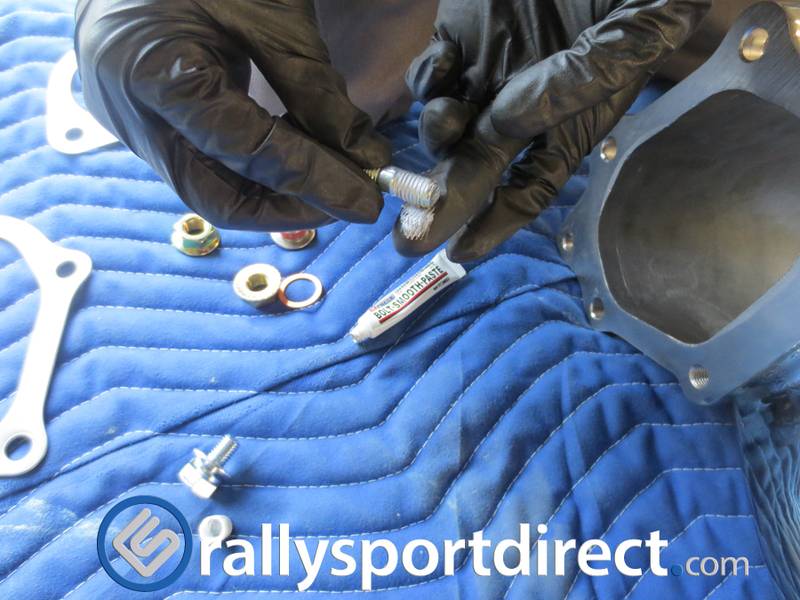 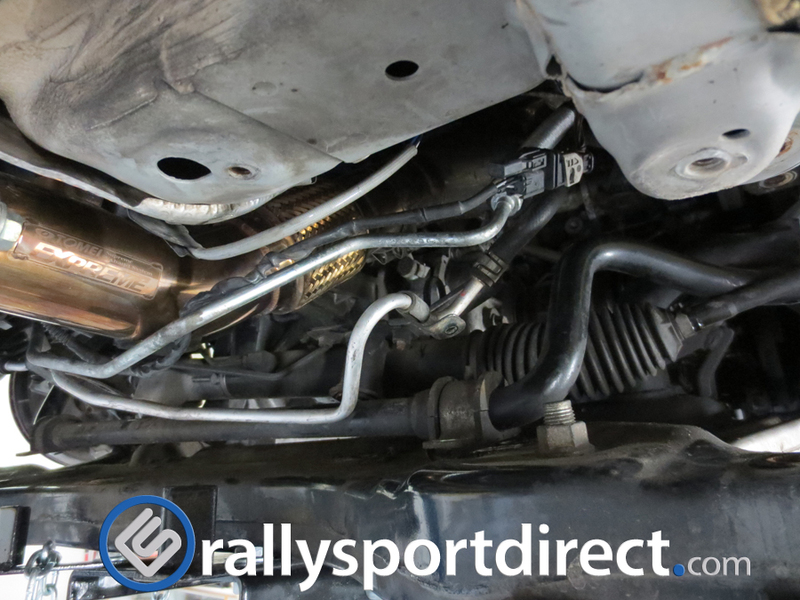 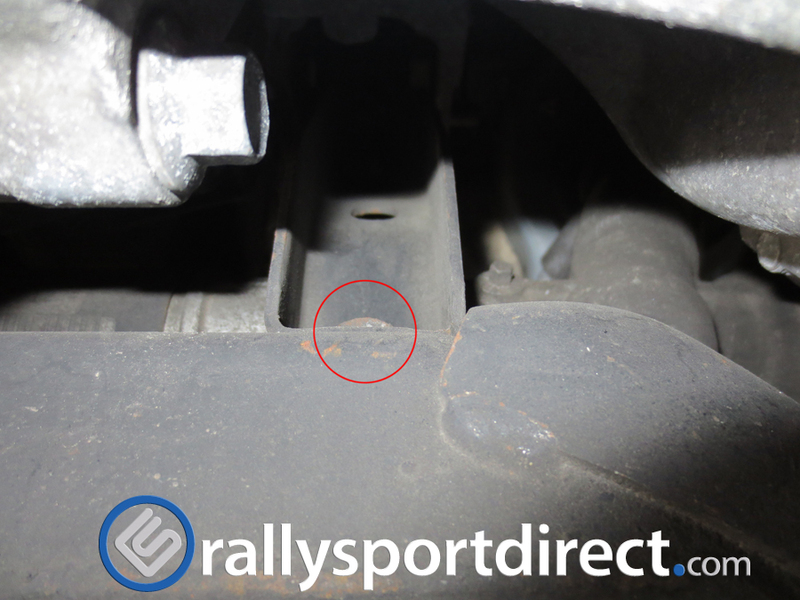 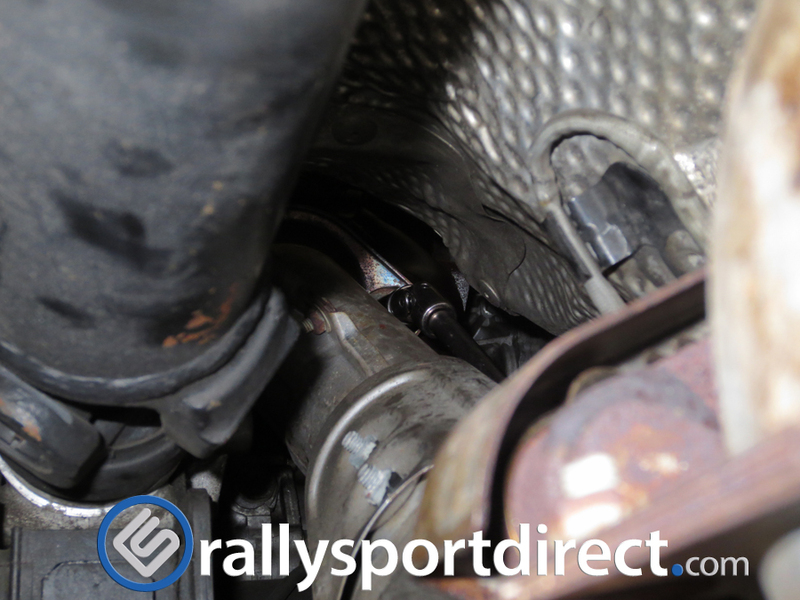 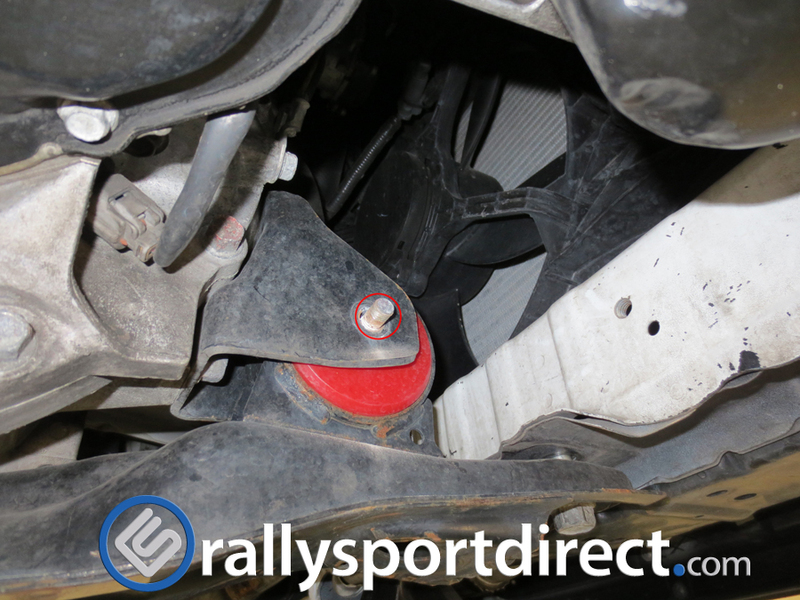 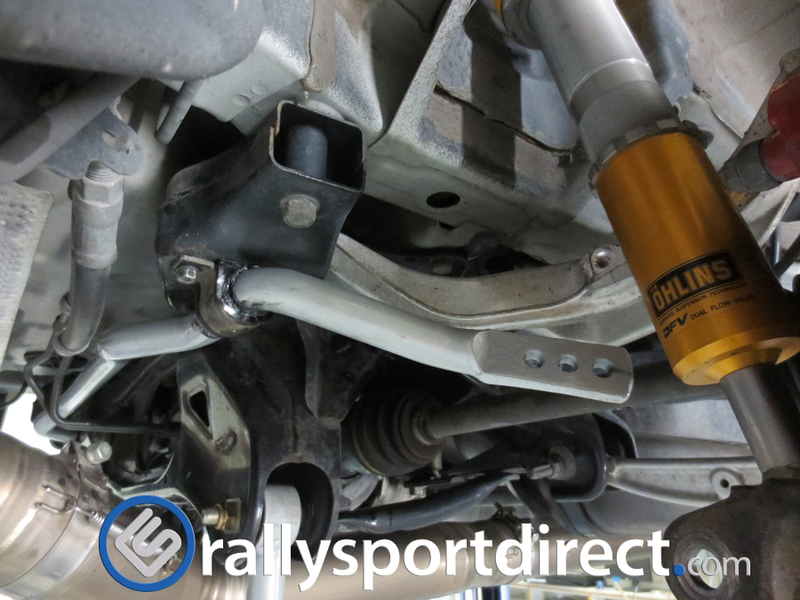 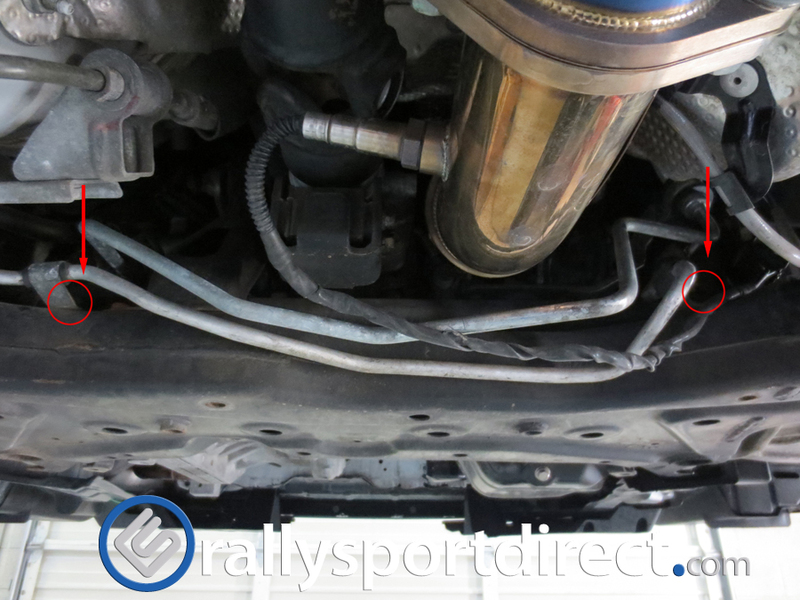 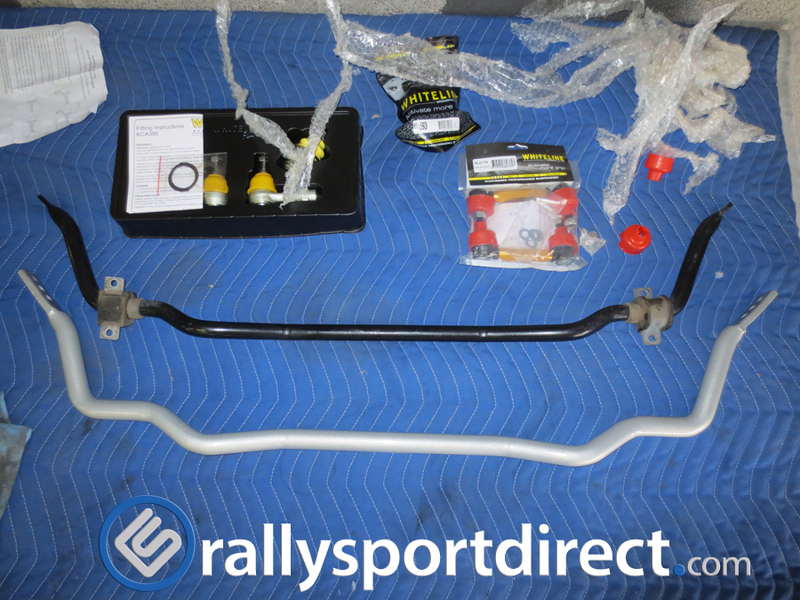 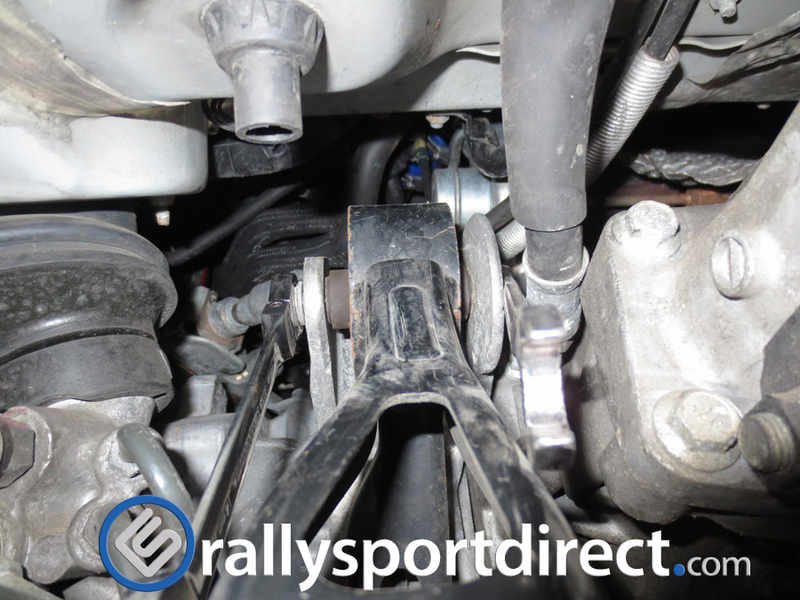 Locate the 5- 10mm bolts that hold the heat shield to the manifold and down pipe. 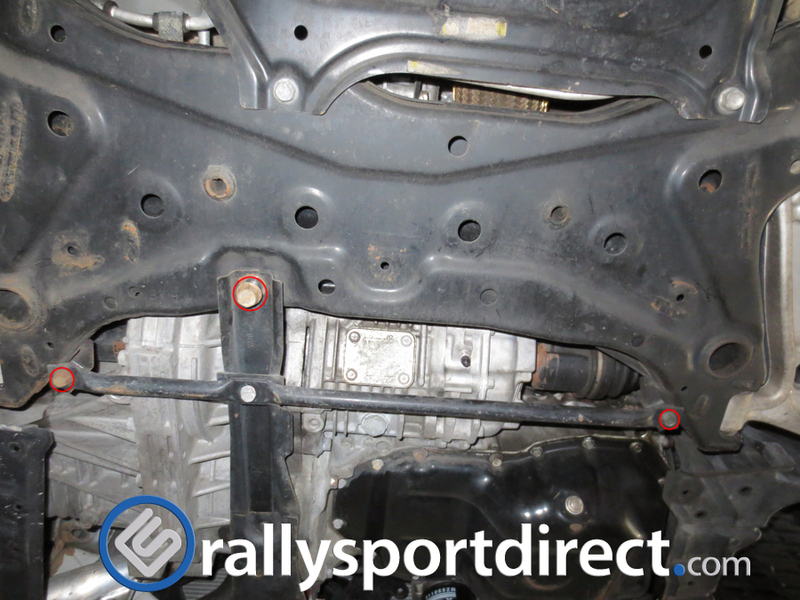 2- 10mm bolts located on the lower back and side to the down pipe. 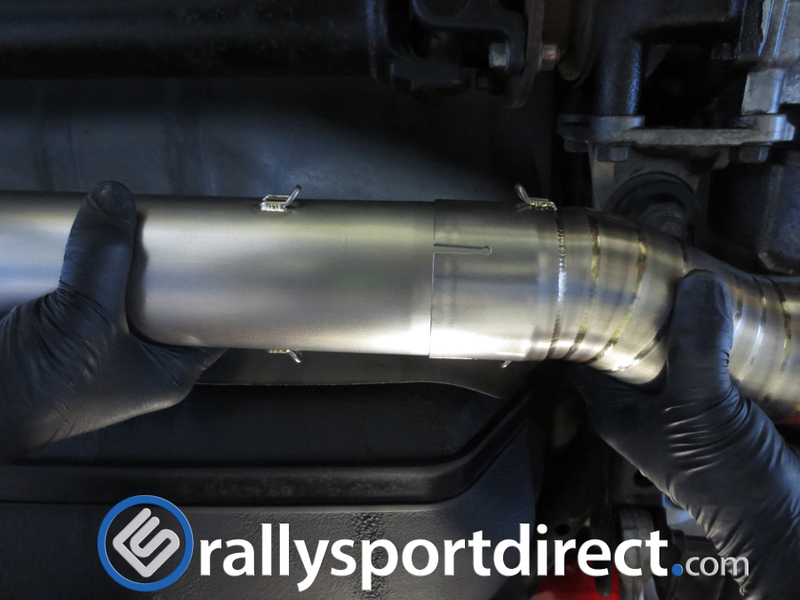 Once you have removed the heat shield you will now be able to see the down pipe. 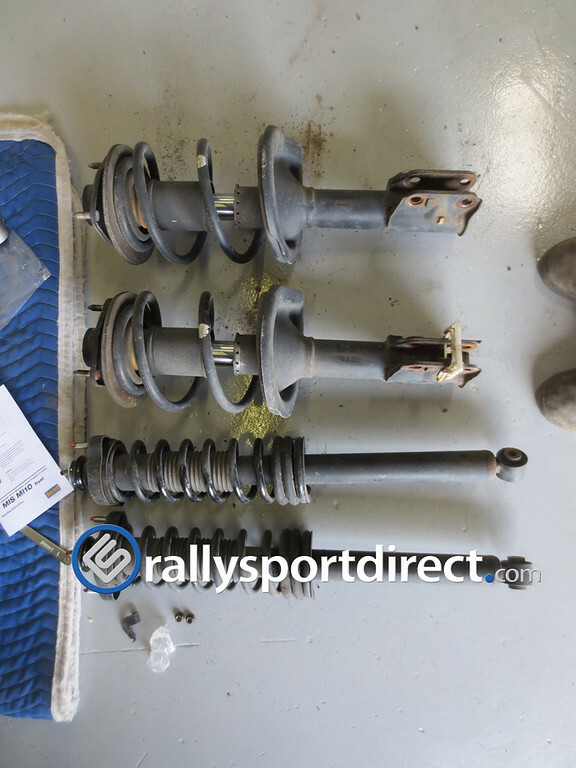 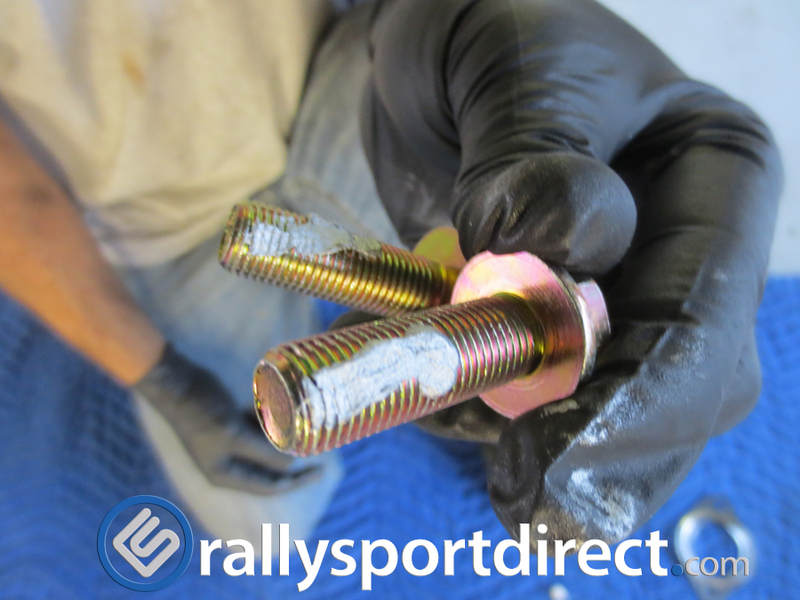 There are 5 bolts and 1 Nut all being 14mm size. 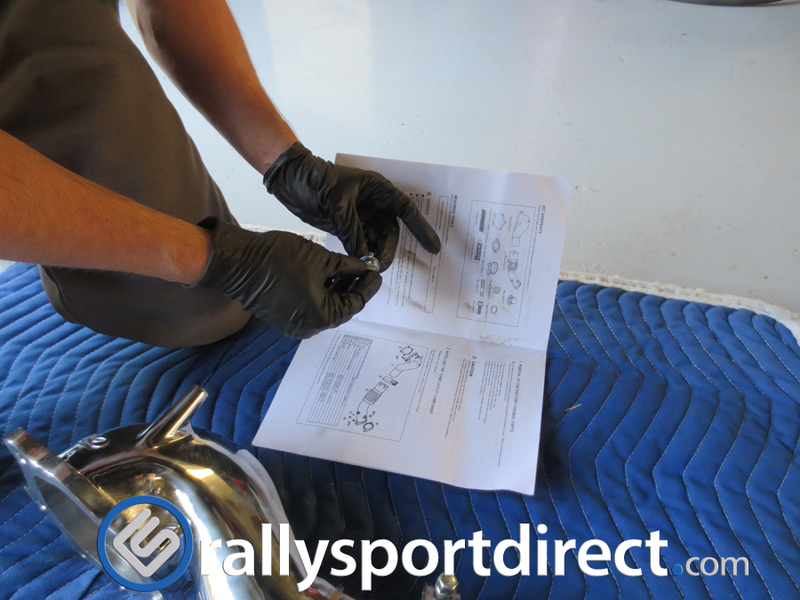 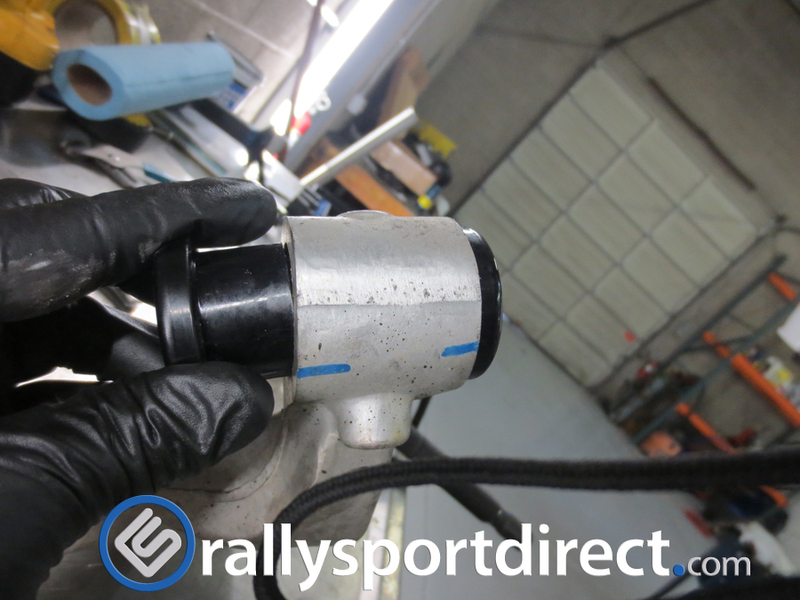 Using a O2 censor socket we removed the the O2 Sensor and Wide band sensor in the exhaust. 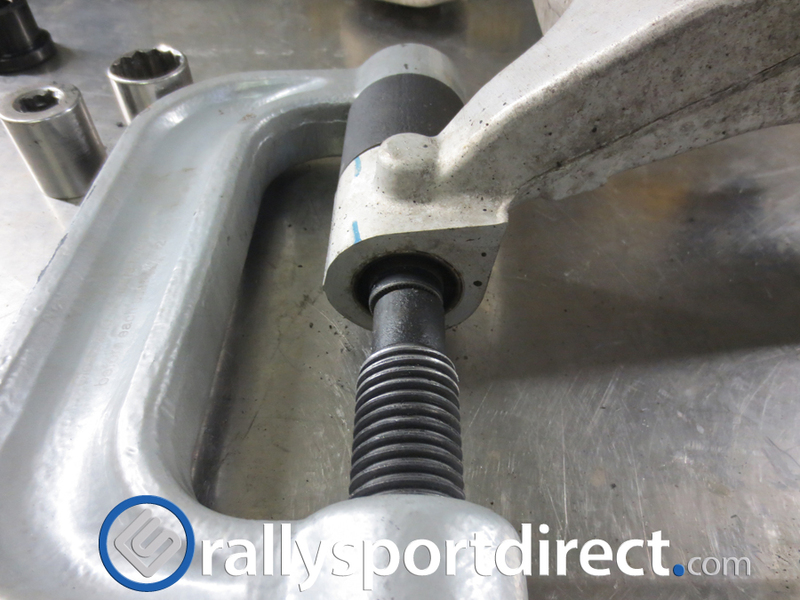 There are 2- 17mm bolts on each end of the cat section 4 total. 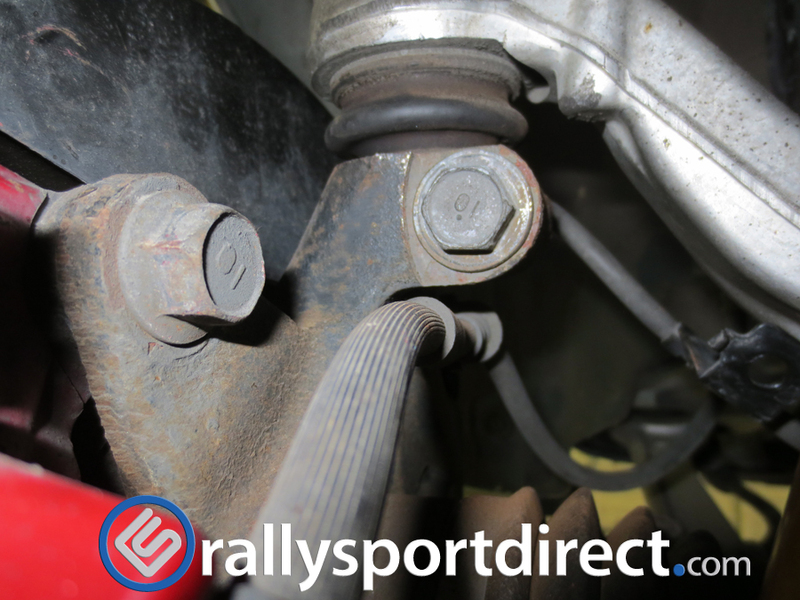 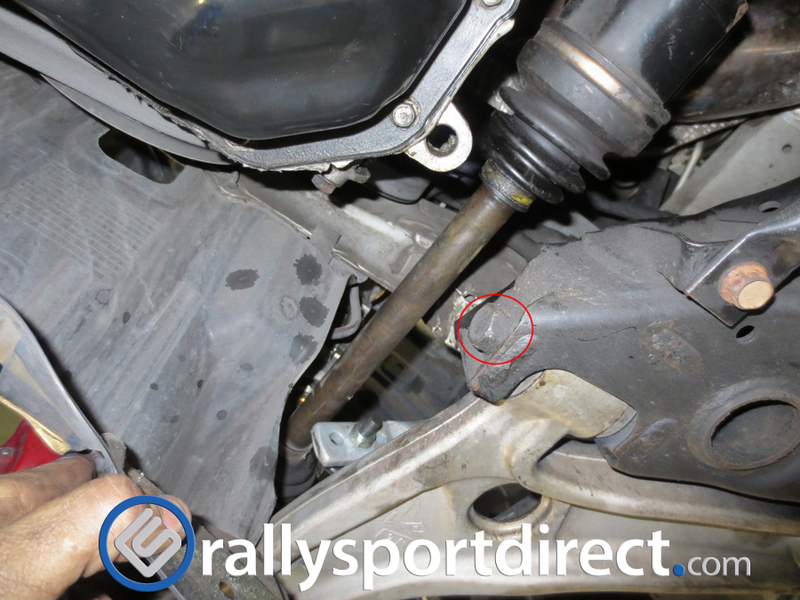 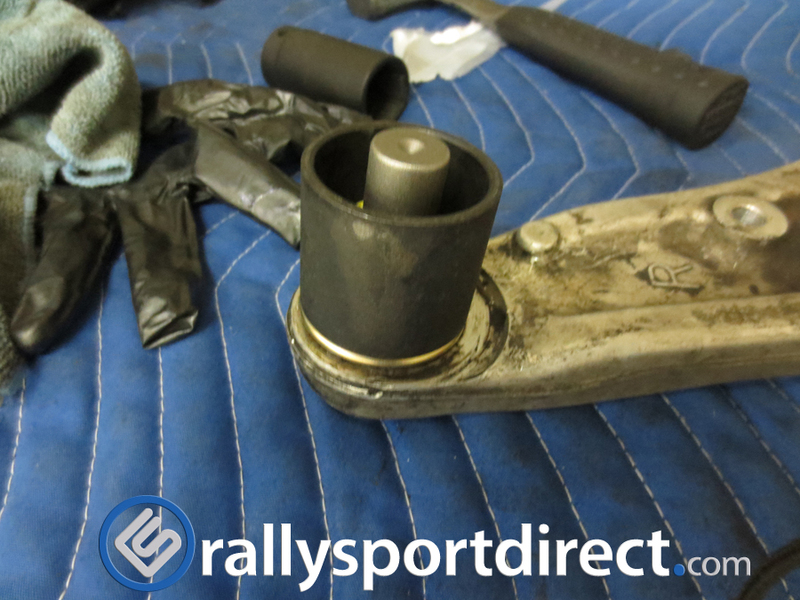 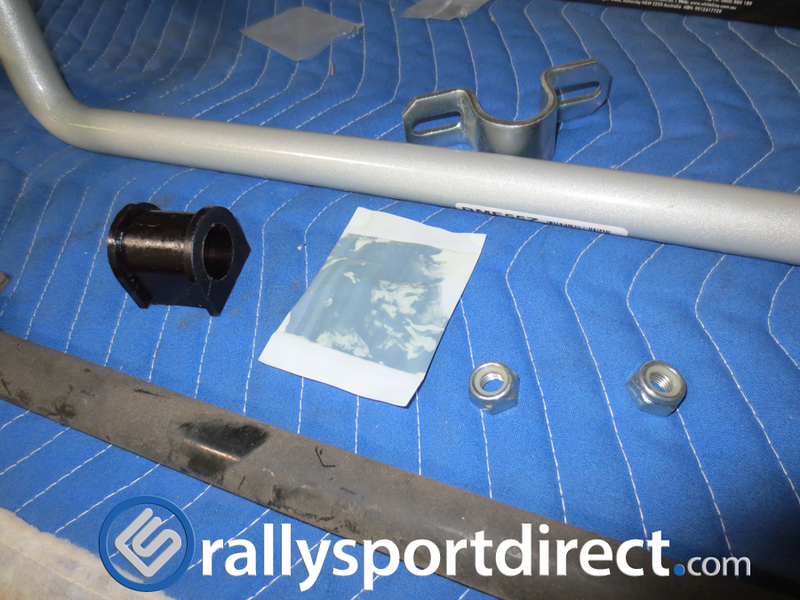 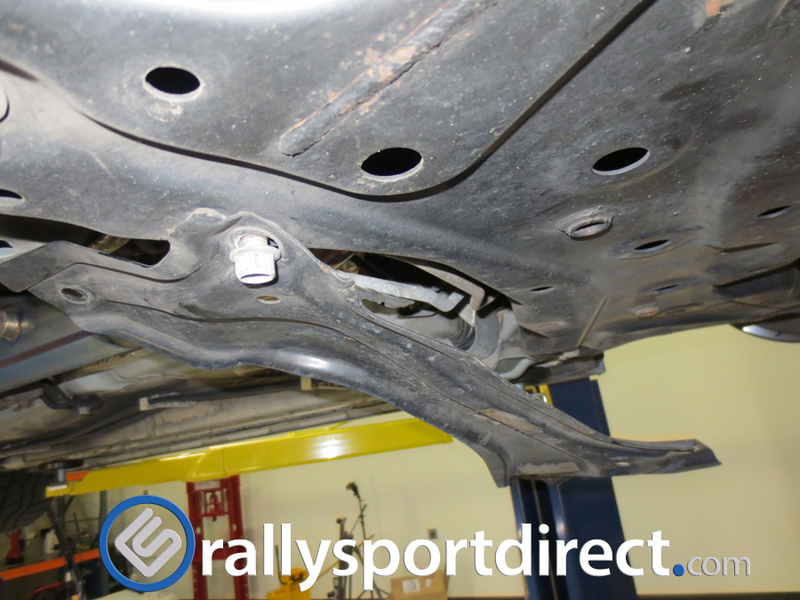 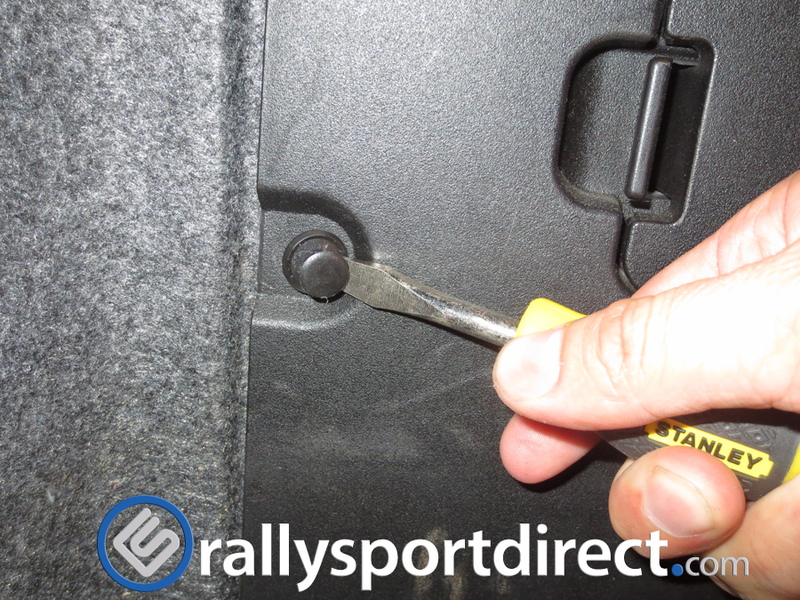 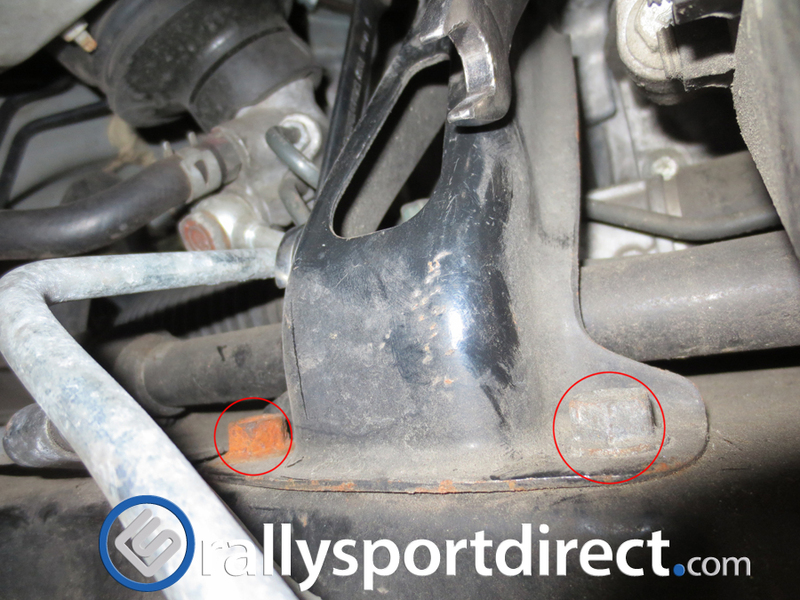 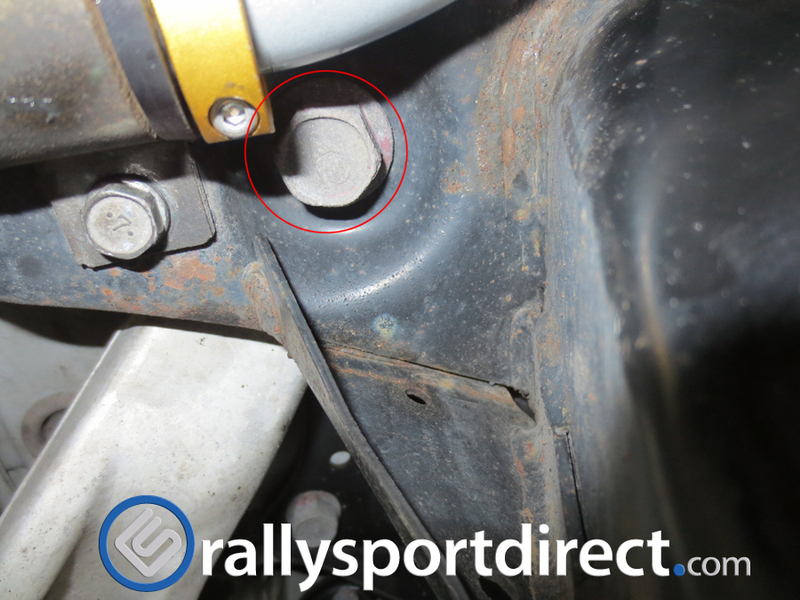 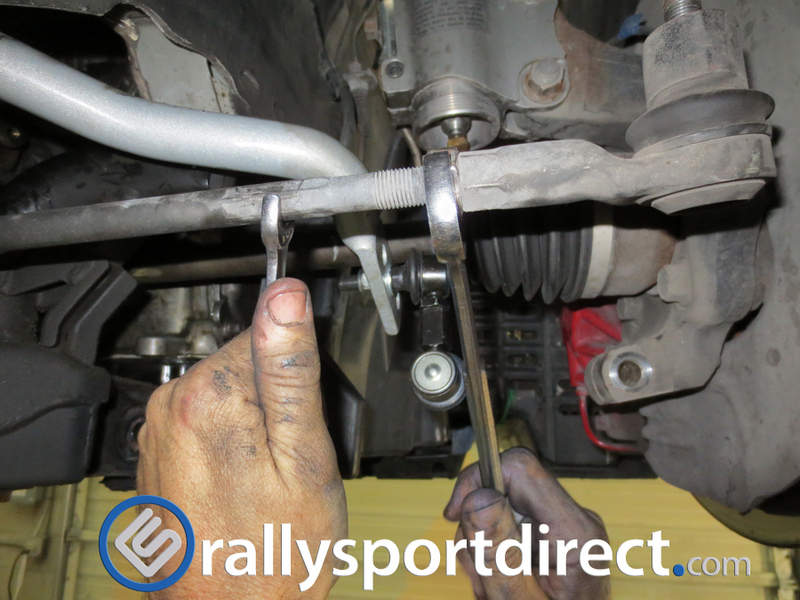 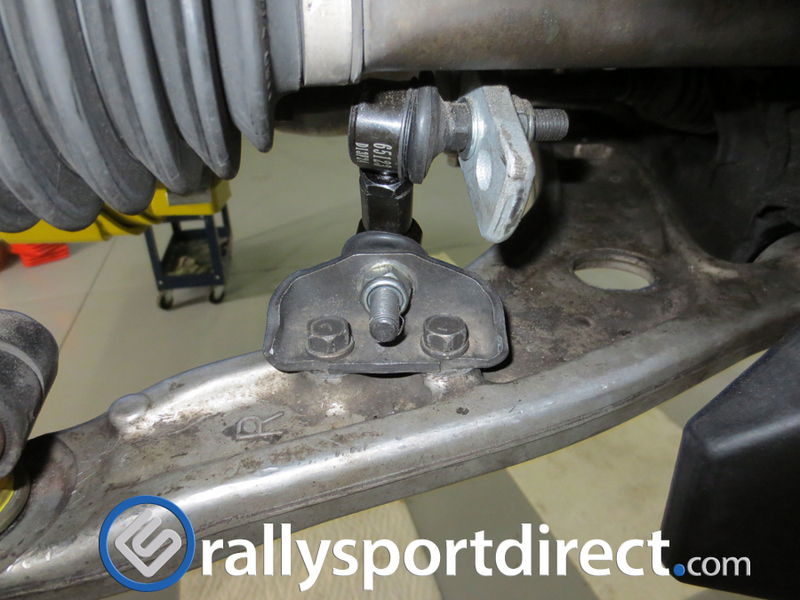 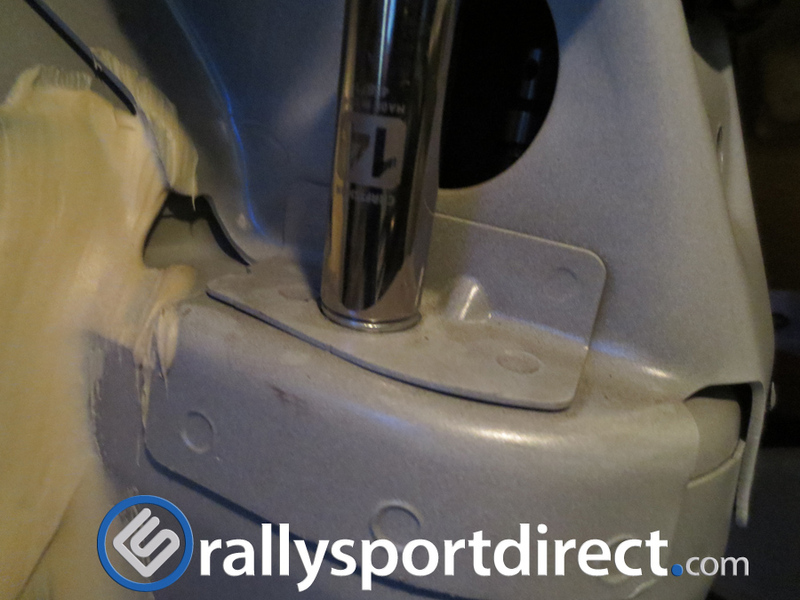 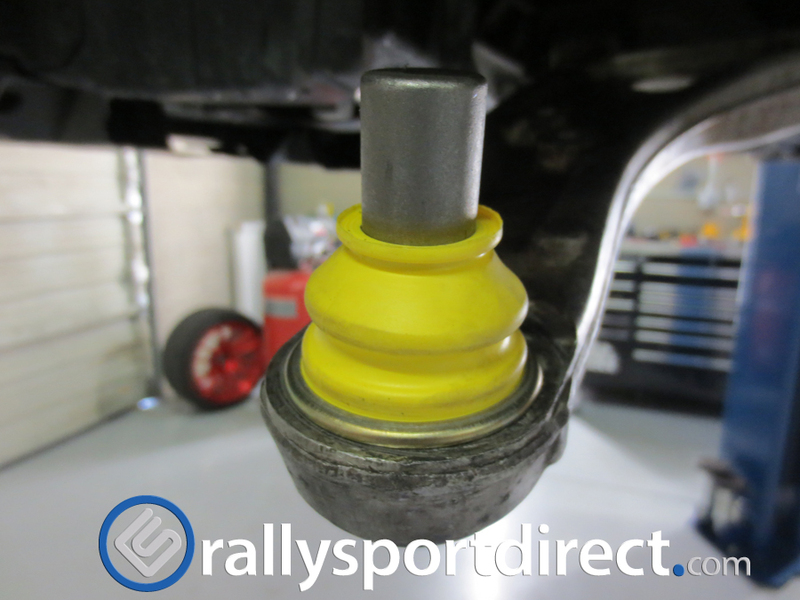 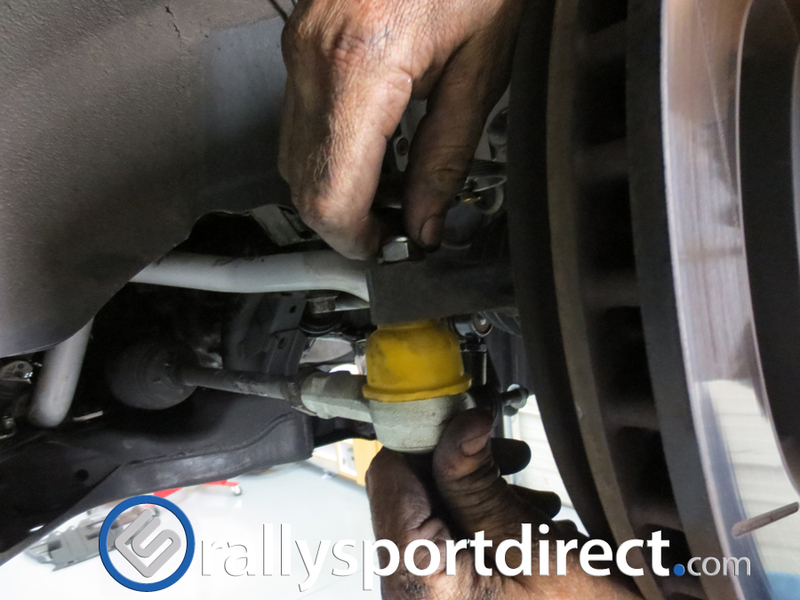 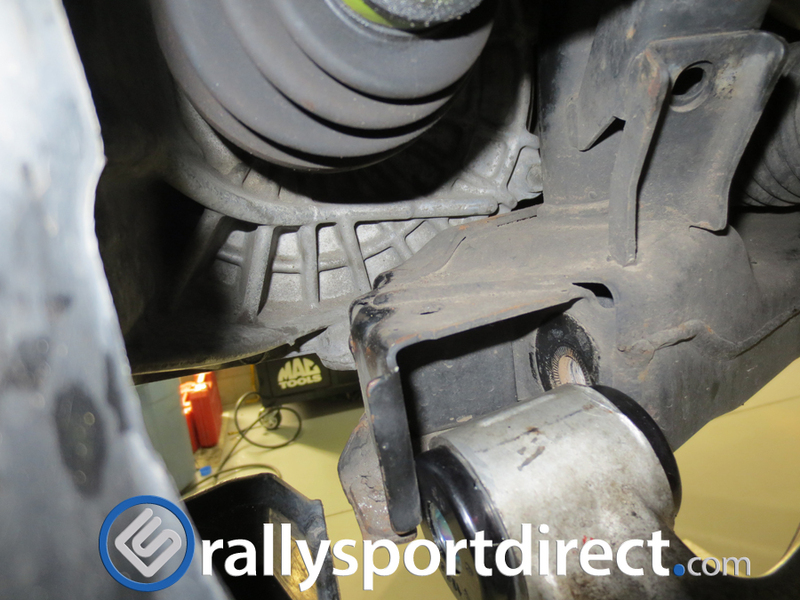 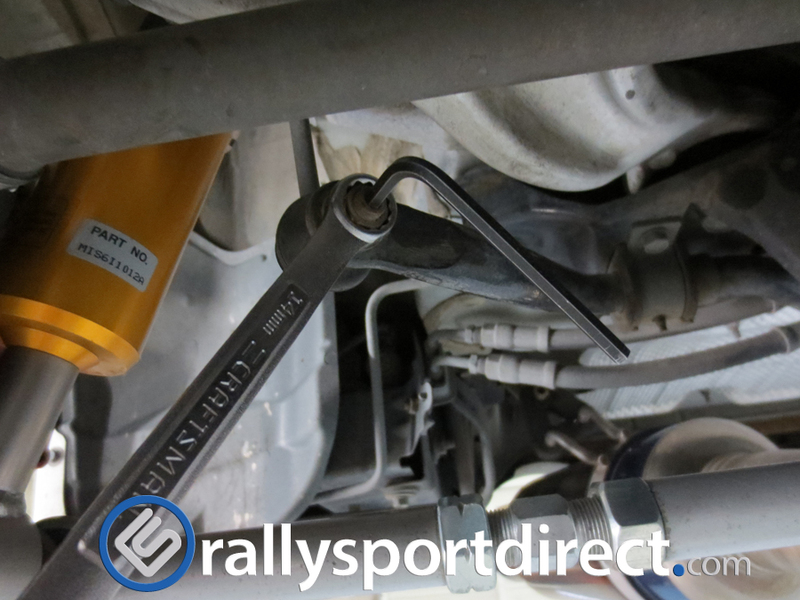 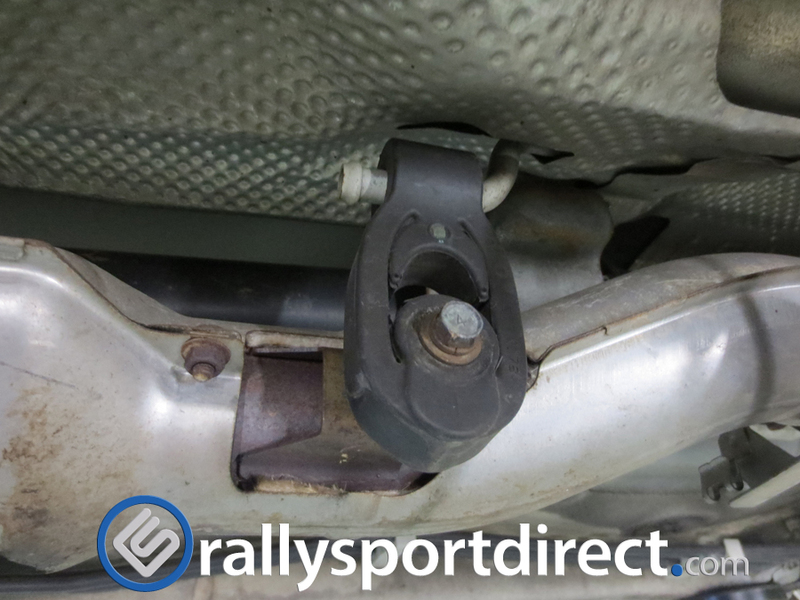 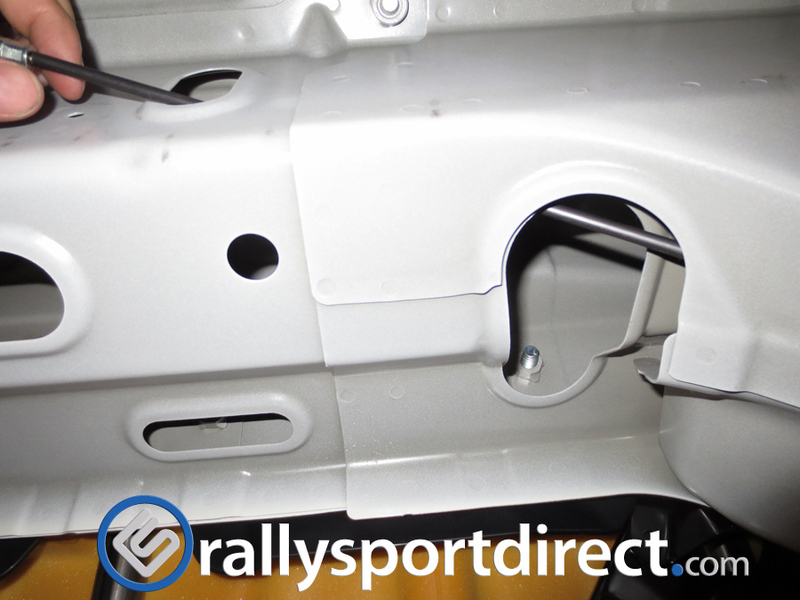 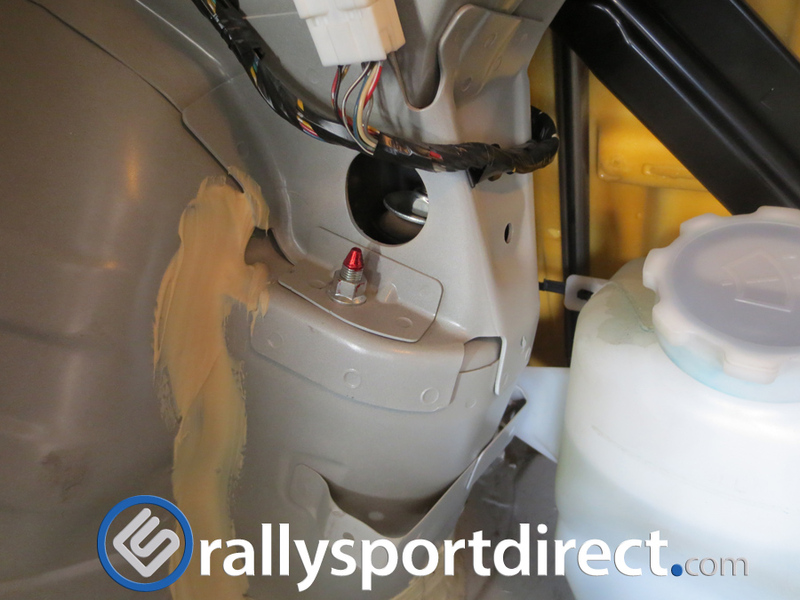 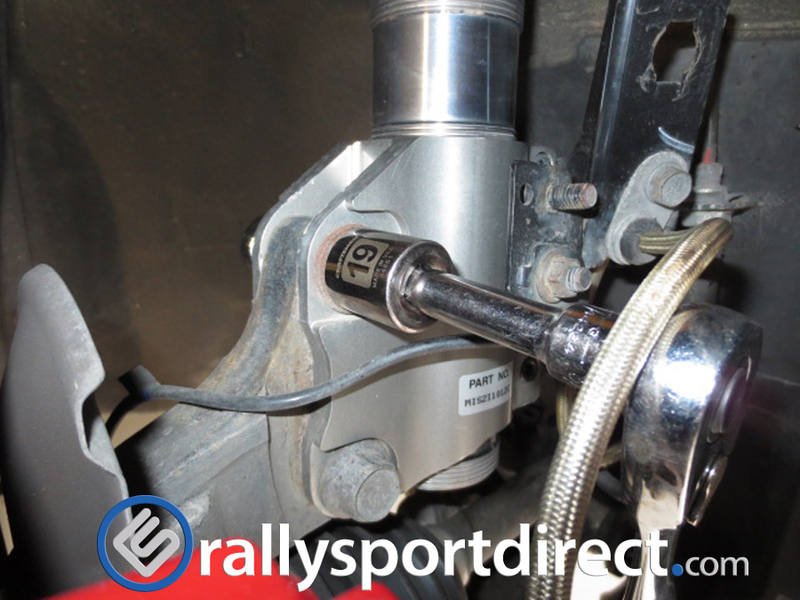 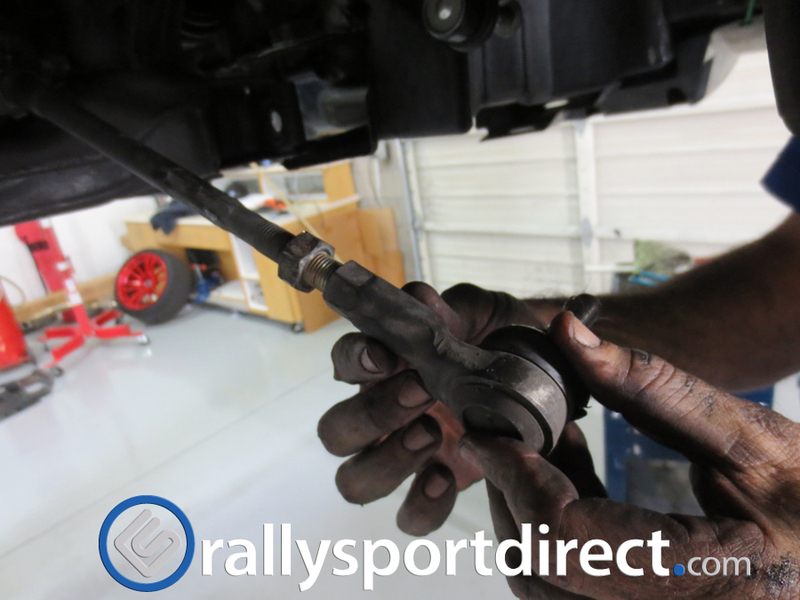 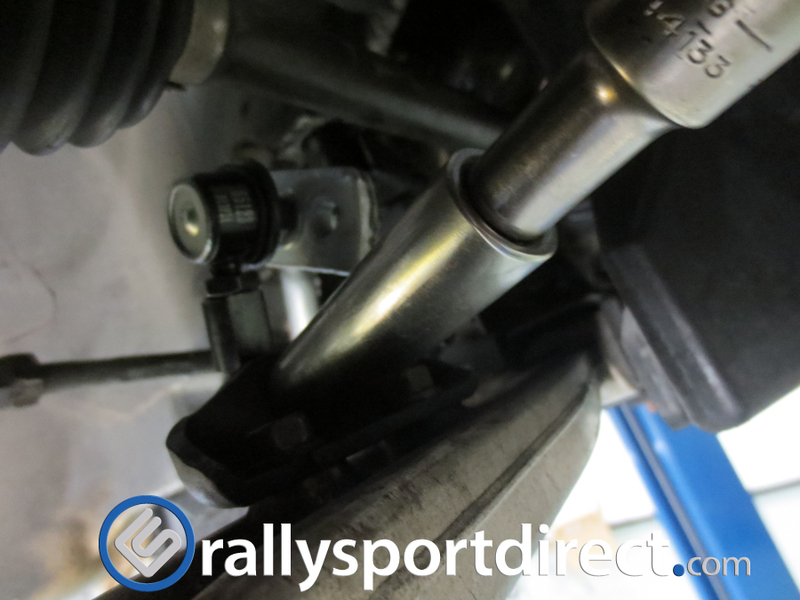 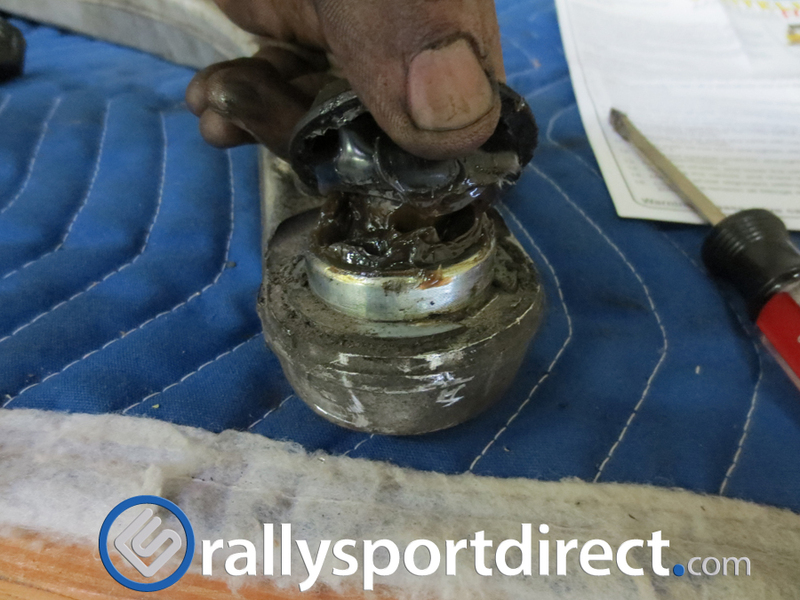 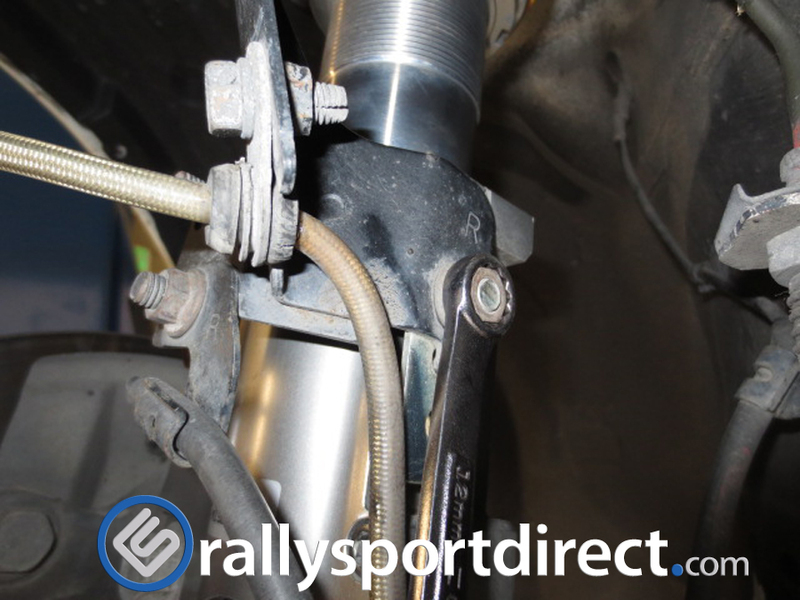 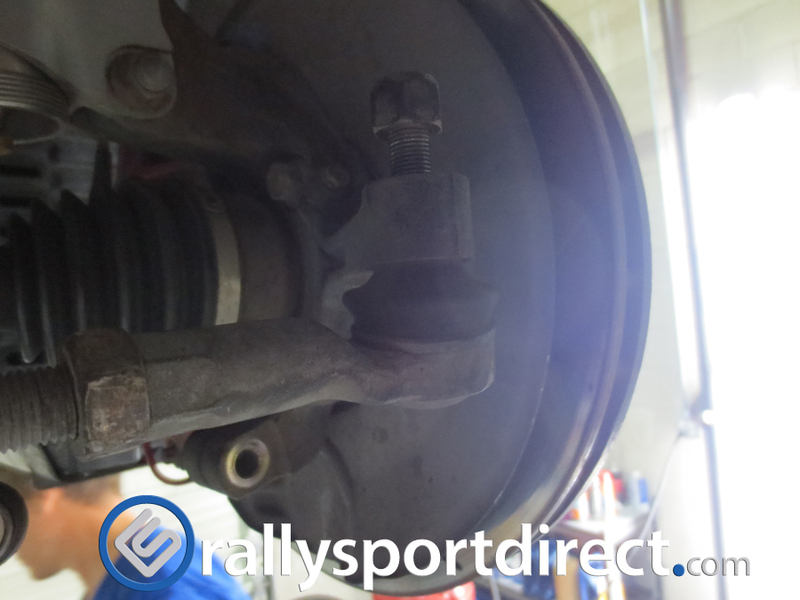 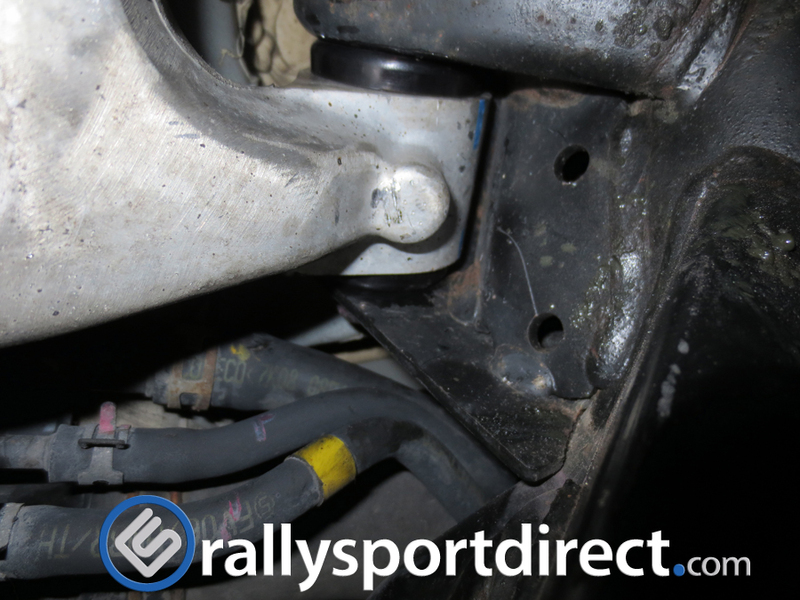 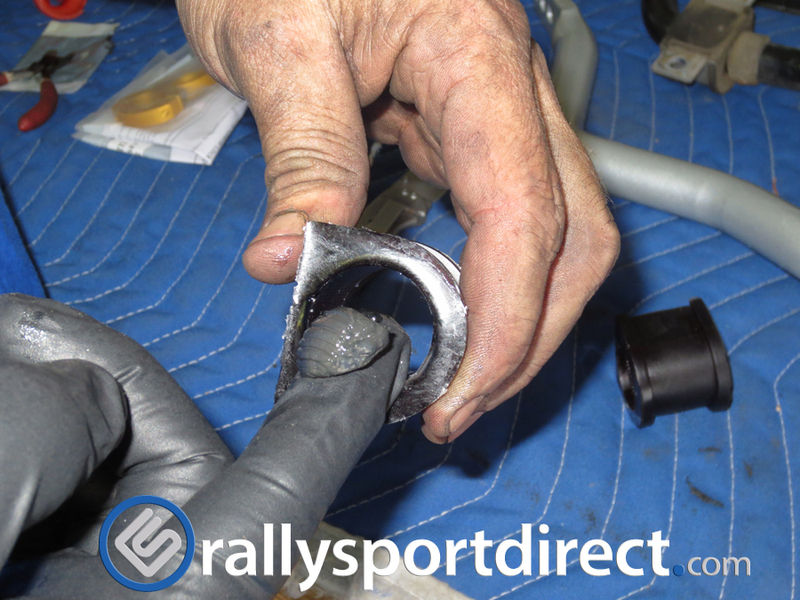 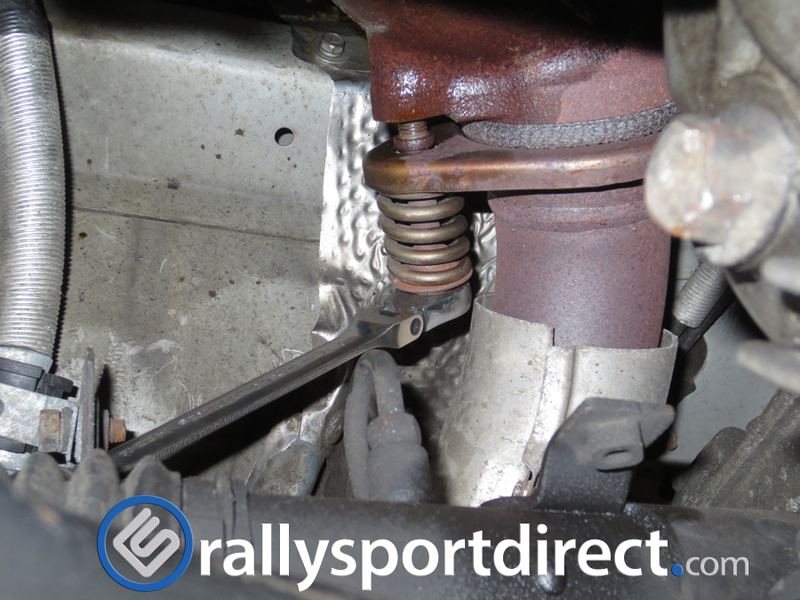 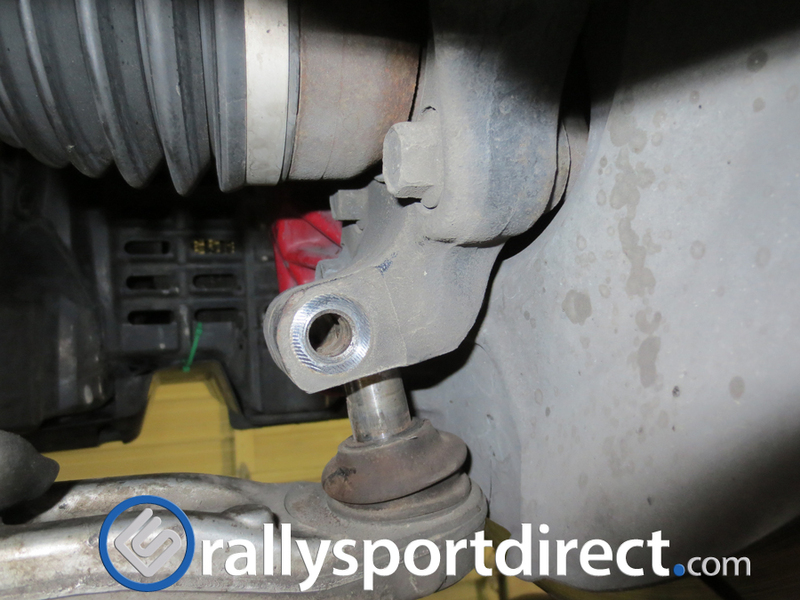 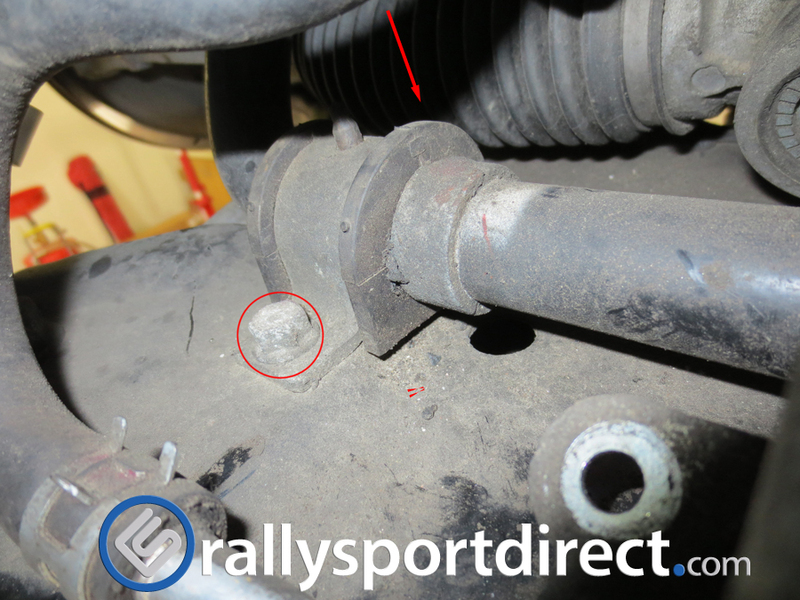 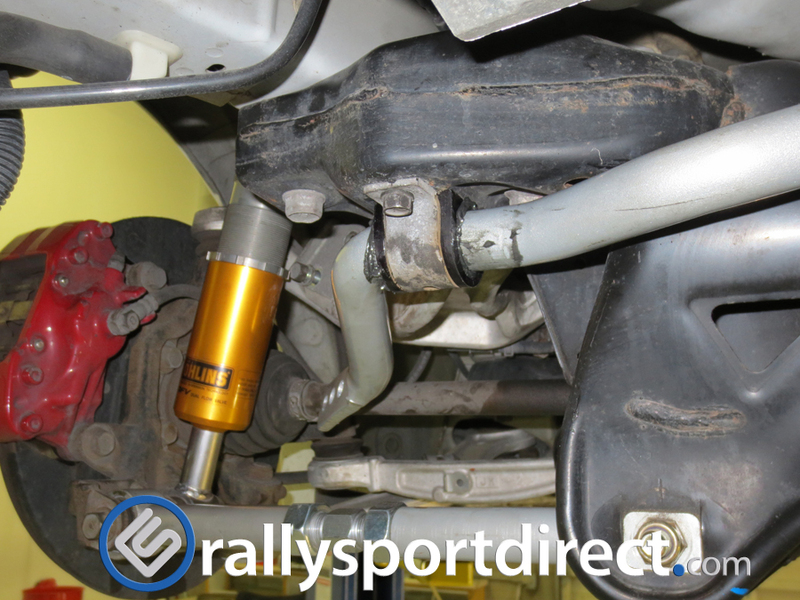 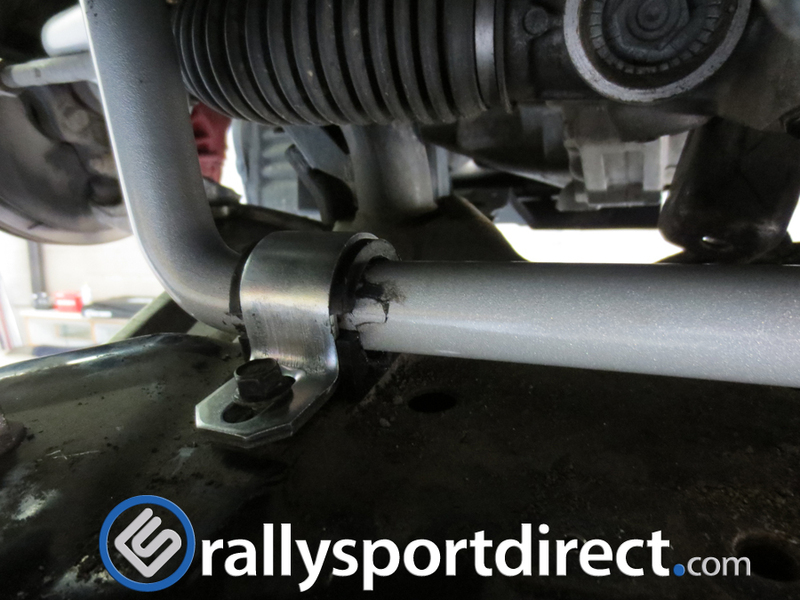 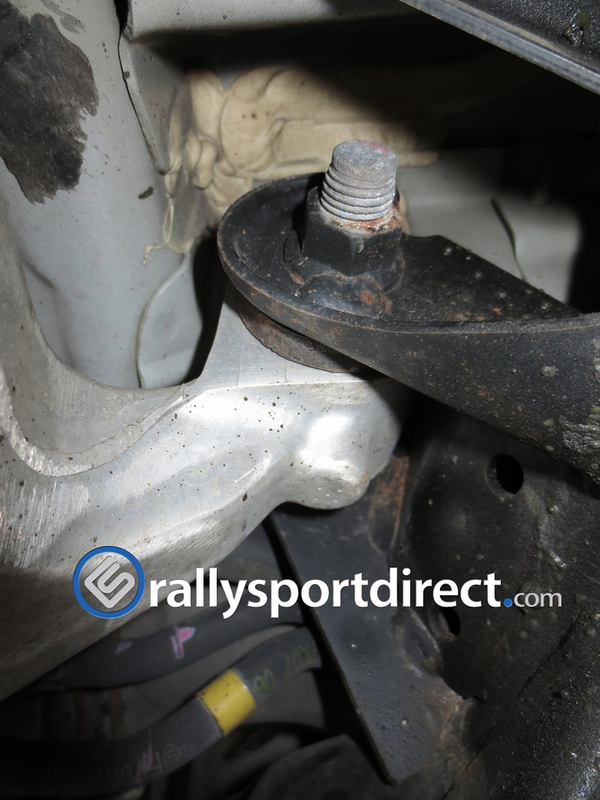 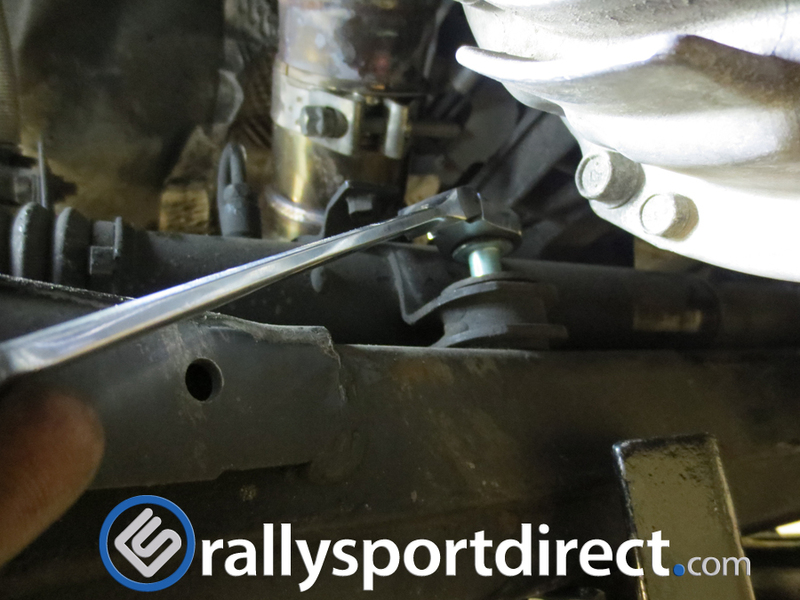 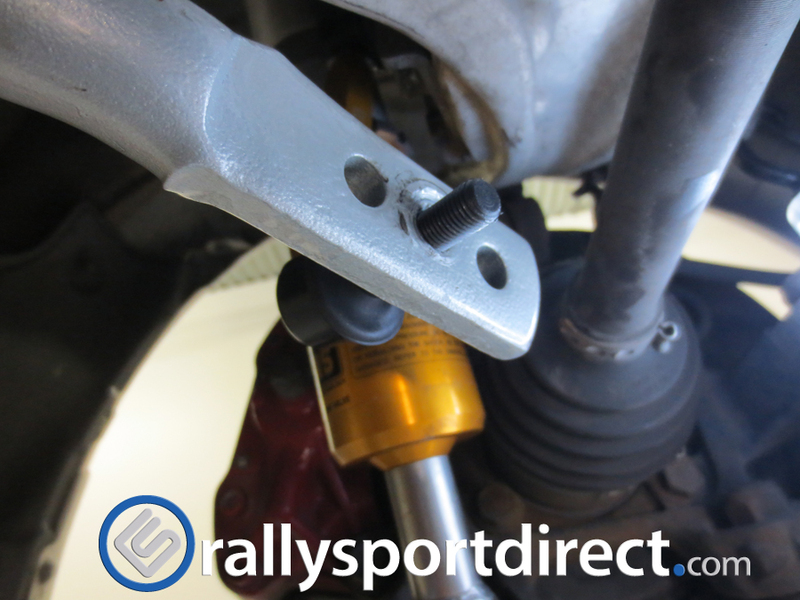 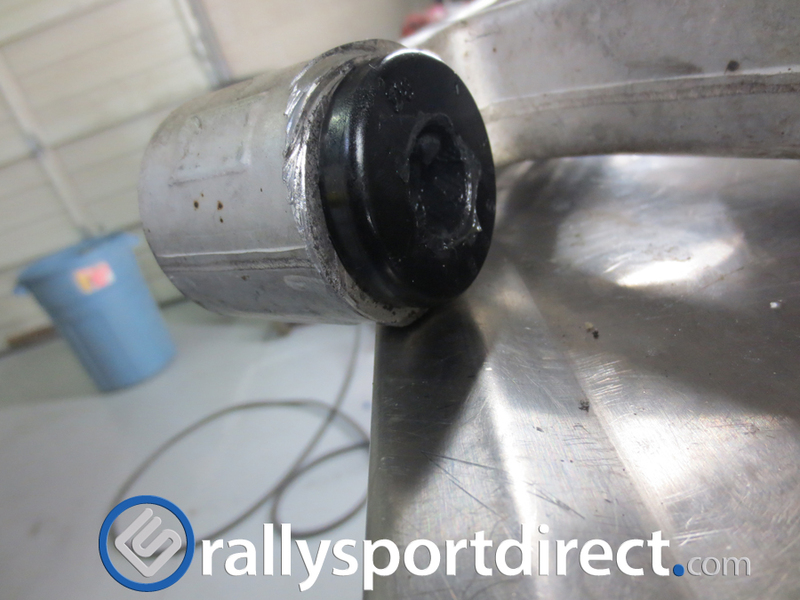 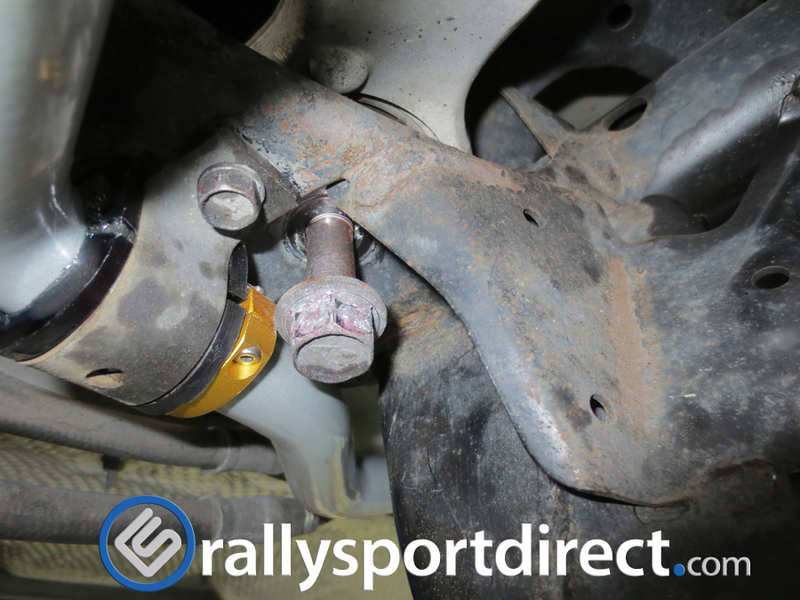 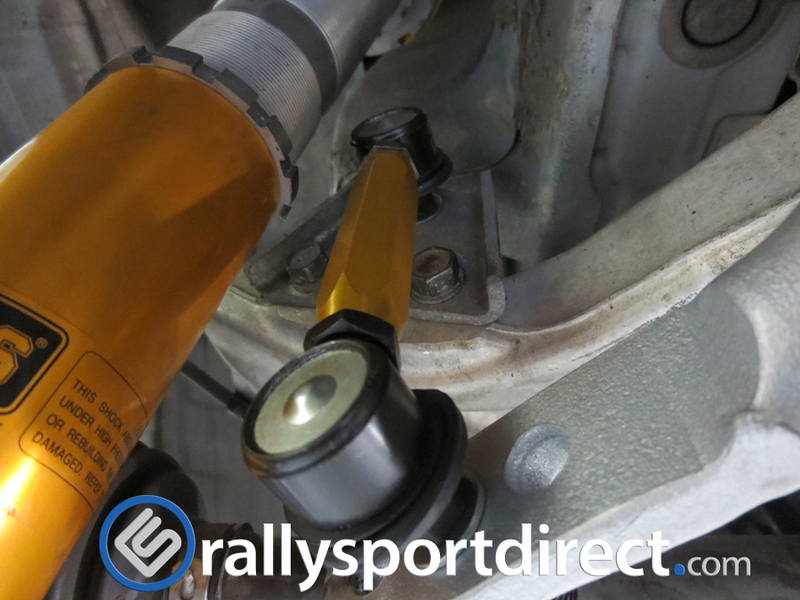 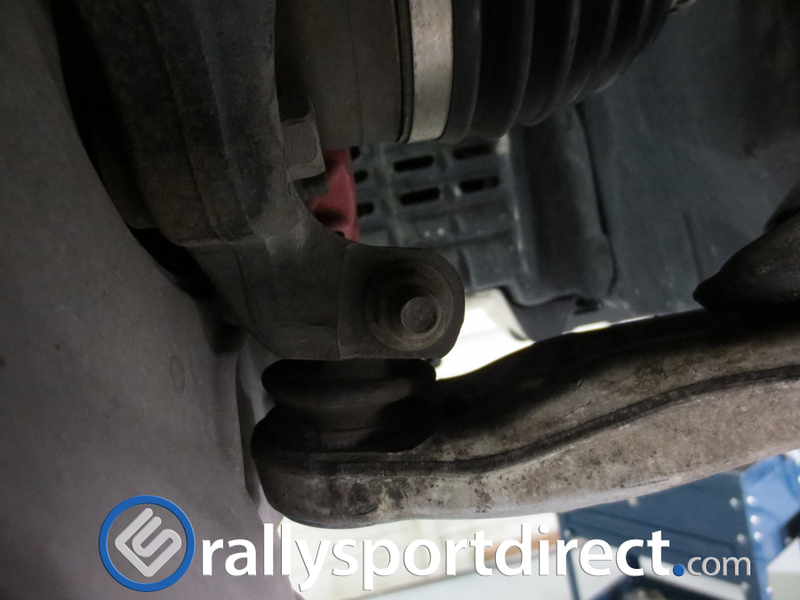 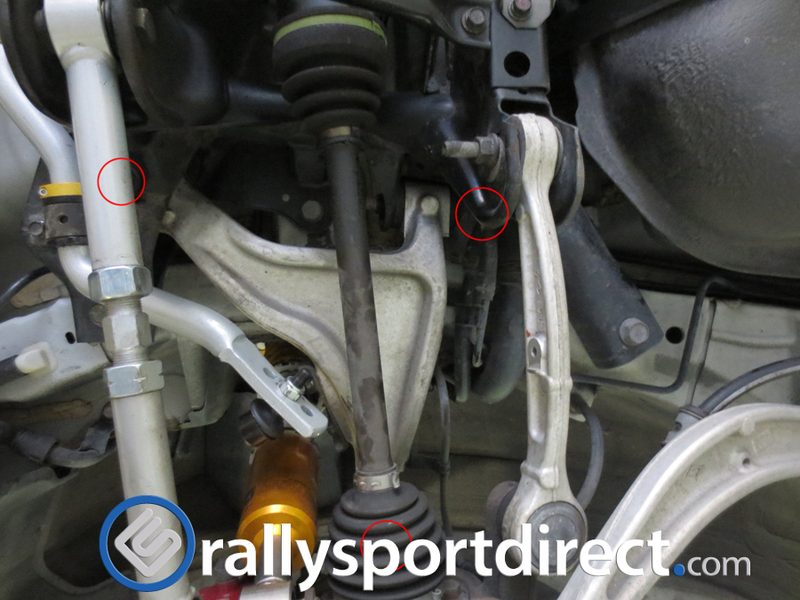 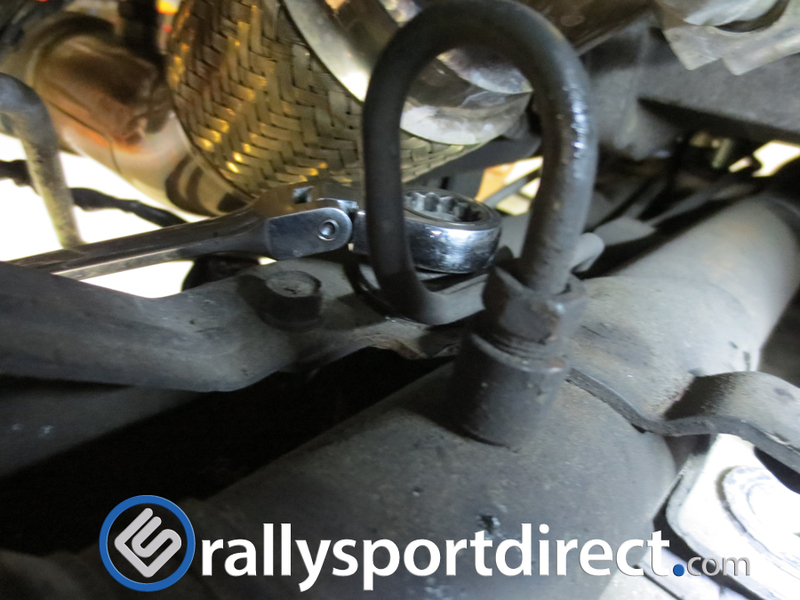 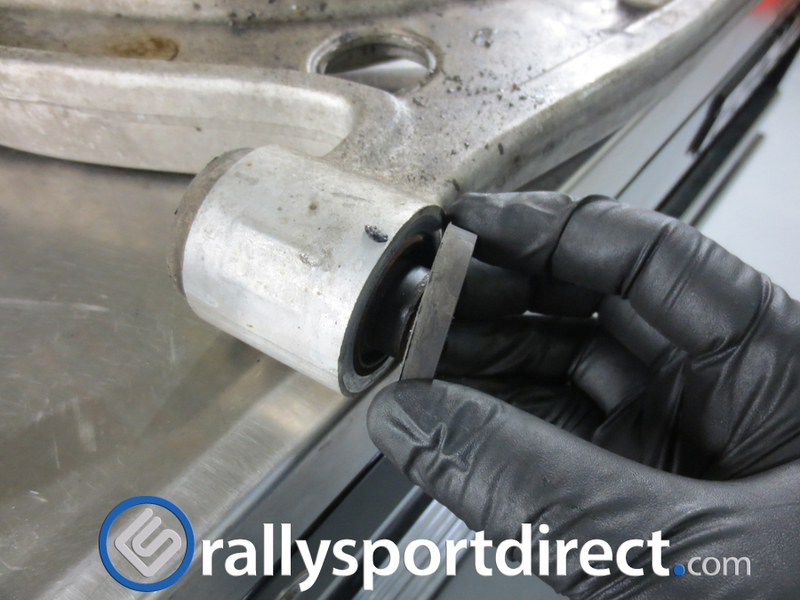 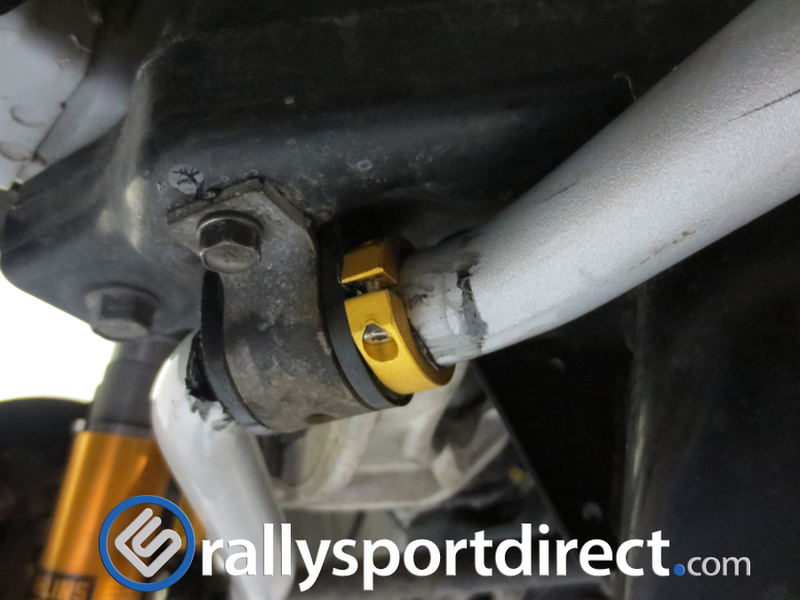 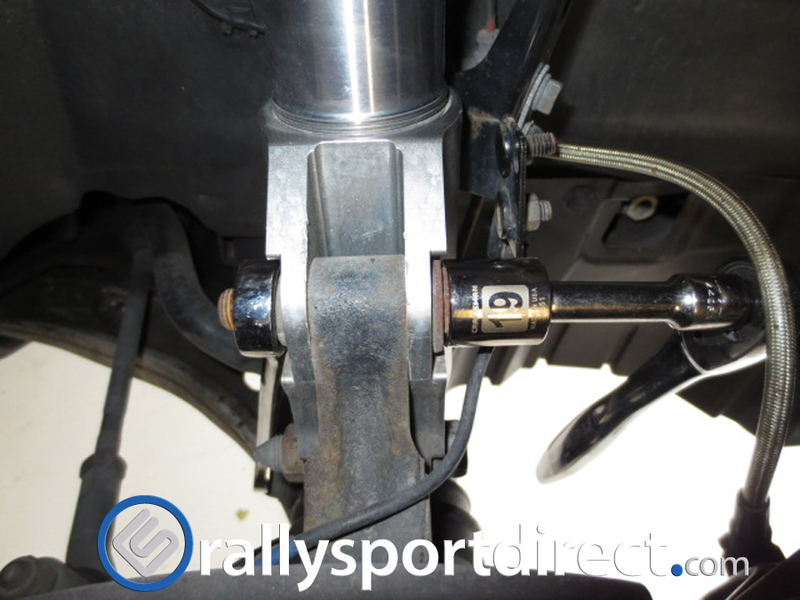 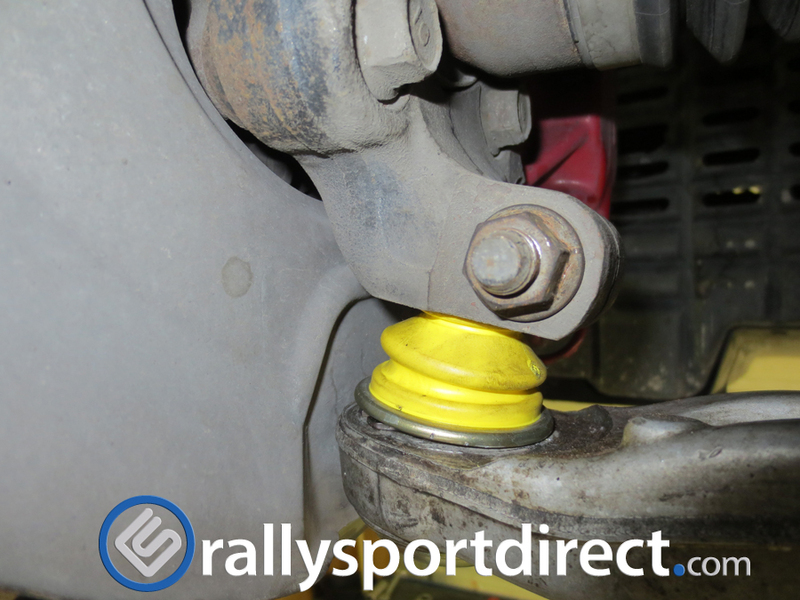 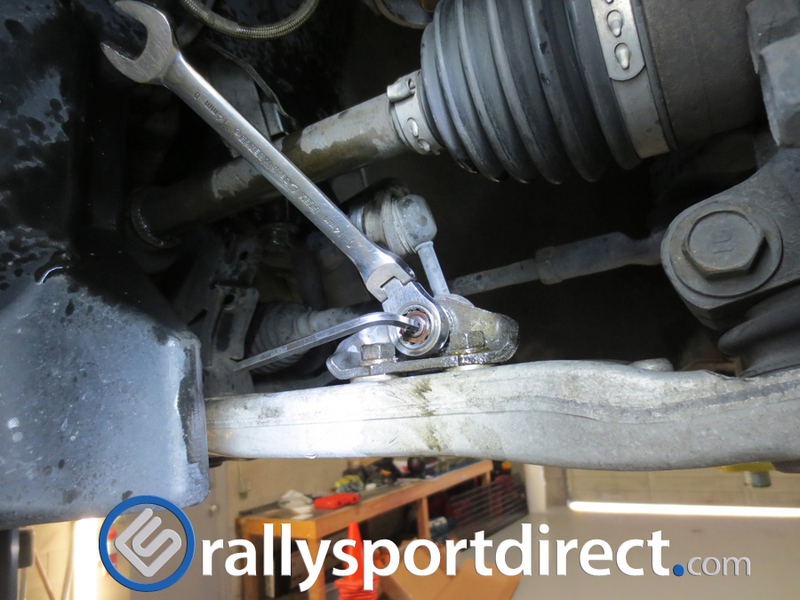 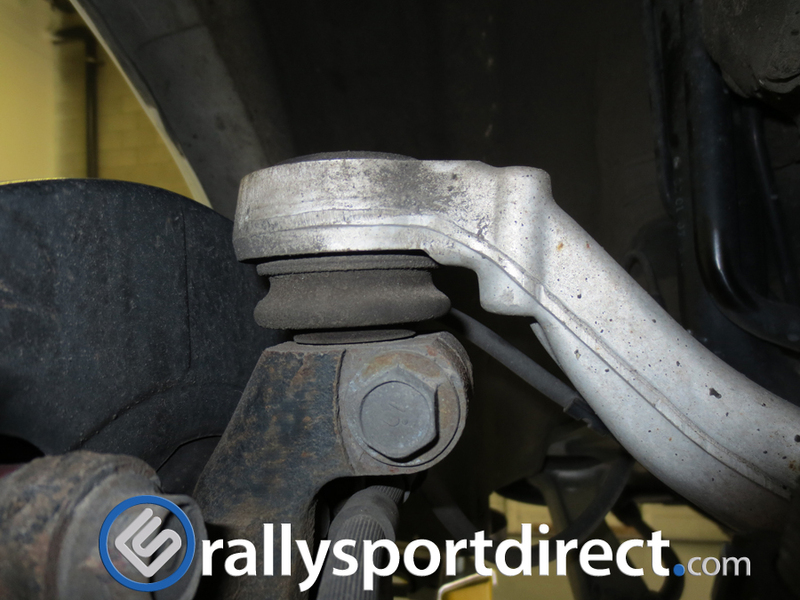 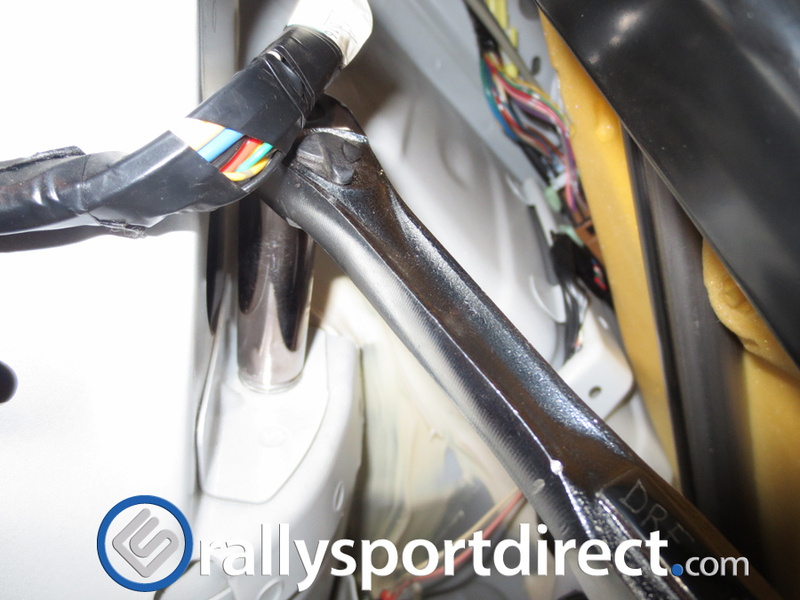 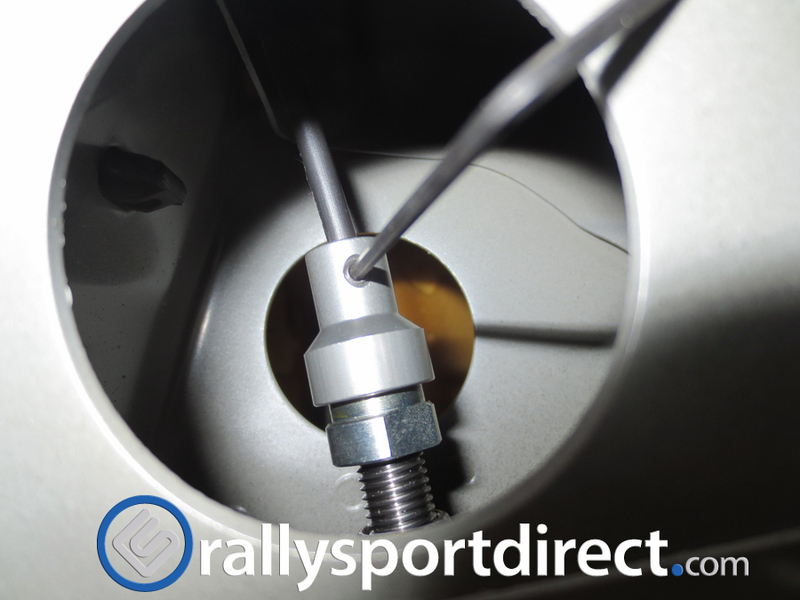 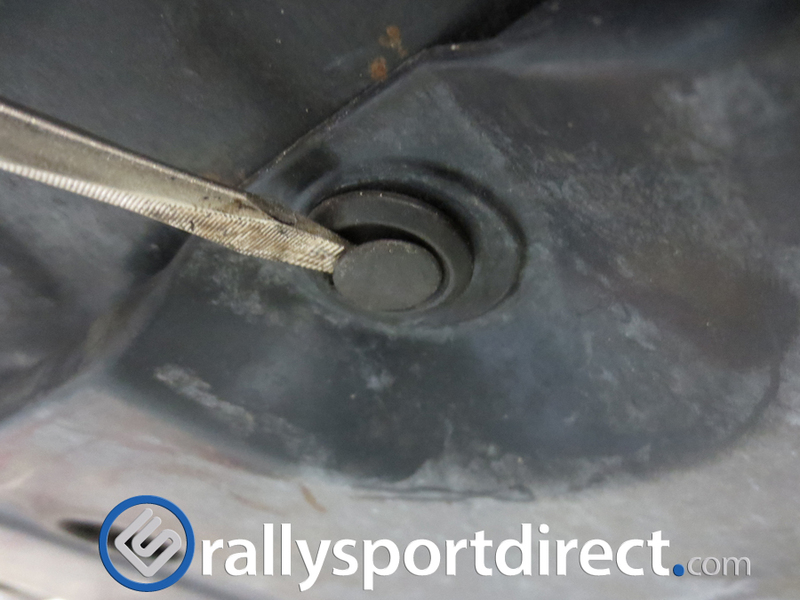 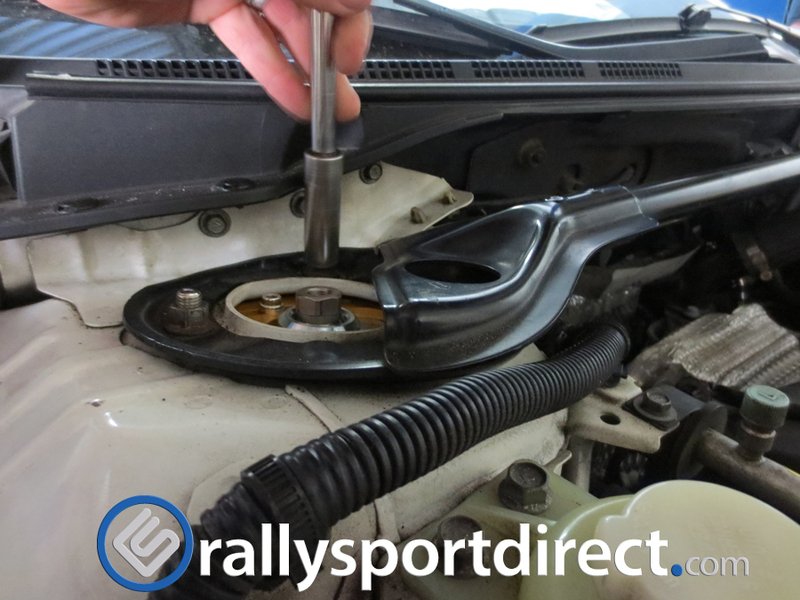 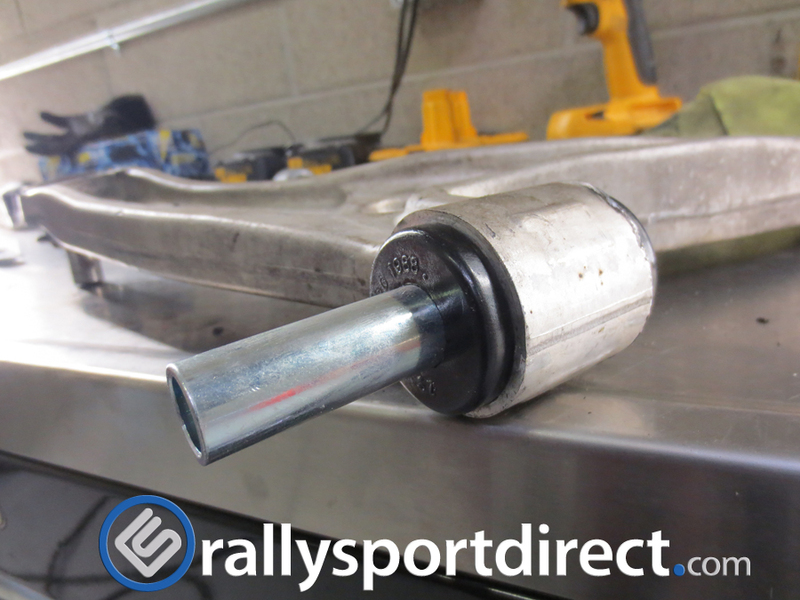 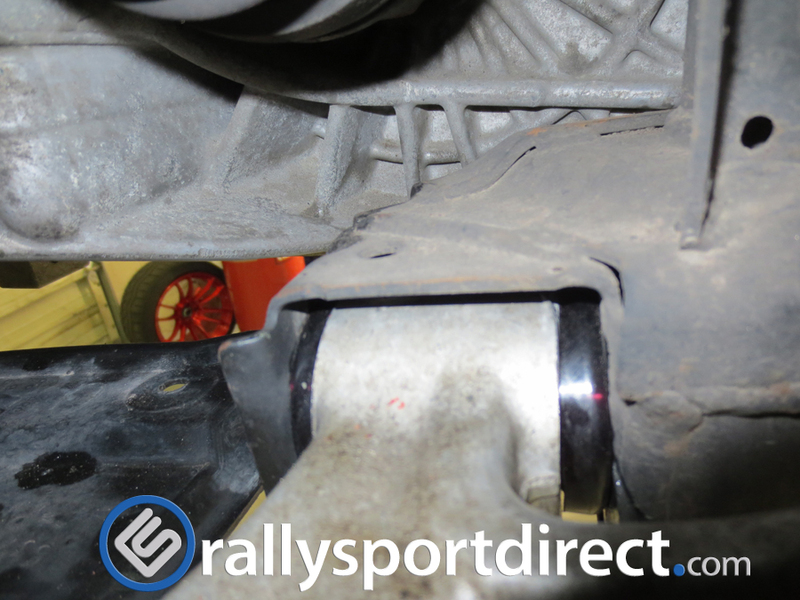 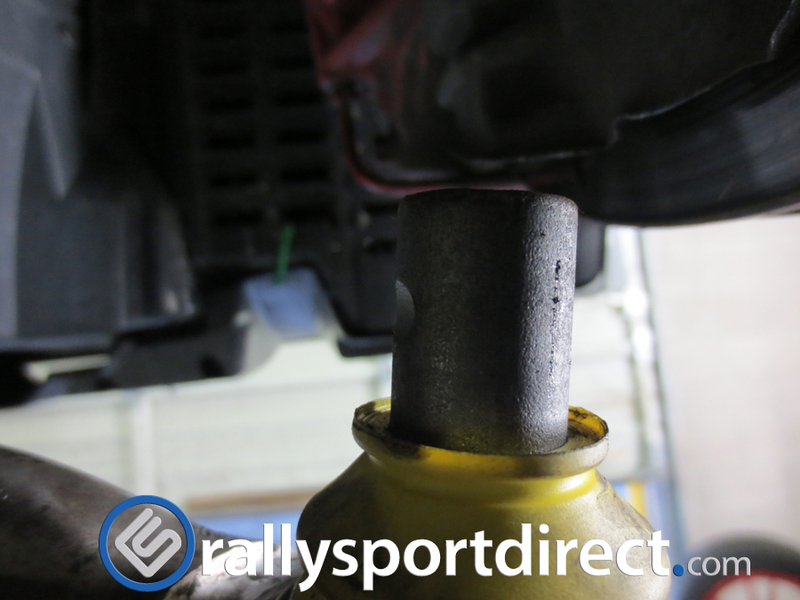 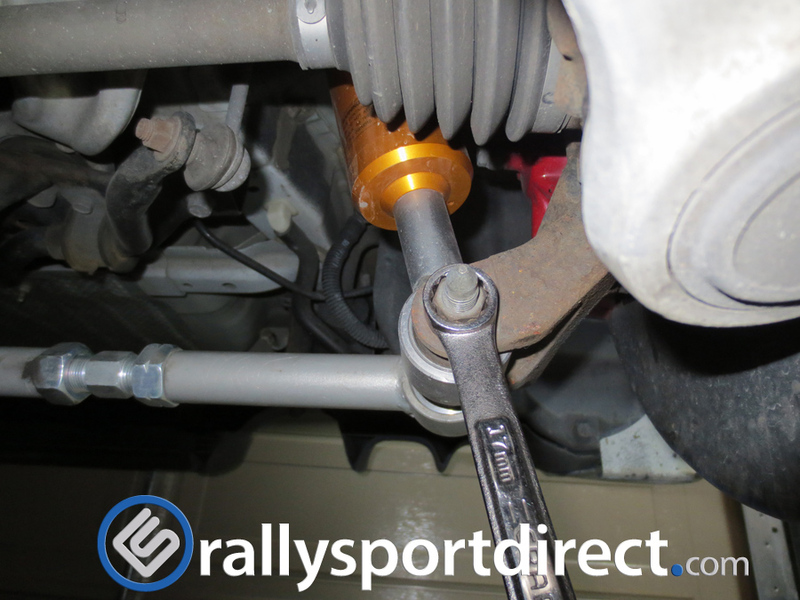 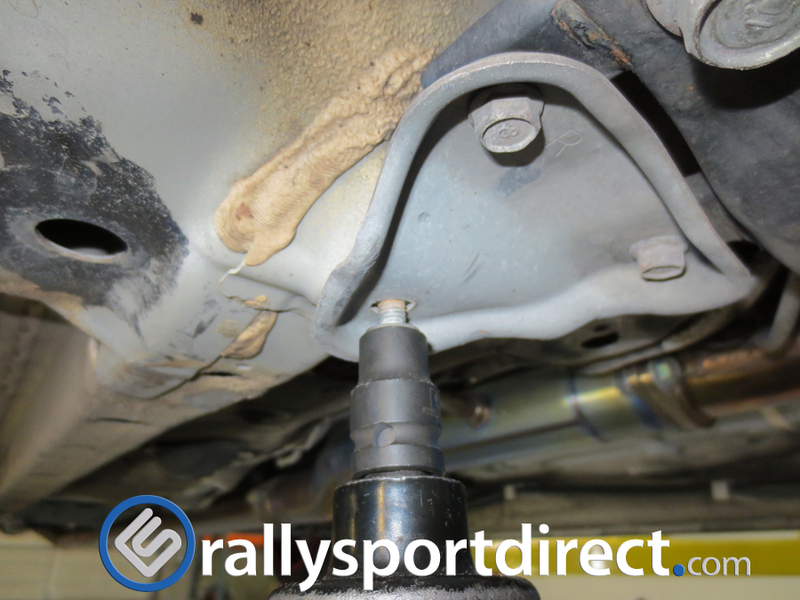 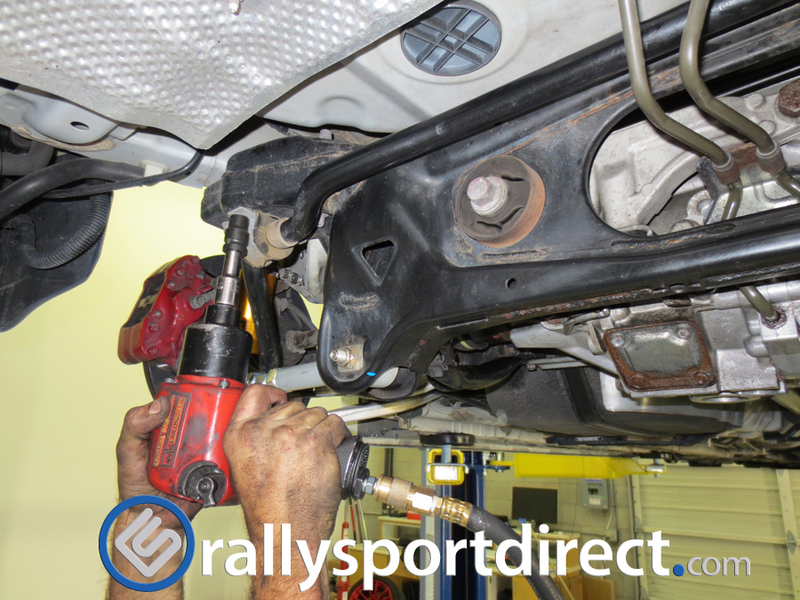 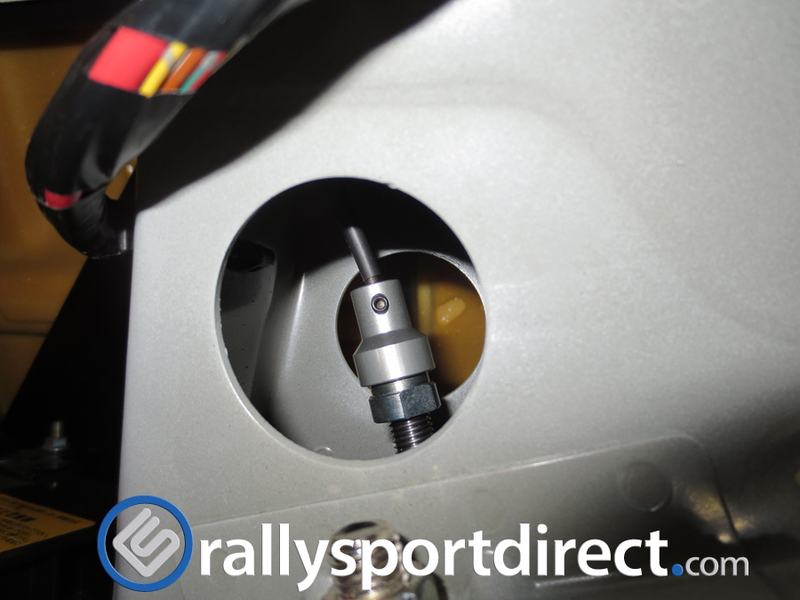 Use a 12mm socket to remove the bolt that holds the exhaust to the hanger. 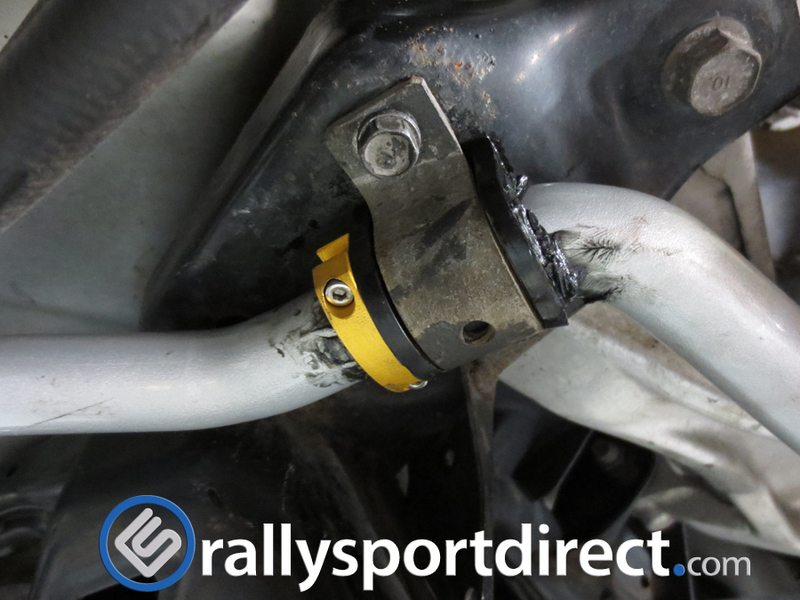 This is much easier than removing the hanger with the exhaust on it. 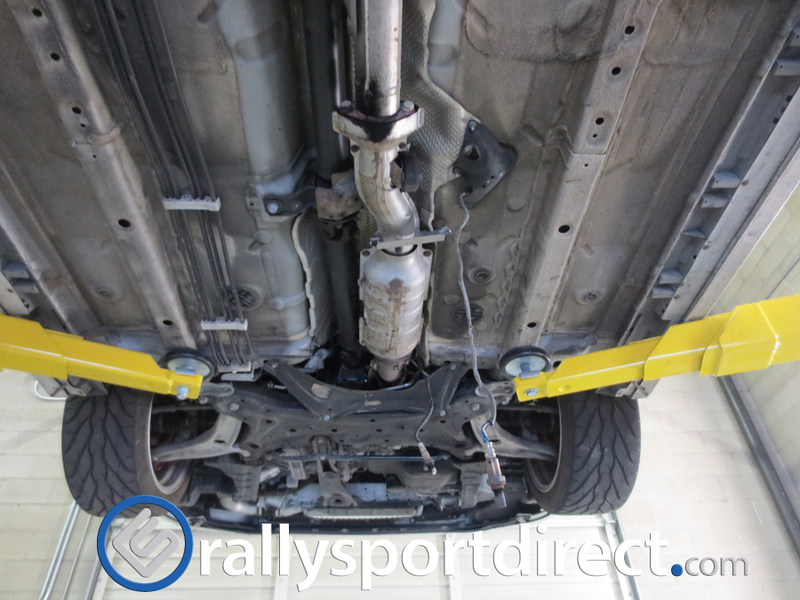 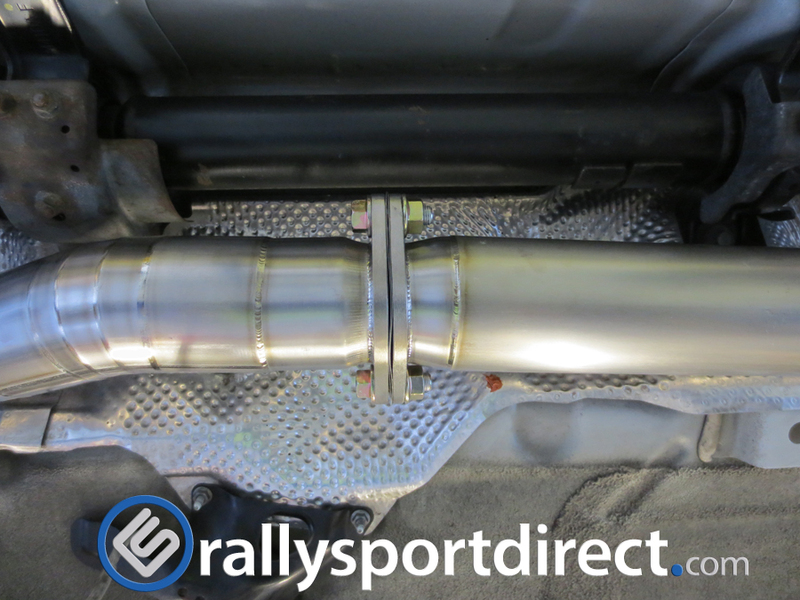 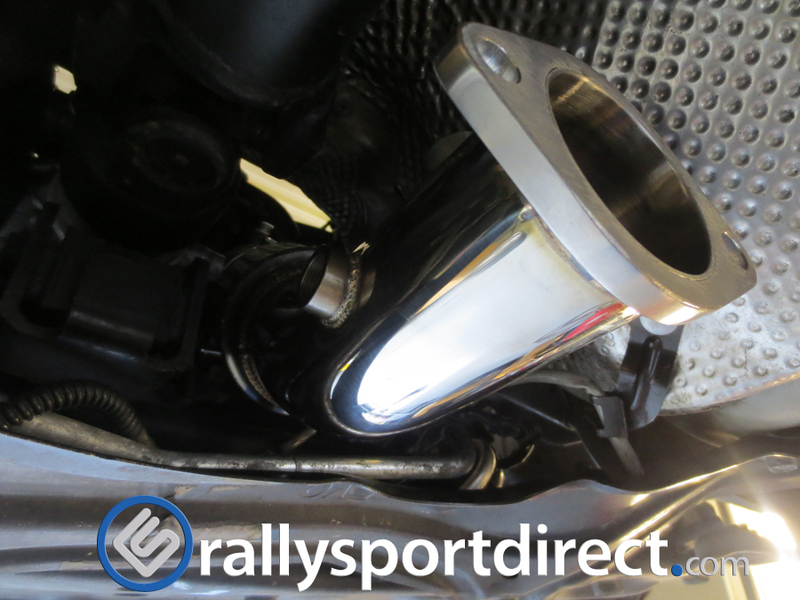 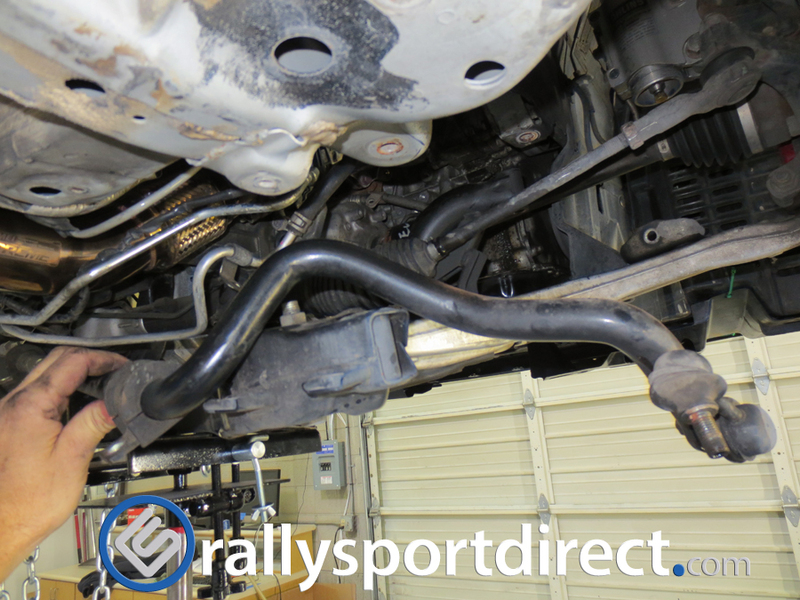 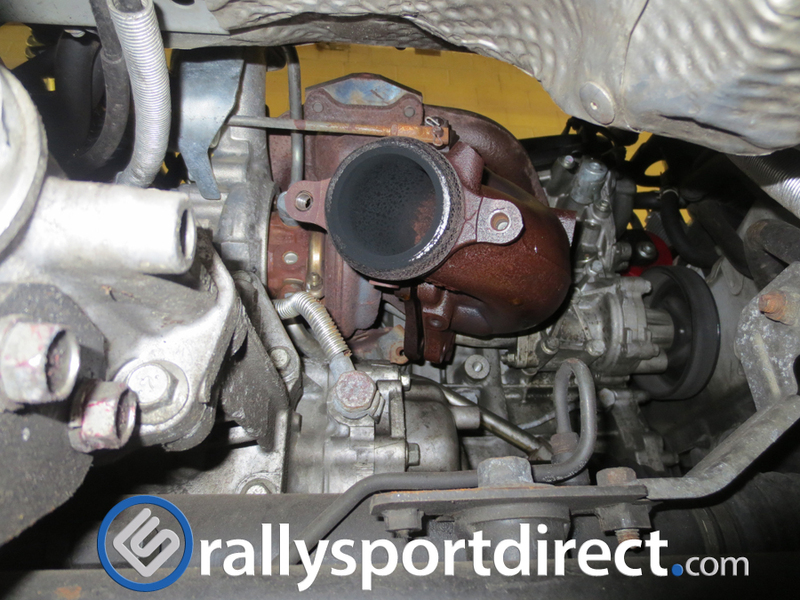 Removal of the lower part of the down pipe will require a 17mm socket or wrench. 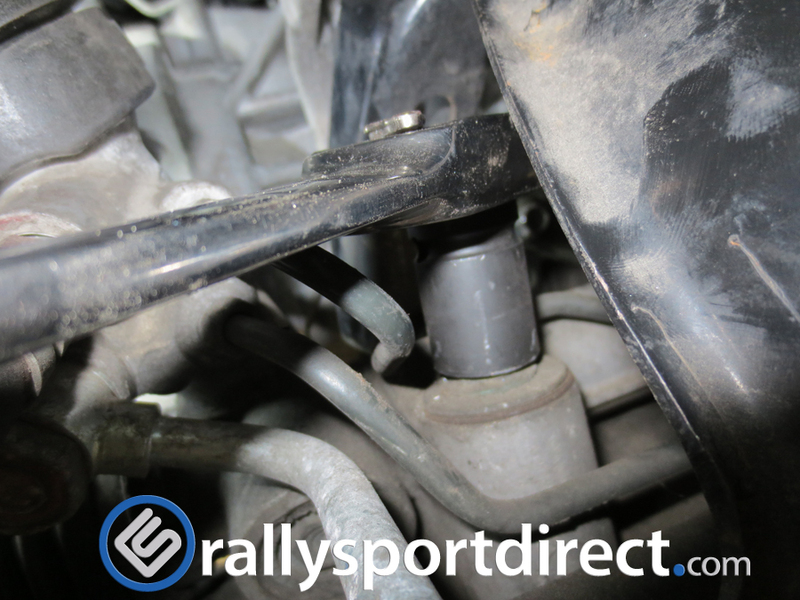 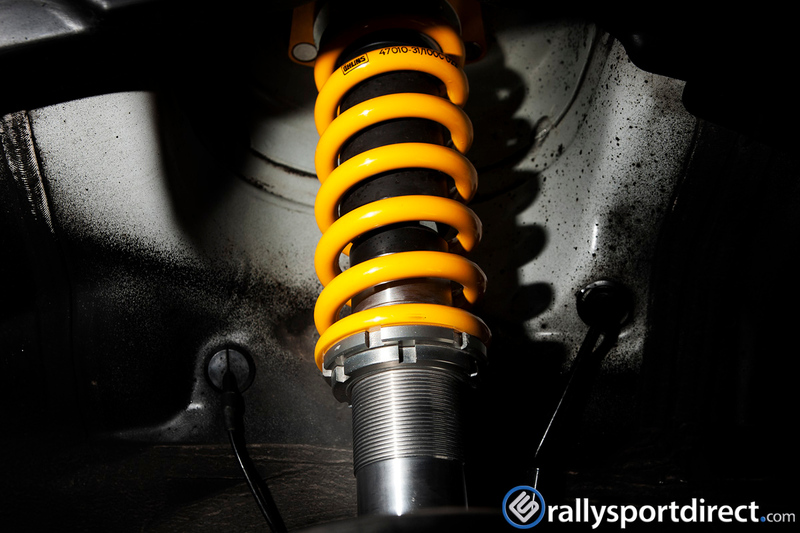 An extension will be needed if using a socket or some maneuvering of your arm to get a wrench onto the two 17mm spring bolts that are holding the lower portion of the down pipe up. 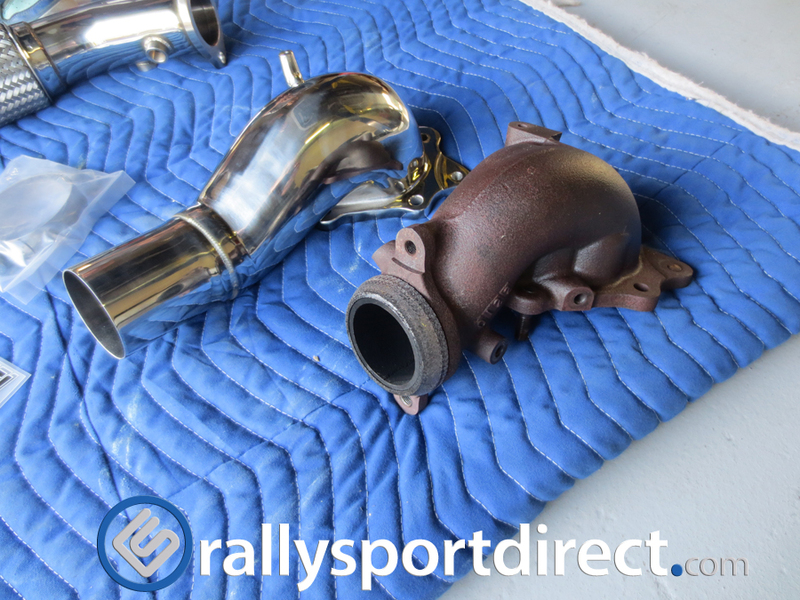 Once you have removed the lower half of the down pipe you will now have more access to the turbo for getting the mouth of the down pipe off. 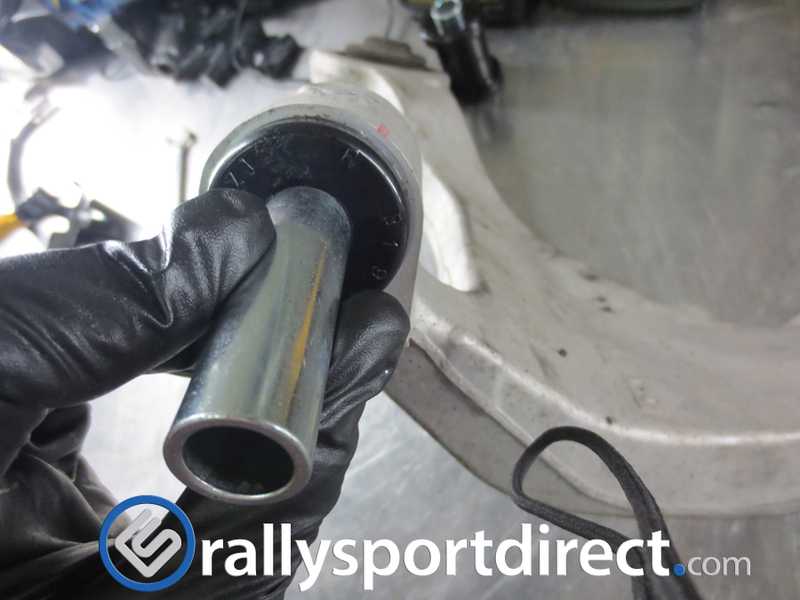 Using a 14mm socket and ratchet carefully remove the 4 bolts holding the down pipe to the turbo. 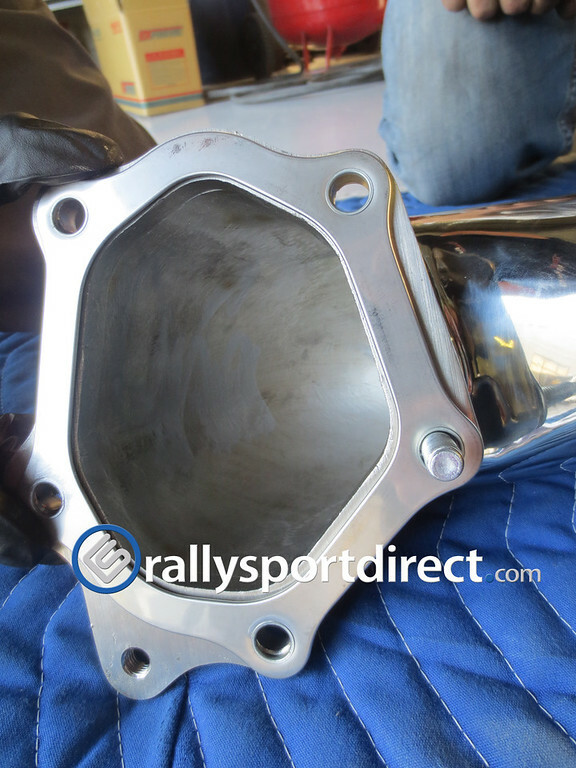 Do not forget the 1 14mm nut on the bottom back side of the housing. 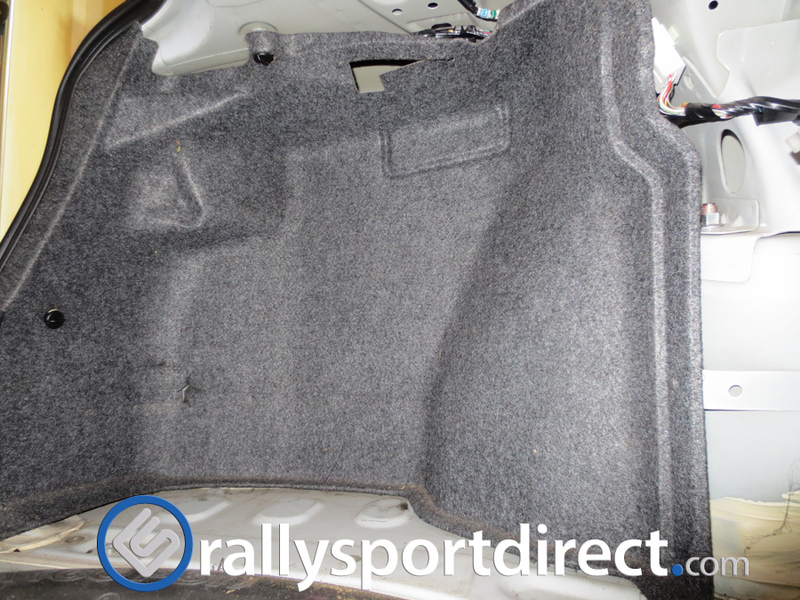 Its hard to see from up top, but its on the lower back side and can get to it from the bottom. 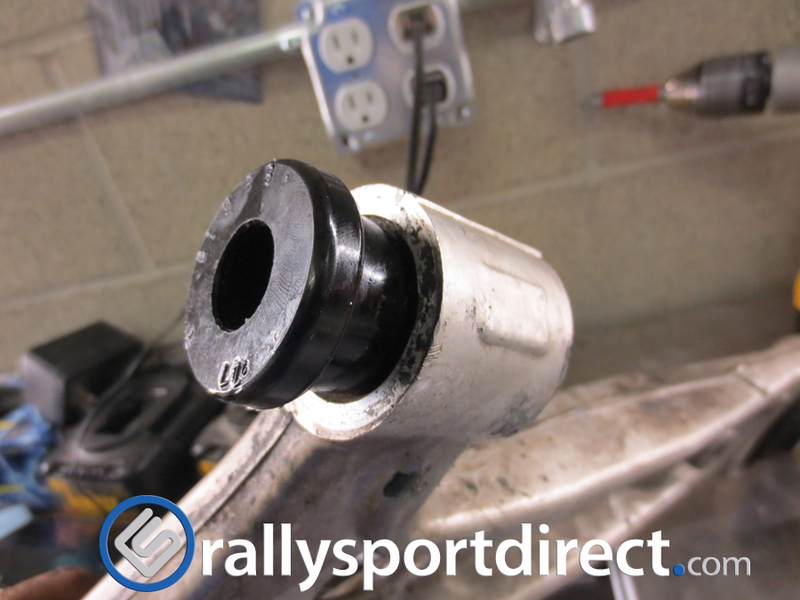 Once you undo all of the bolts you will need to pull this portion of the down pipe out through the top of the motor. 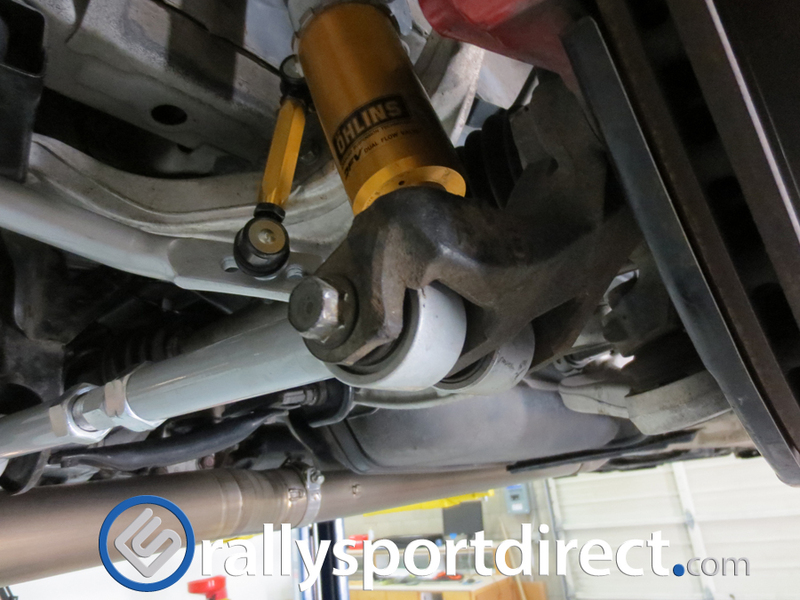 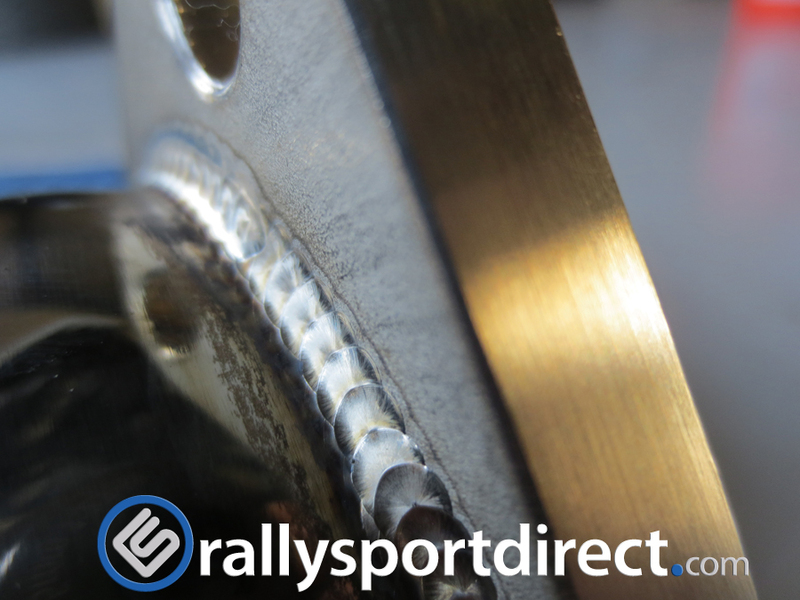 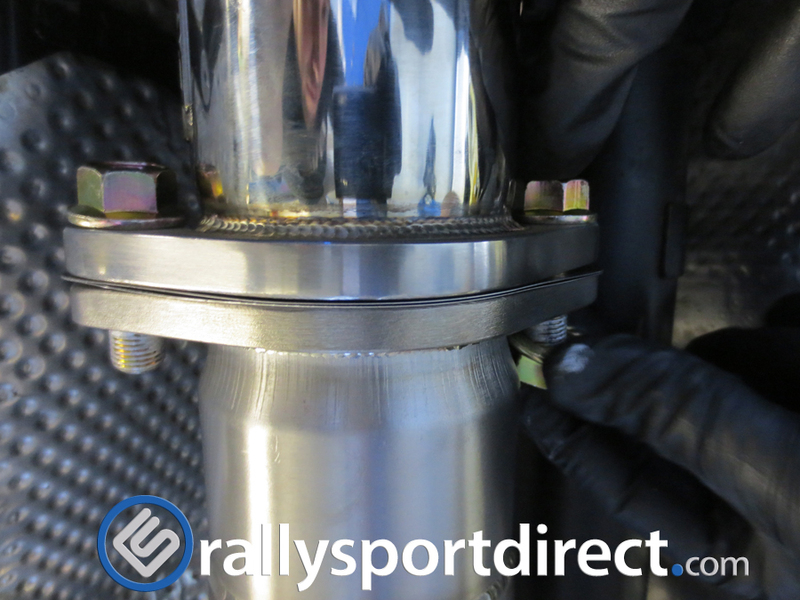 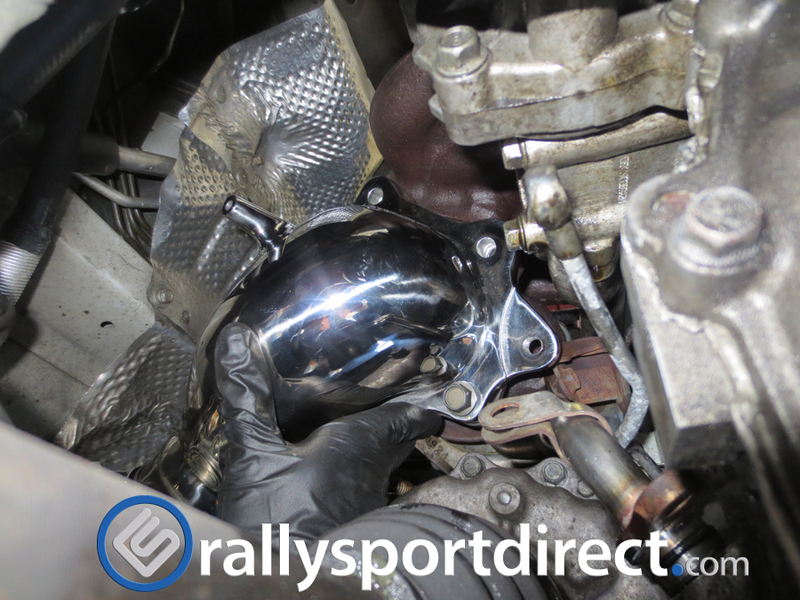 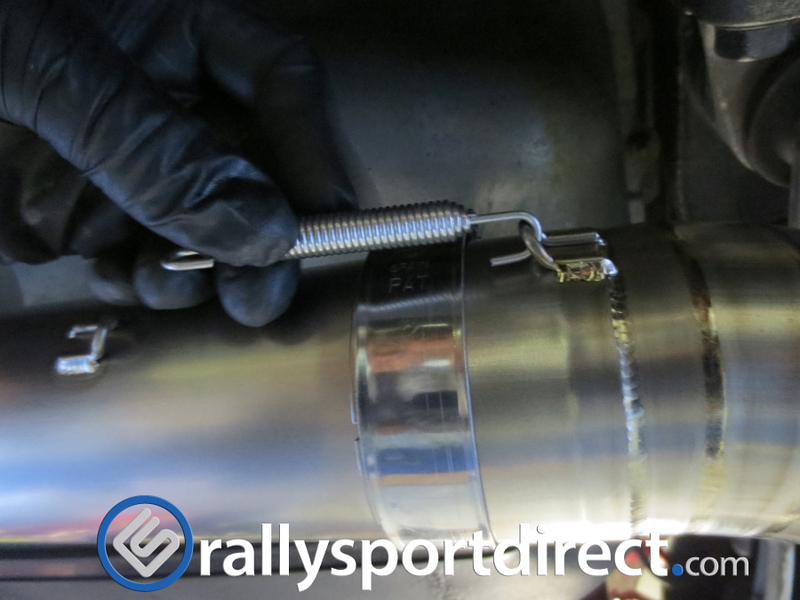 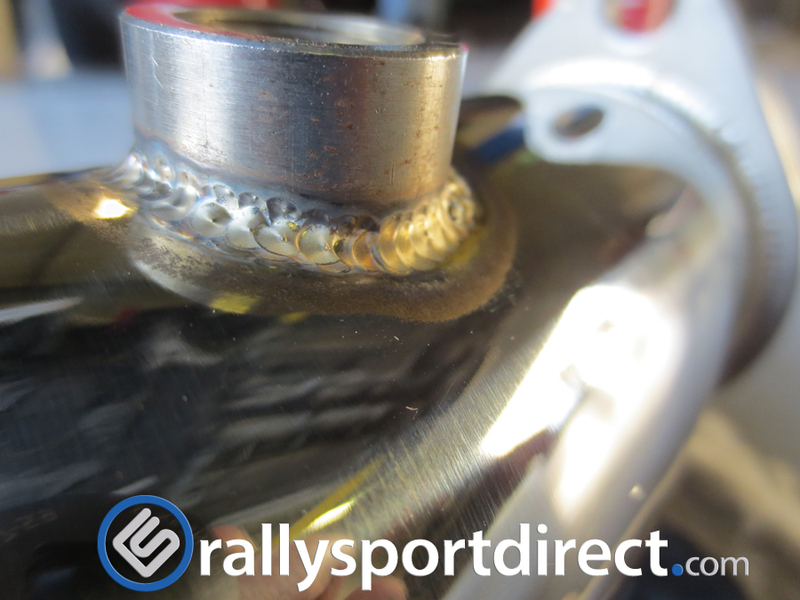 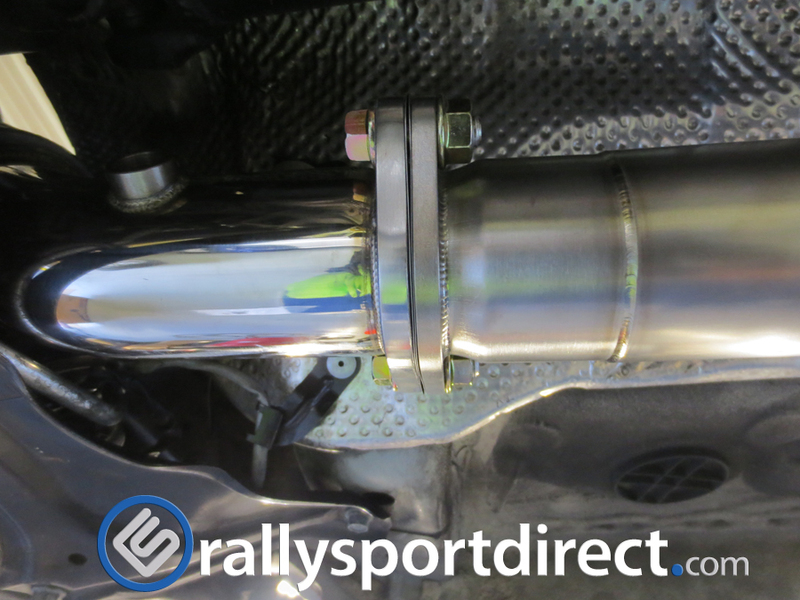 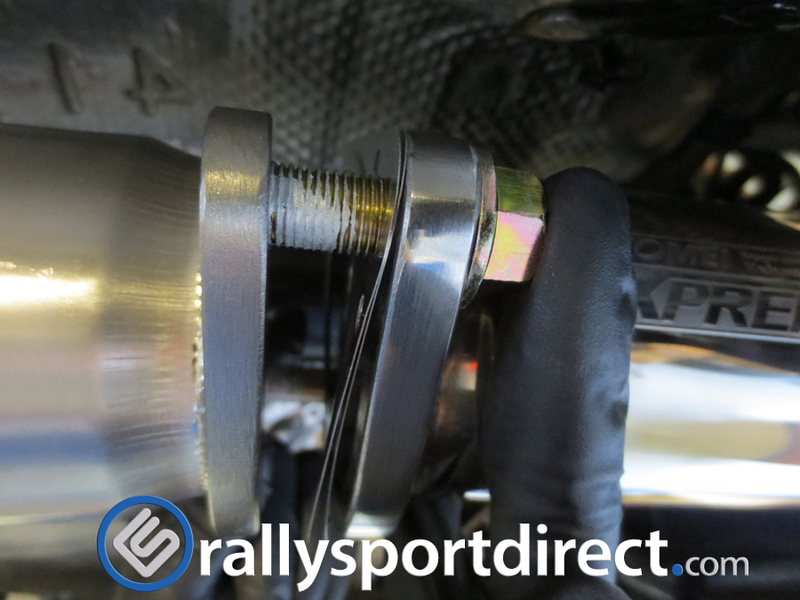 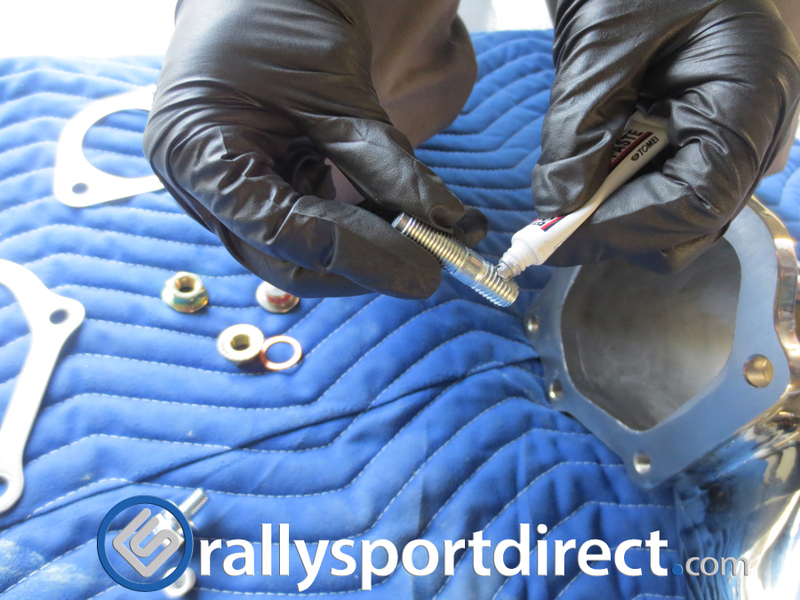 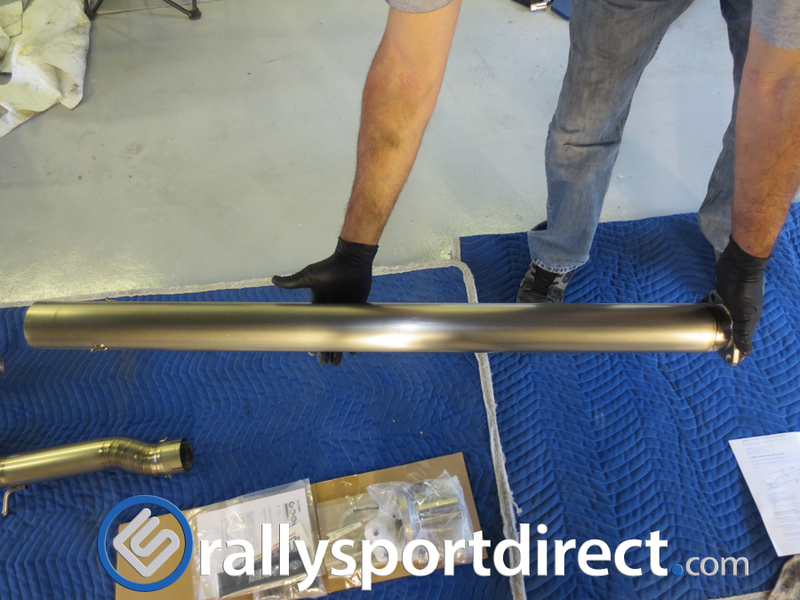 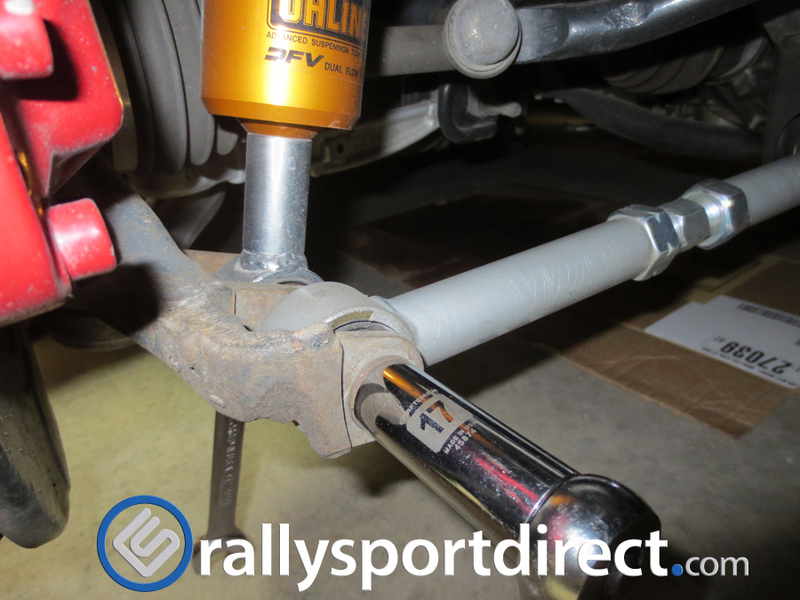 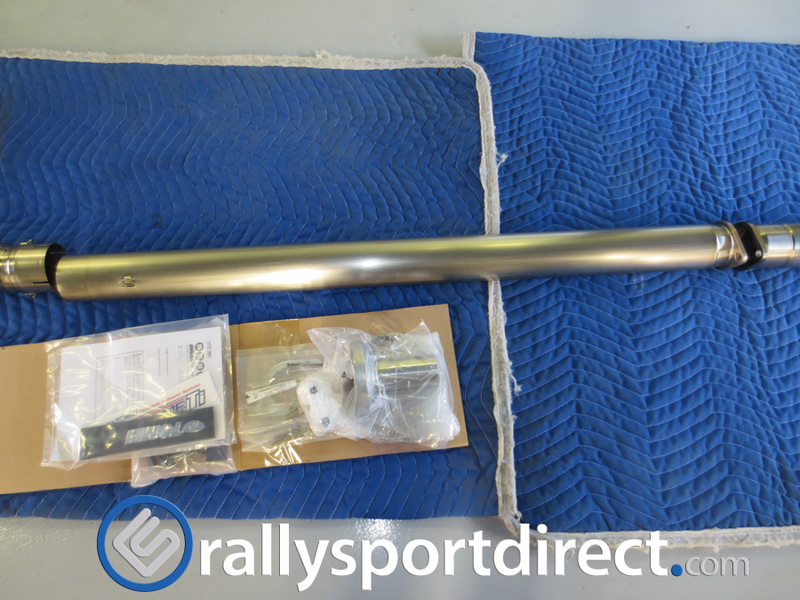 Using the provided Tomei Bolt-Smooth-Paste apply this to new stud provided with the new Tomei Down Pipe. 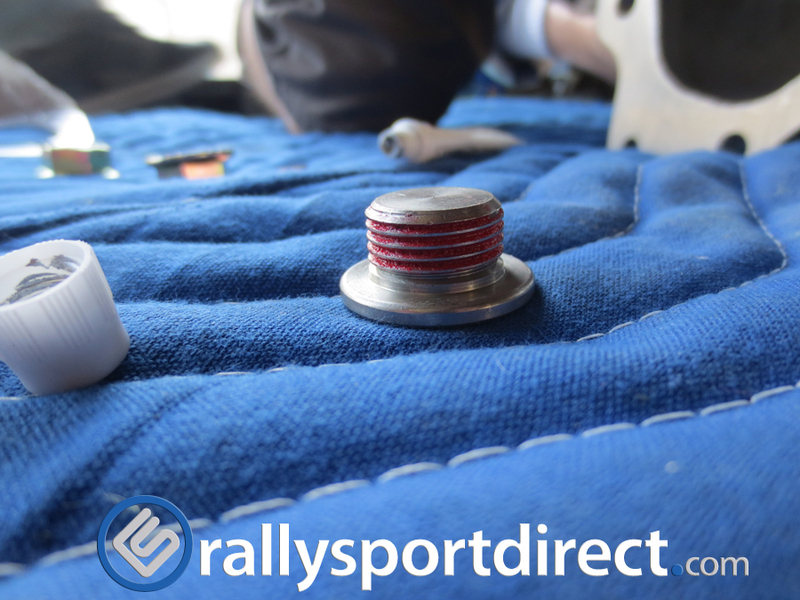 A little bit on the threads is all that is needed. 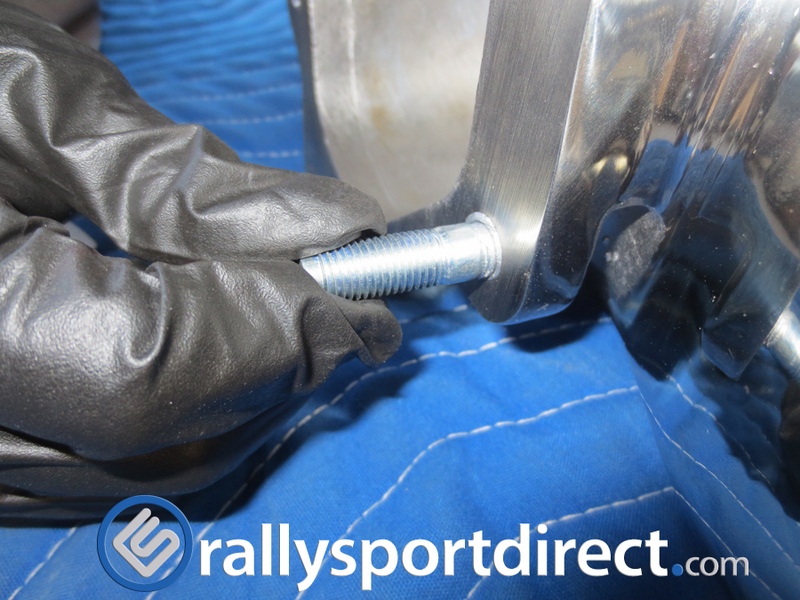 Spread this evenly over the threads and do this for all the studs and bolts. 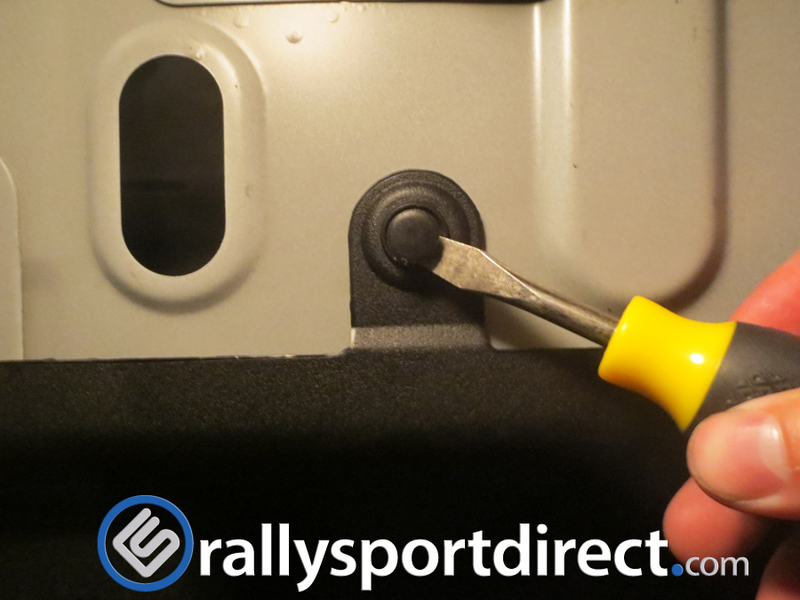 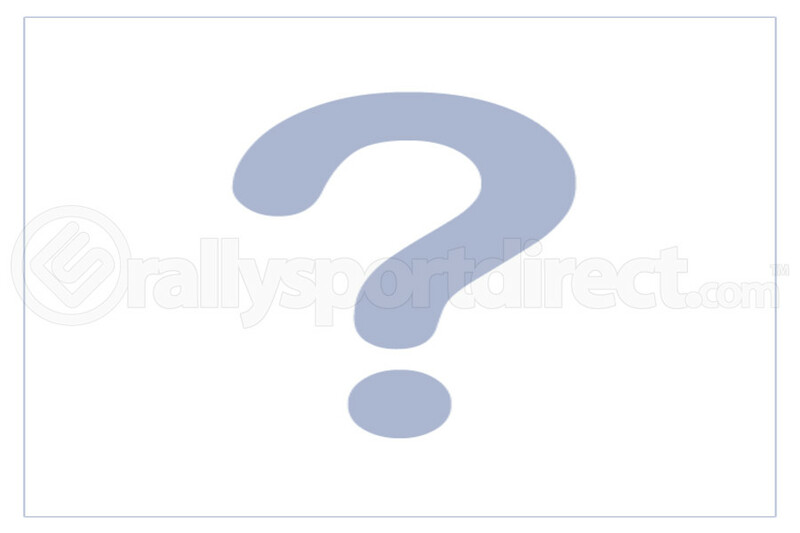 This will make life easier down the road if needed to remove in the future. 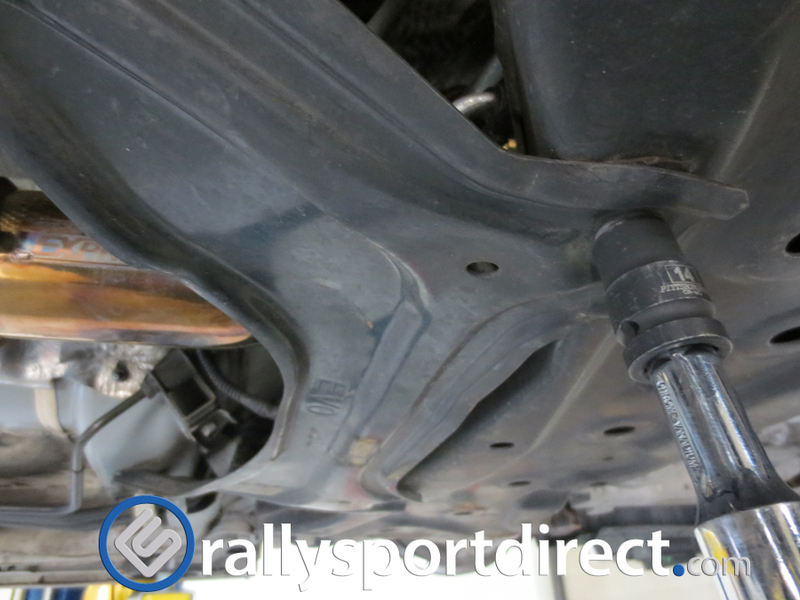 Install the lower stud into the down pipe. 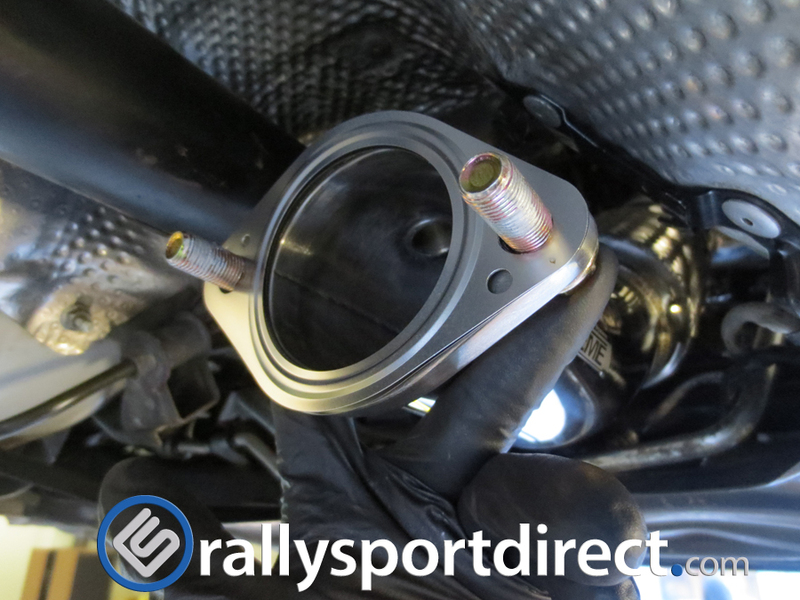 This will help guide the down pipe onto the turbo and hold the new provided gasket in place. 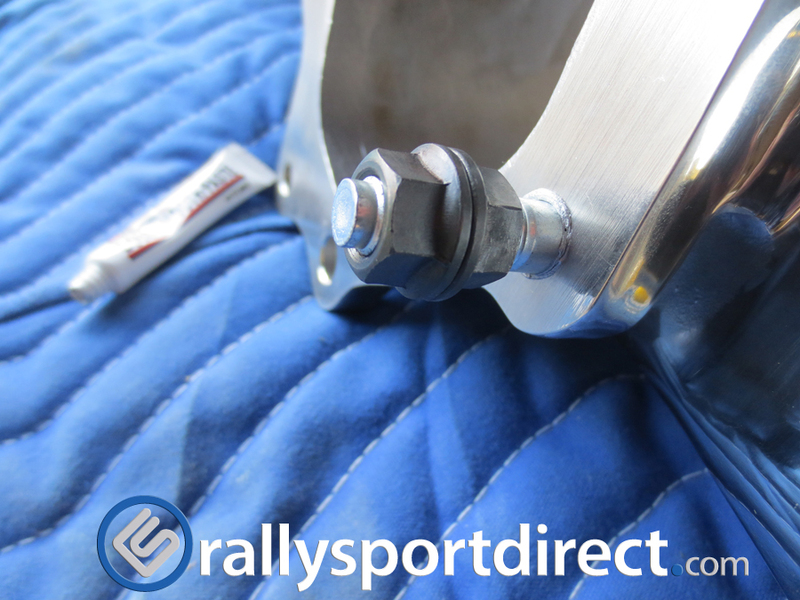 Use two nuts installed on the stud like show below to tighten the stud into the down pipe. 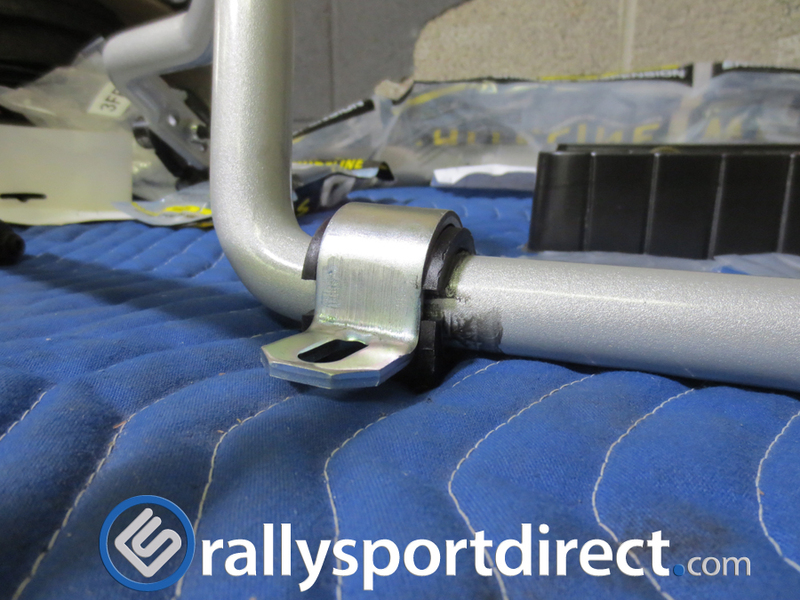 Slide the the two parts of the down pipe together with the provided clamp on. 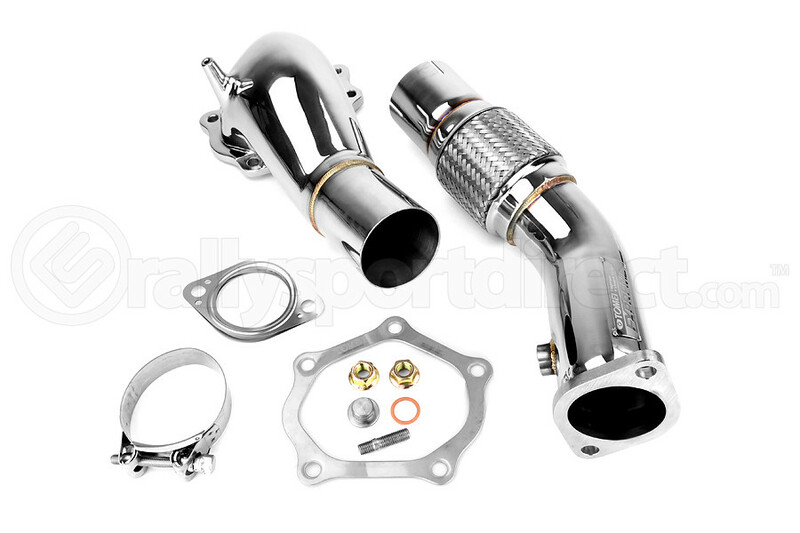 Tomei has thought ahead for you and made their down pipe with a 2nd O2 bung for those running a AFR sensor on their cars. 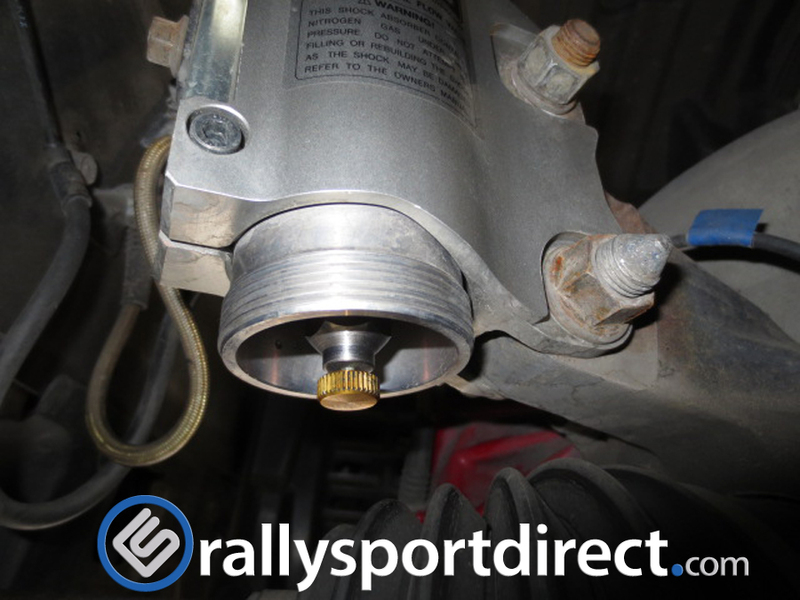 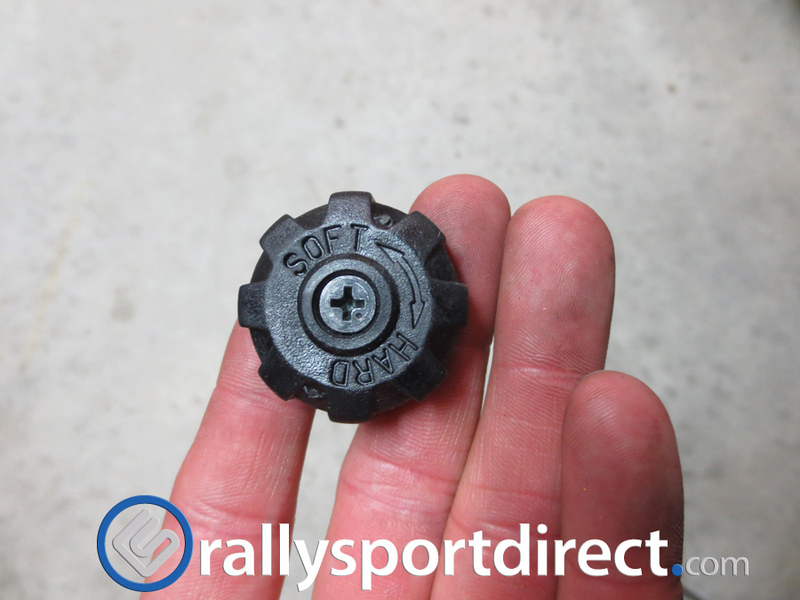 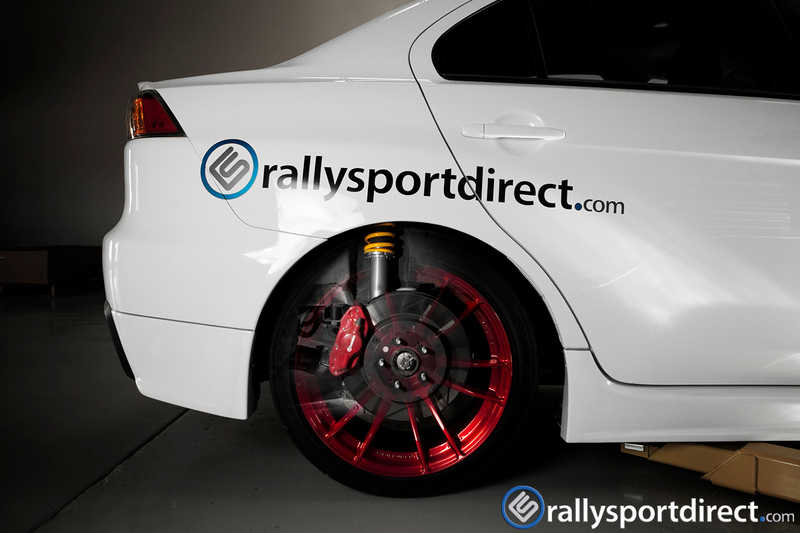 If your car is not running a AFR sensor no worries. 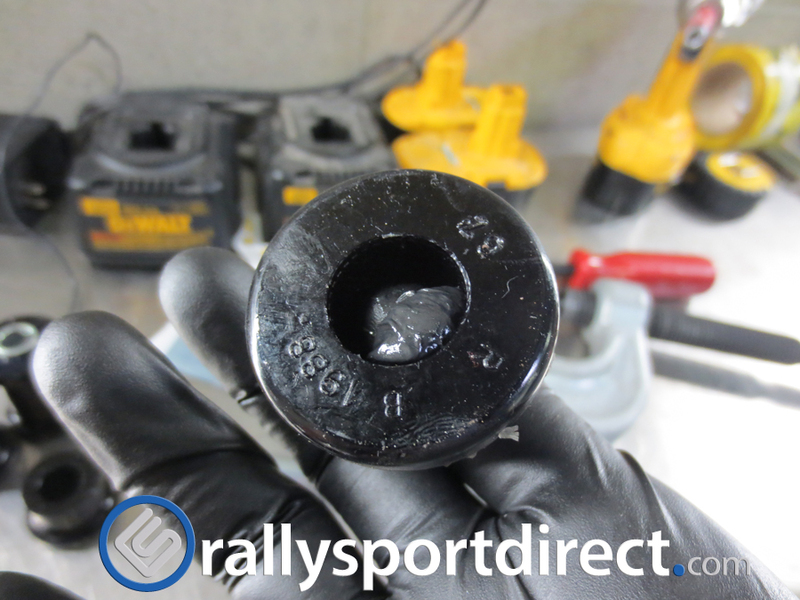 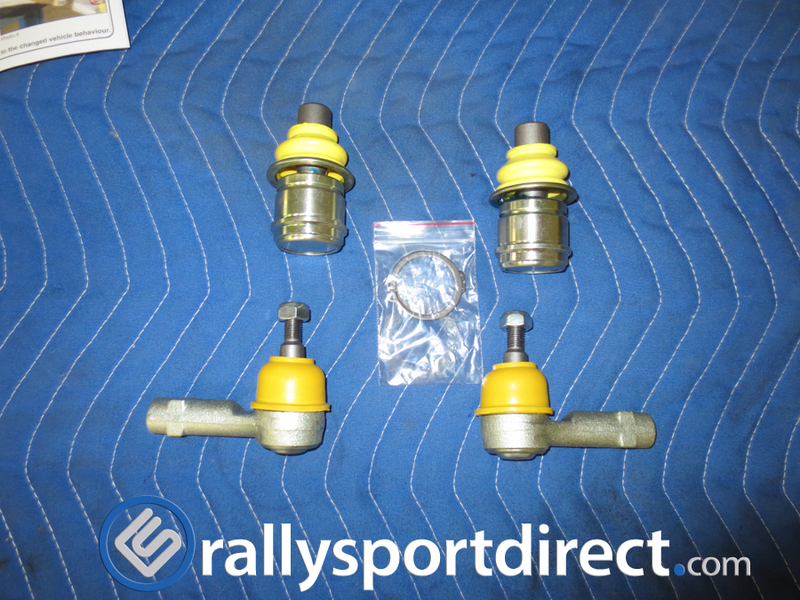 Tomei has provided you with a extra bung plug. 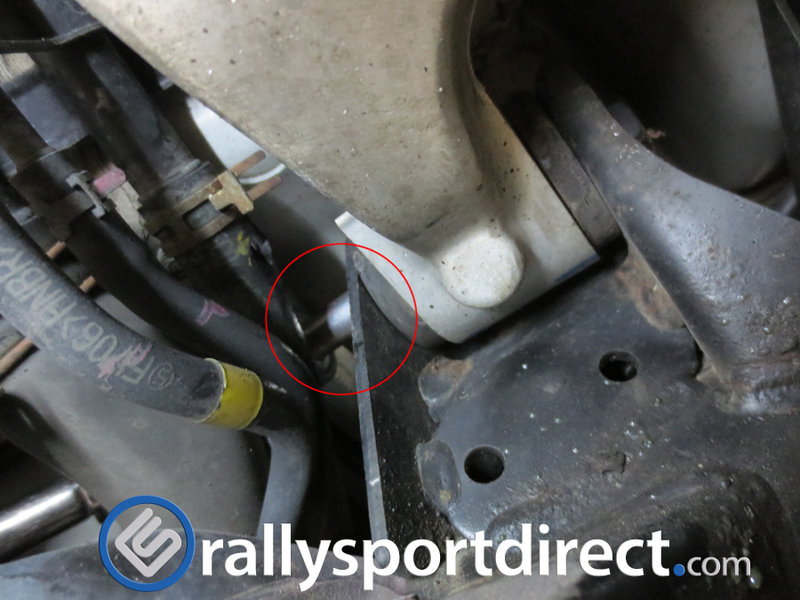 This would be the time to install this plug before putting the down pipe in the car. 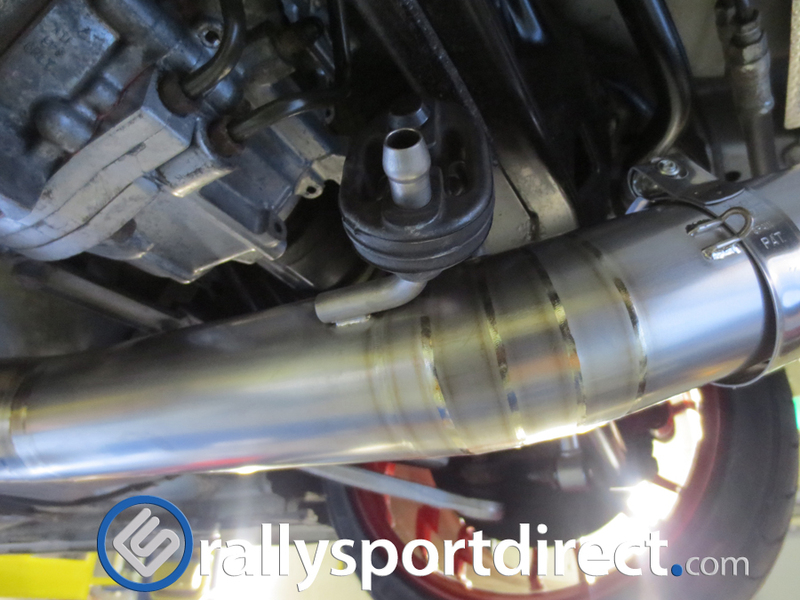 Install your new gasket that has been provided and be ready to install your new Tomei Down Pipe. 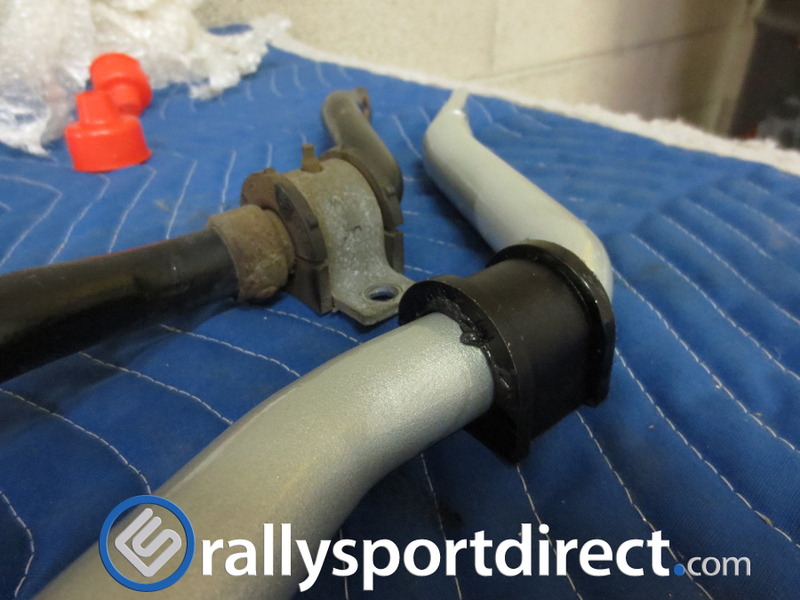 See how this is the incorrect way to try and install your down pipe as it is simply much to big to fit. 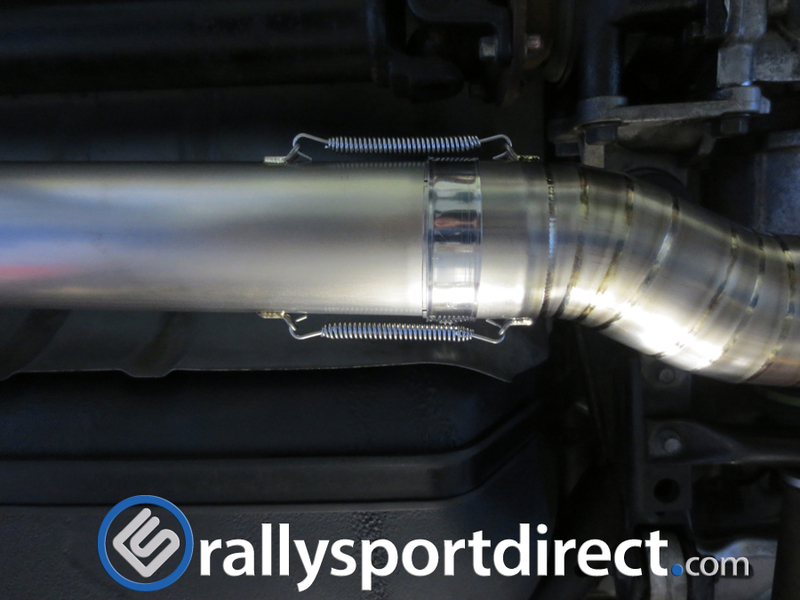 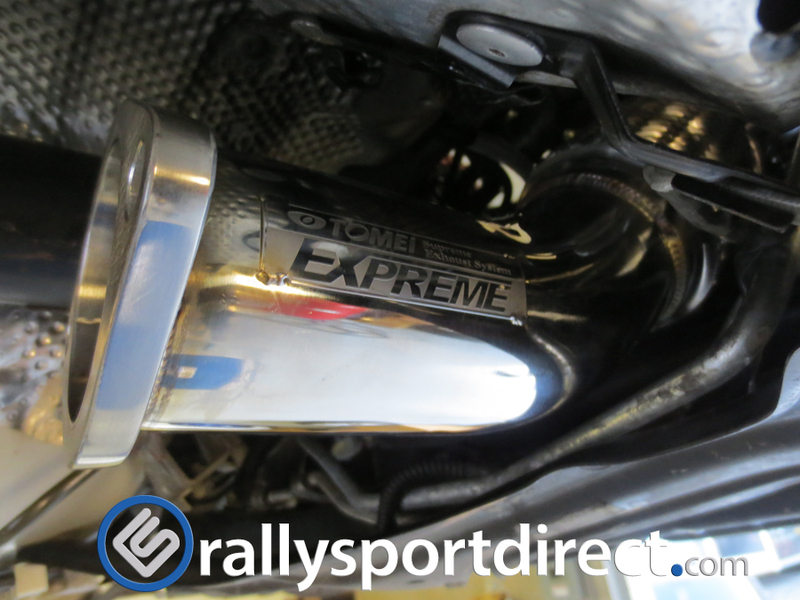 Install the new Tomei down pipe from the top of the engine bay. 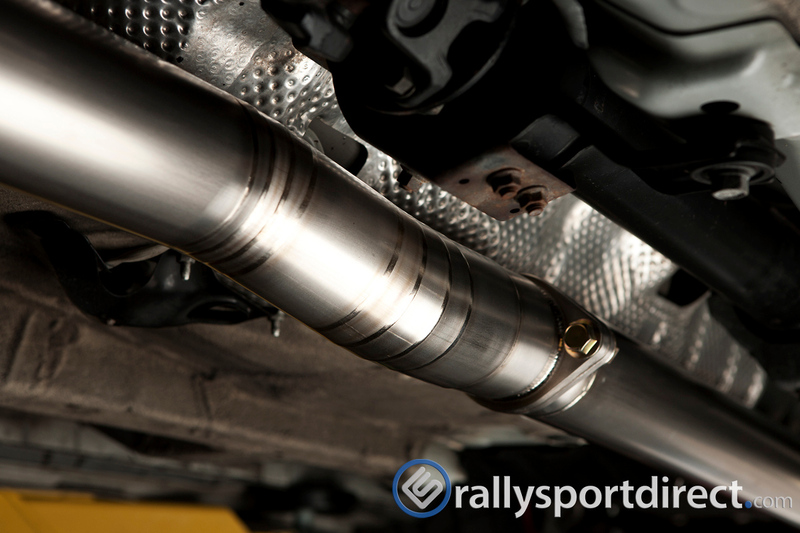 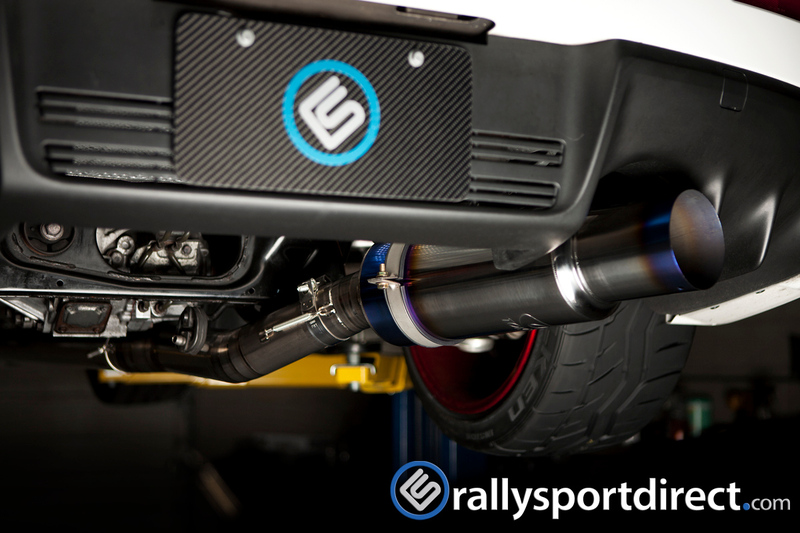 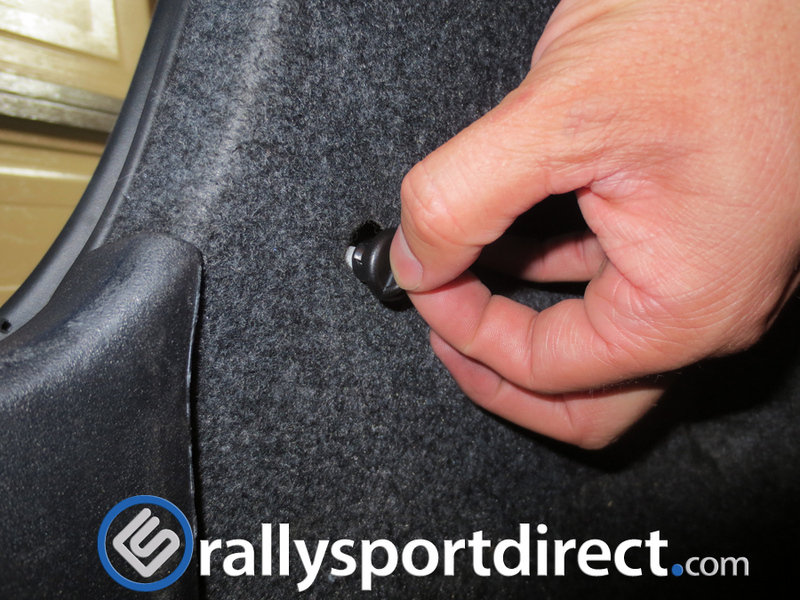 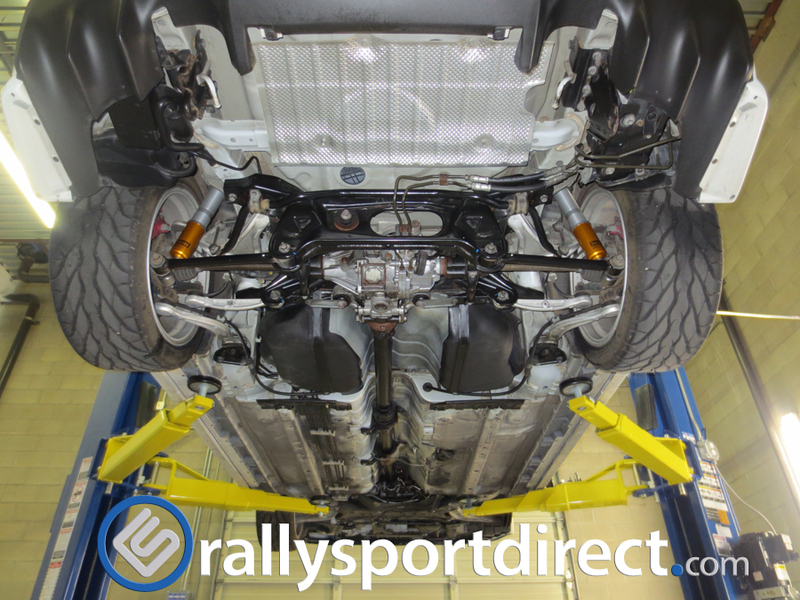 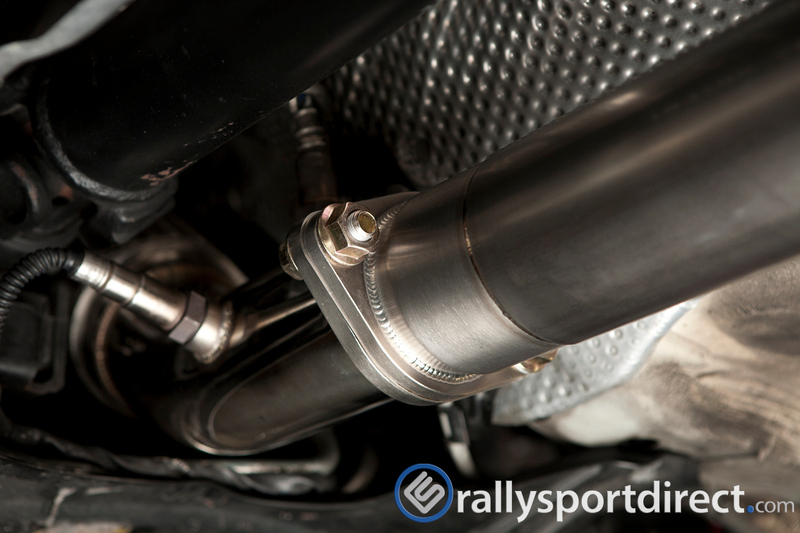 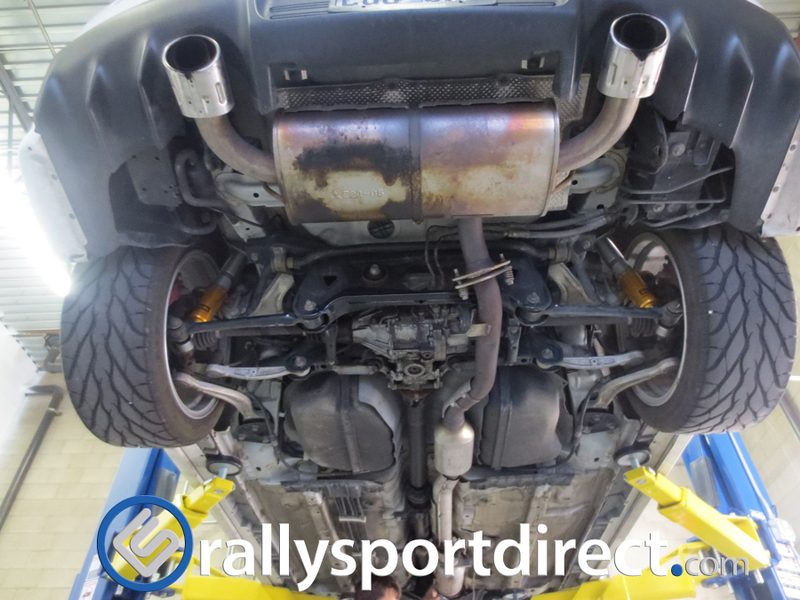 Set it gently into place to rest safely while you lift the car to gain access to the bottom of the car to align the down pipe with your turbo. 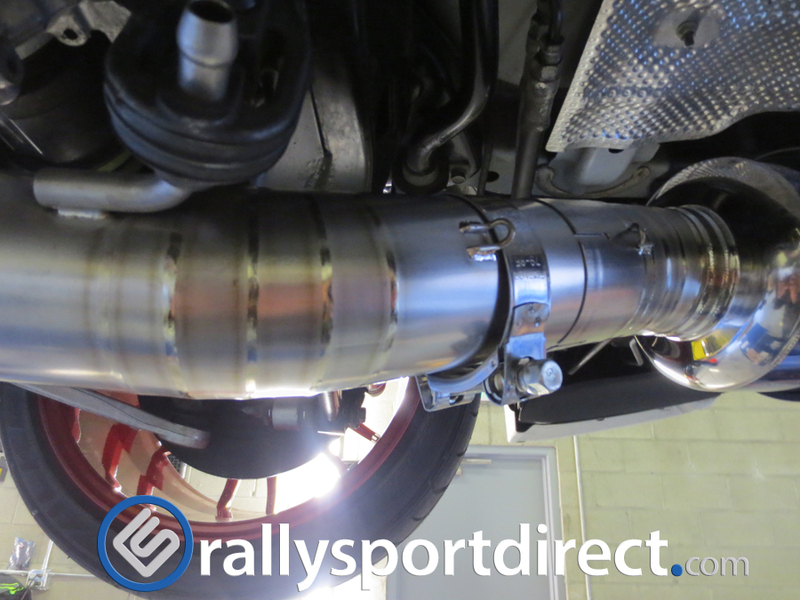 From below you can now align the down pipe properly. 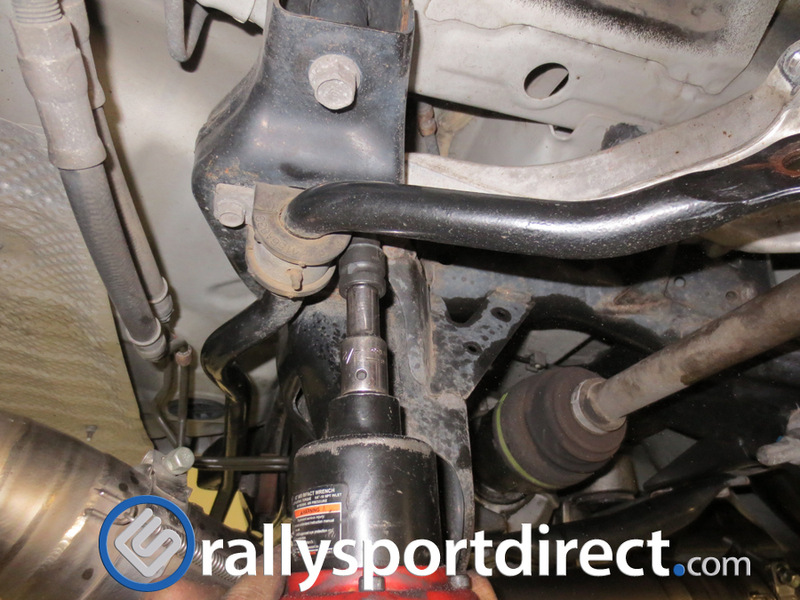 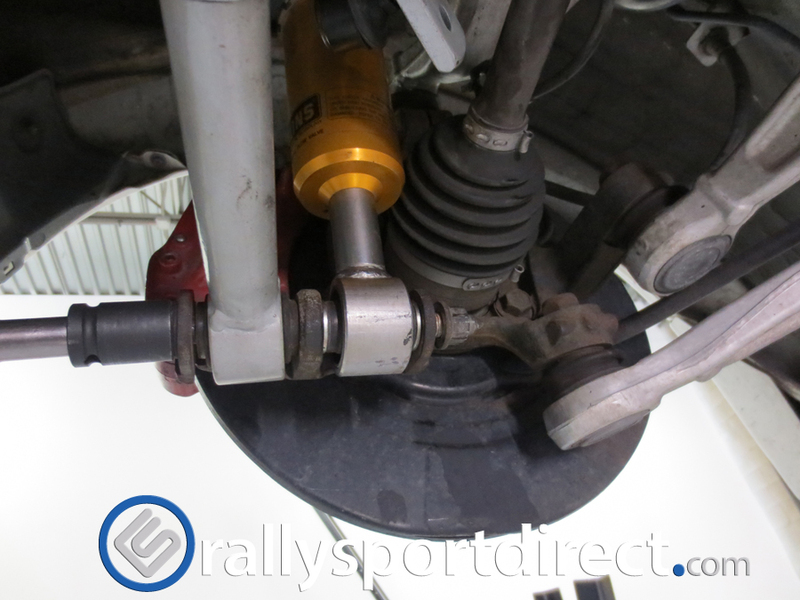 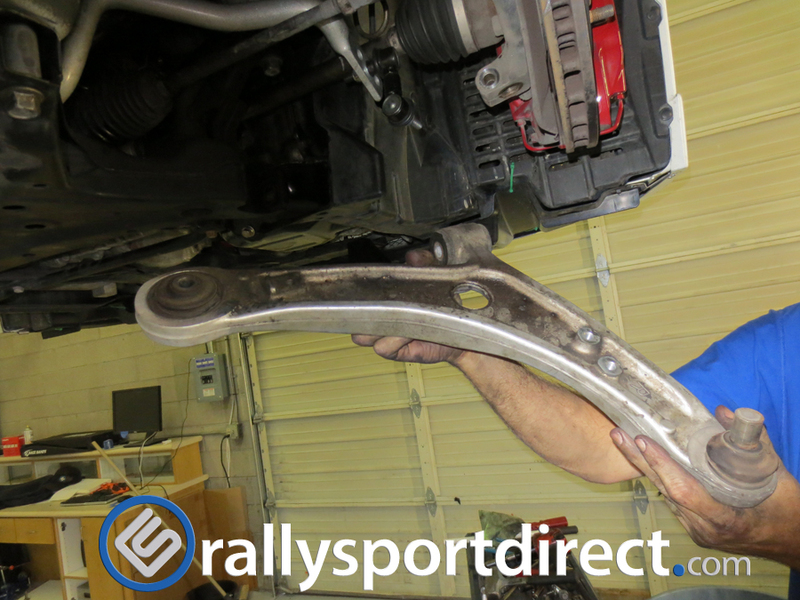 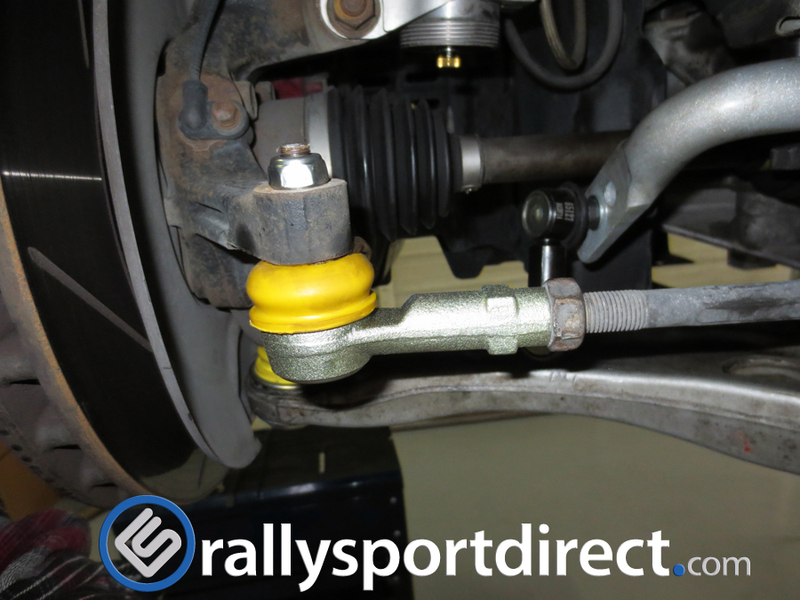 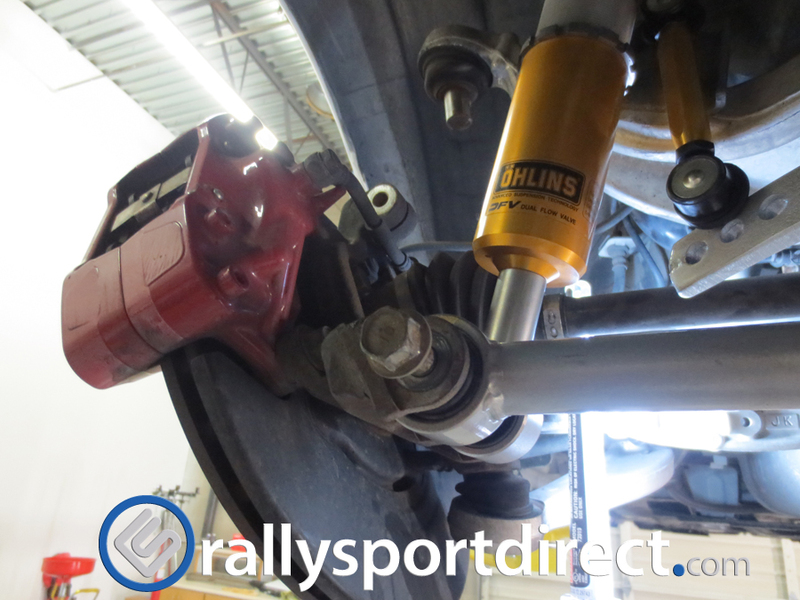 Reaching in from the wheel well can help you align and hold the down pipe in place while the bolts are all installed. 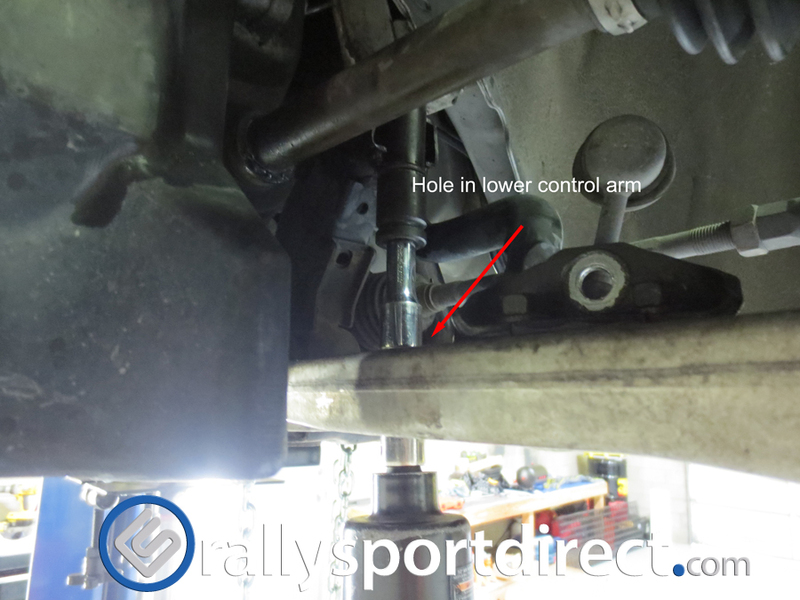 From down here you can install the nut that goes on the stud that is not easy to get to from the wheel well. 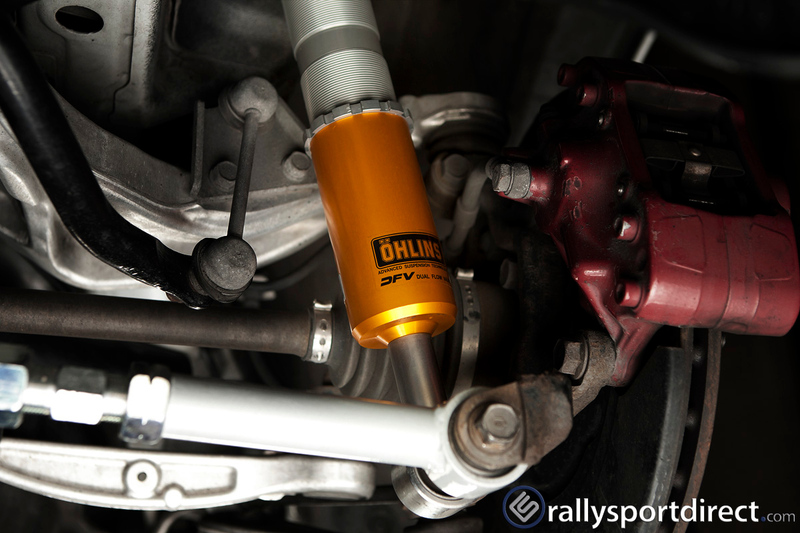 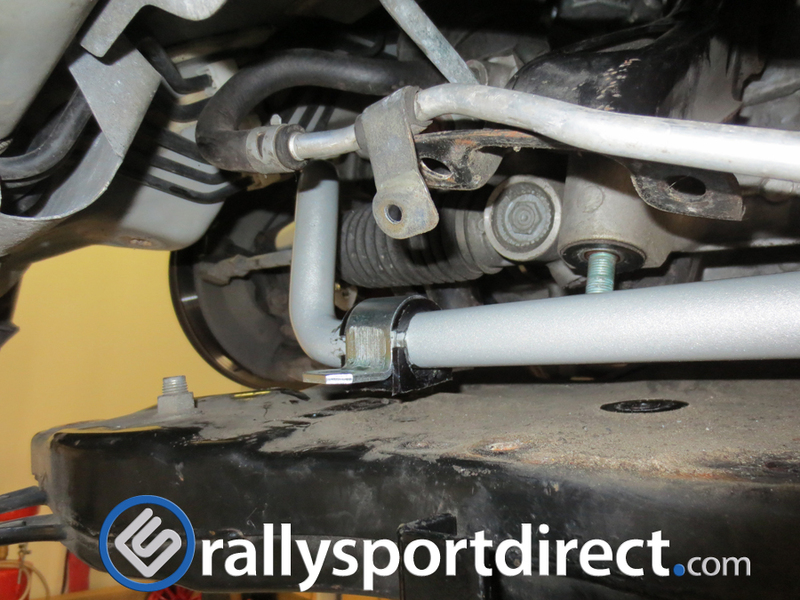 You can now align the lower portion of the down pipe and instal your O2 and ARF Sensor. 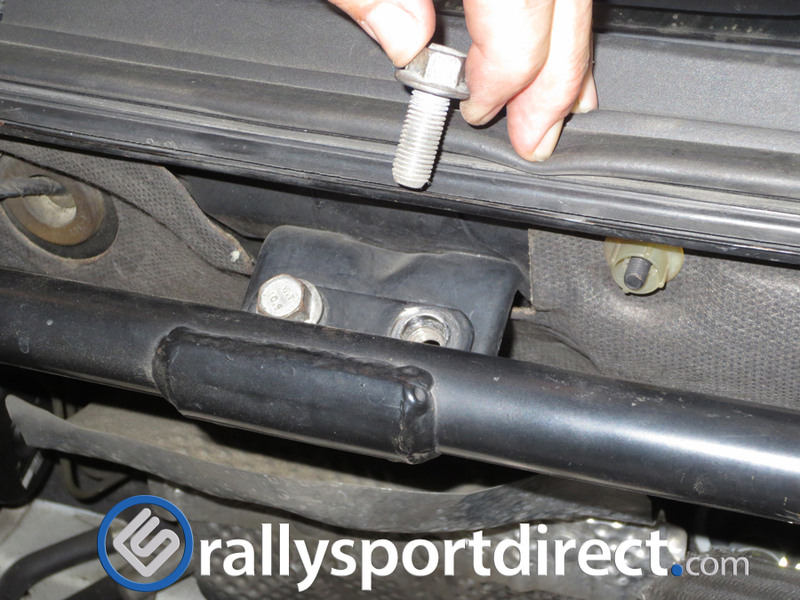 Tighten all of your bolts once everything is aligned. 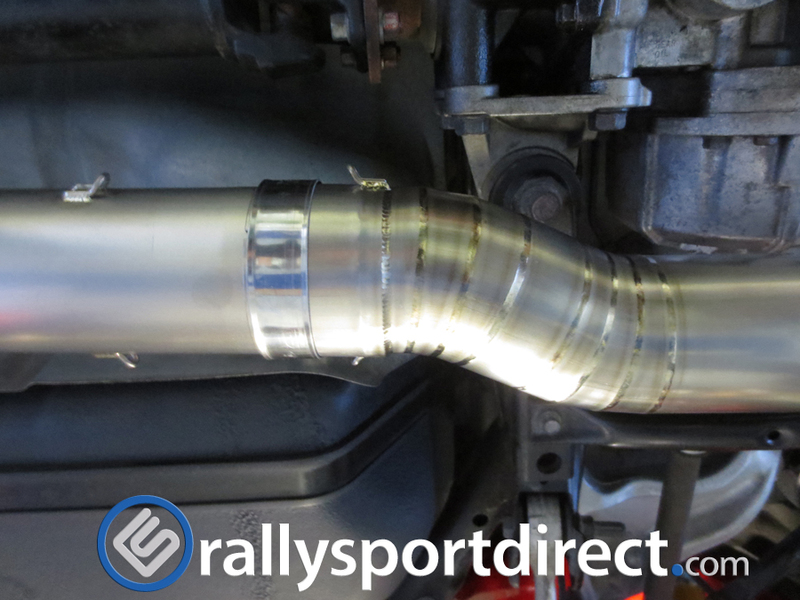 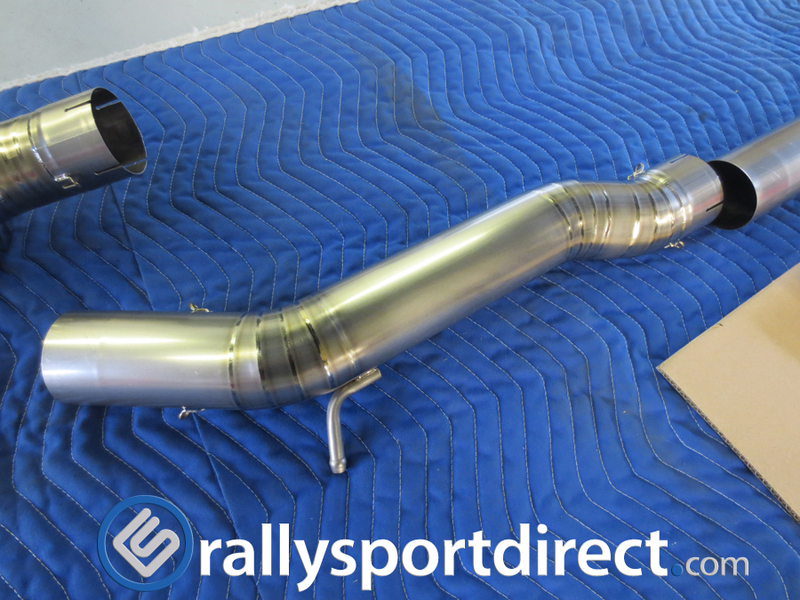 With your Cat removed and down pipe installed removal of your cat back exhaust will be simple. 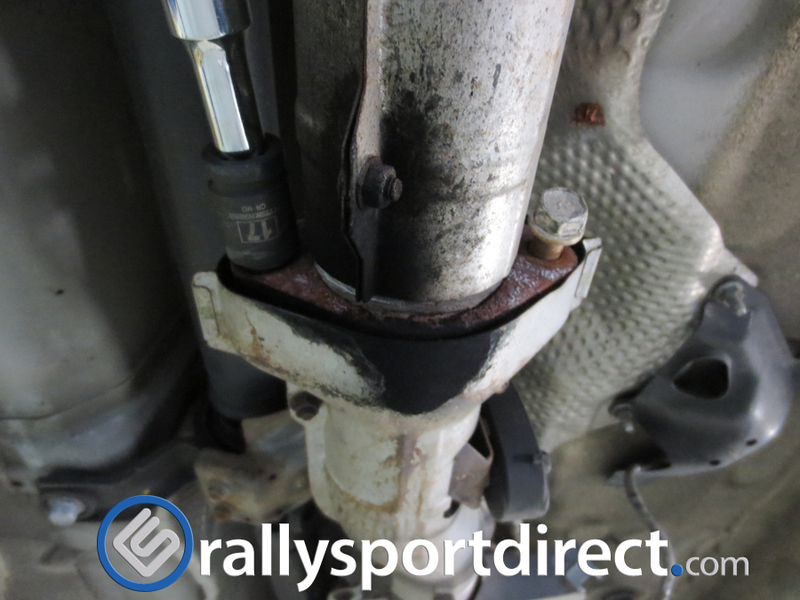 This exhaust system has seen better days. 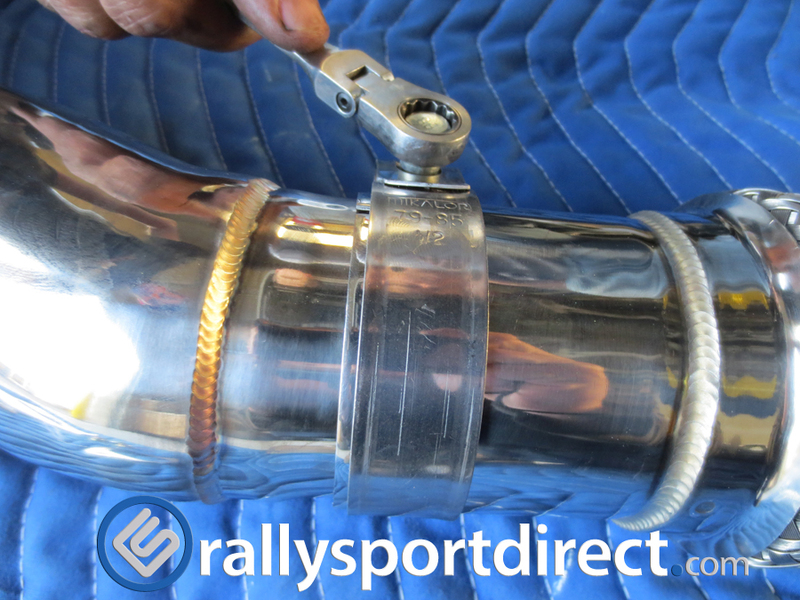 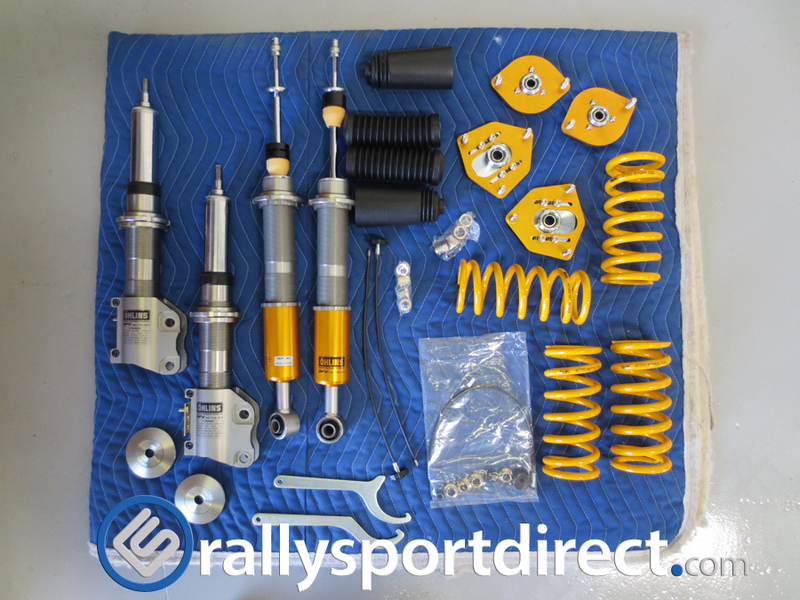 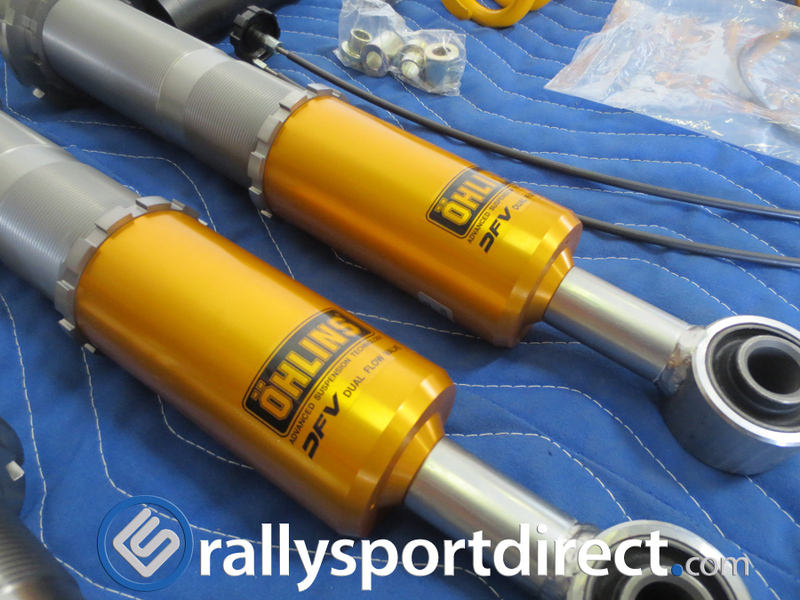 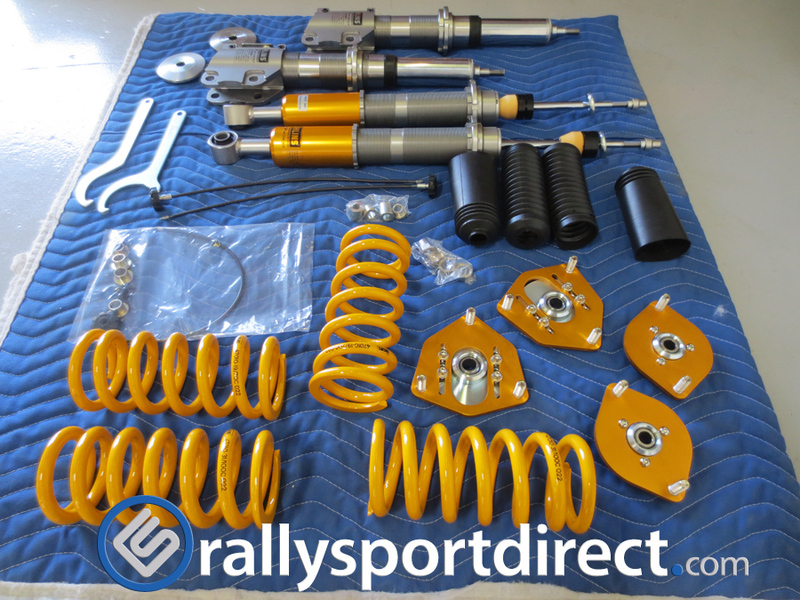 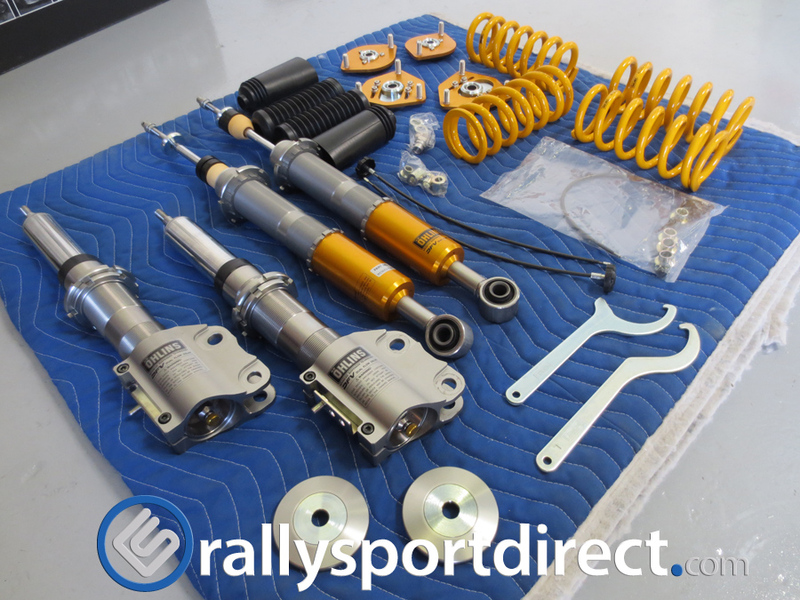 You will need a 17mm socket and ratchet and some PB Blast to remove the spring bolts and slide the hangers off the exhaust. 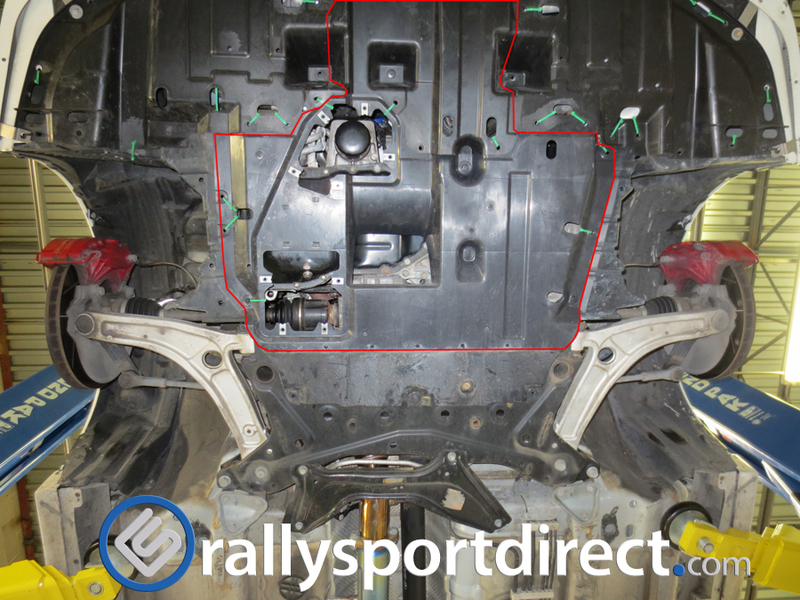 The Cat Back is made up of 2 parts. 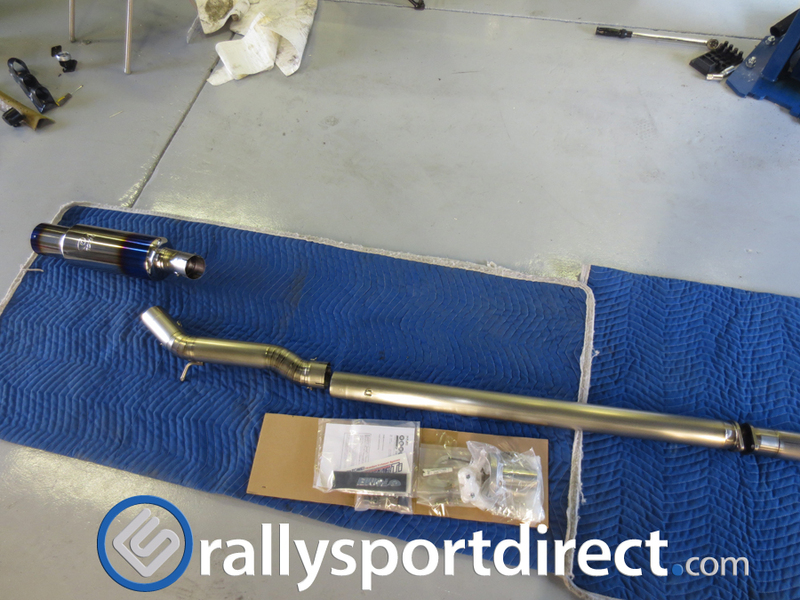 The Mid Pipe and the Muffler section. 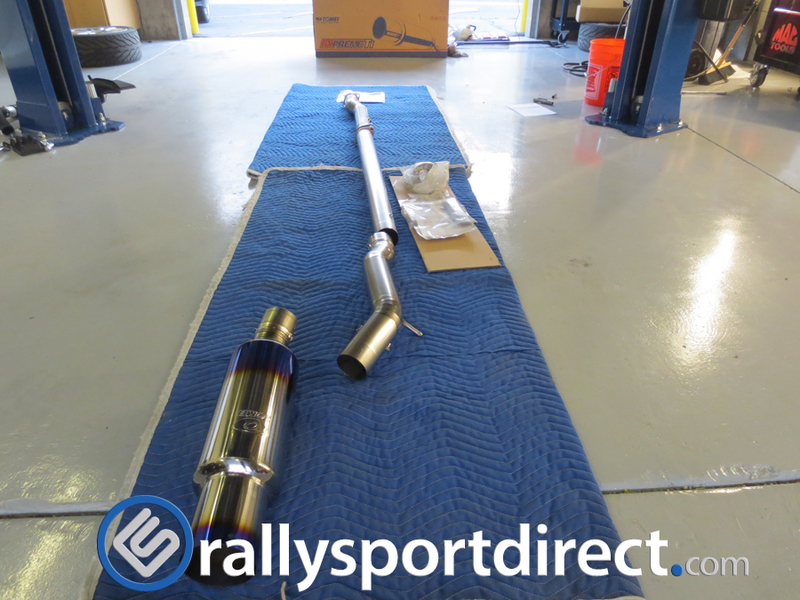 Now that the stock exhaust has been removed you will be ready for your Tomei Test pipe and cat back install. 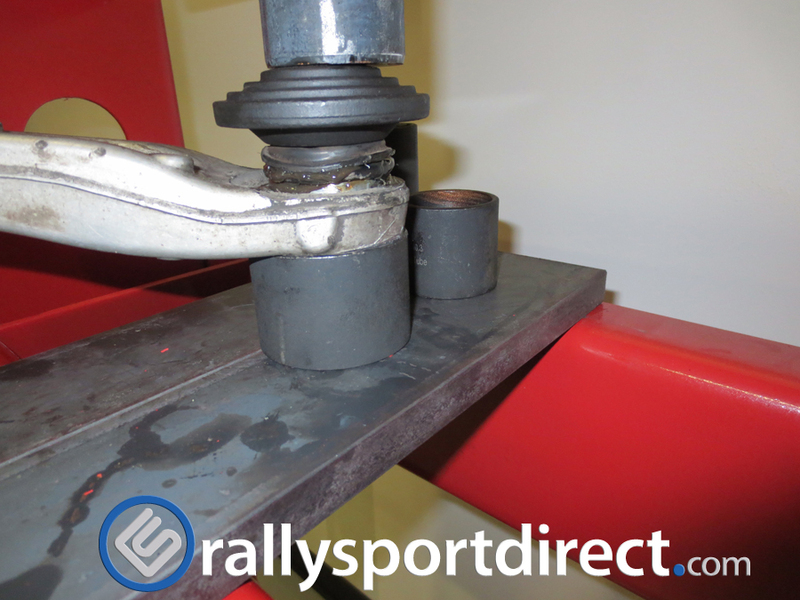 Lets start with the Test pipe section. 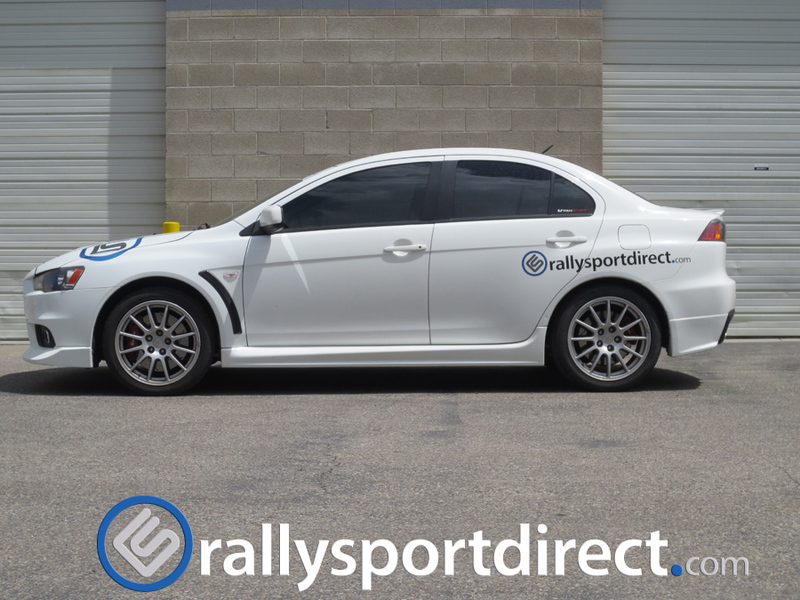 Save over 12 lbs!!! 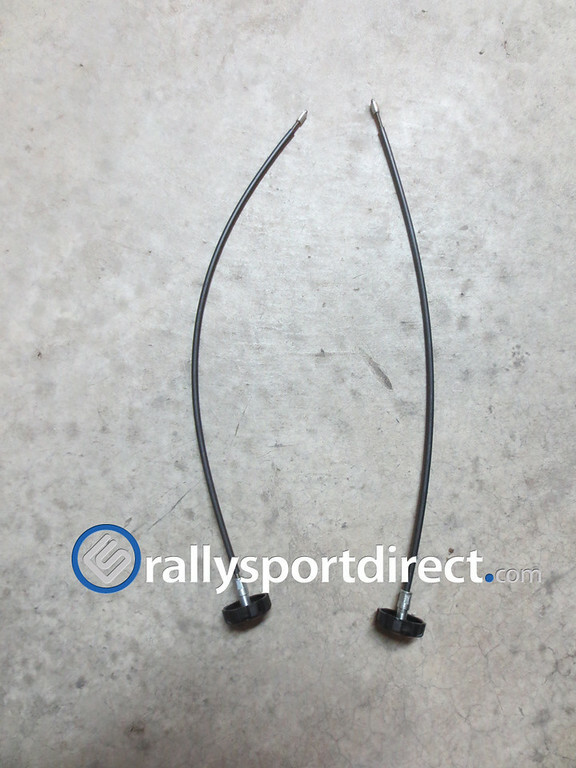 from the stock Cat! 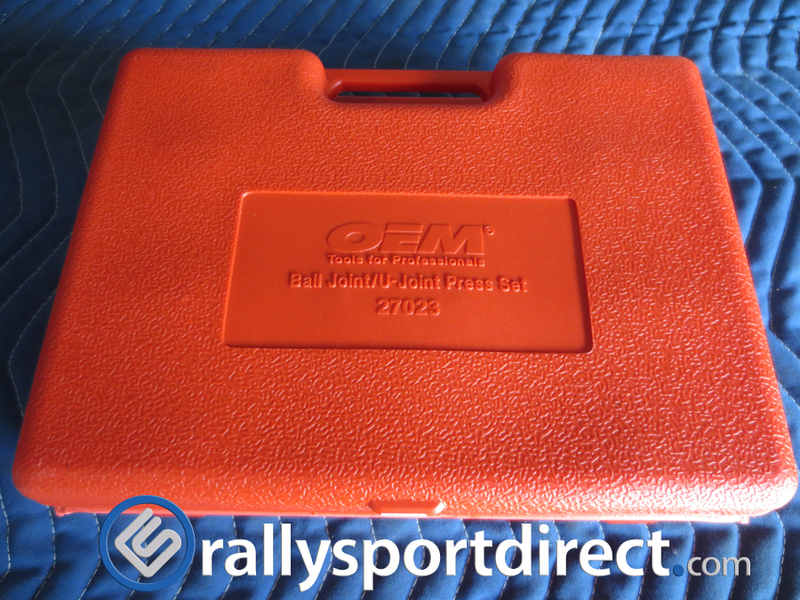 Stock Cat 14.7 lbs. 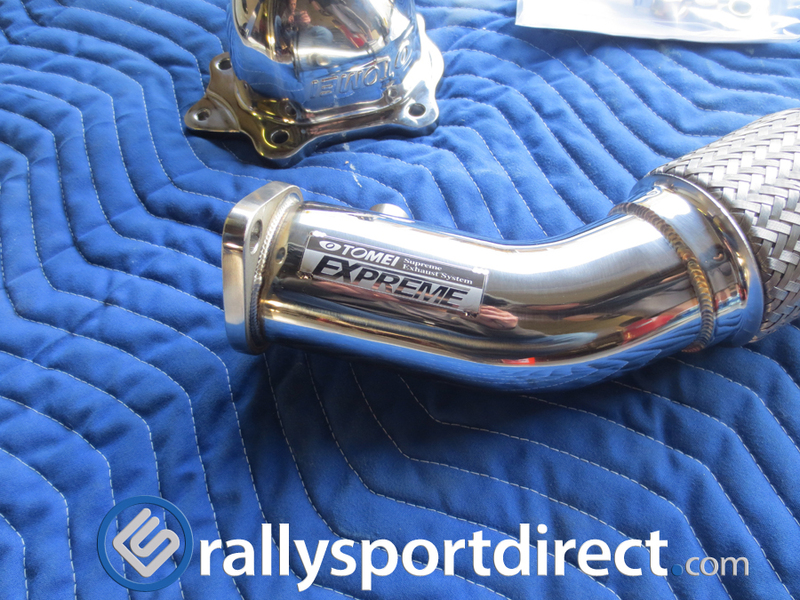 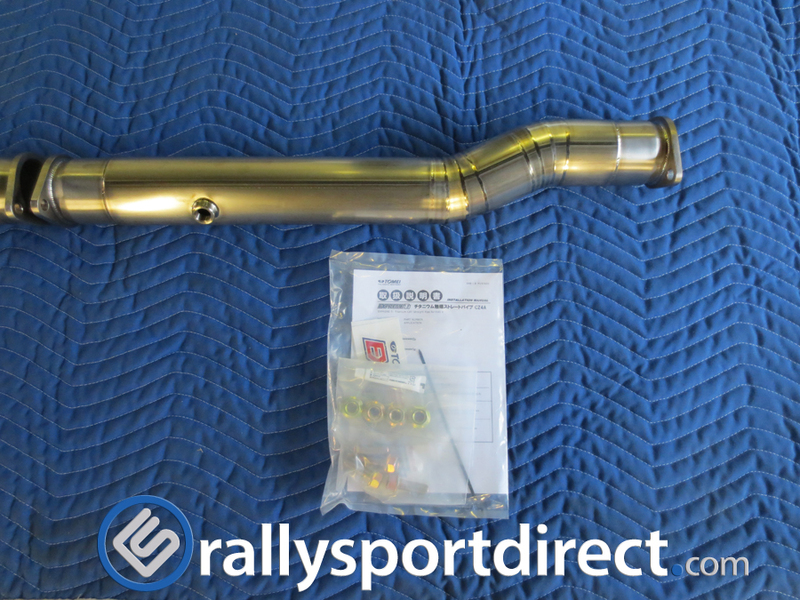 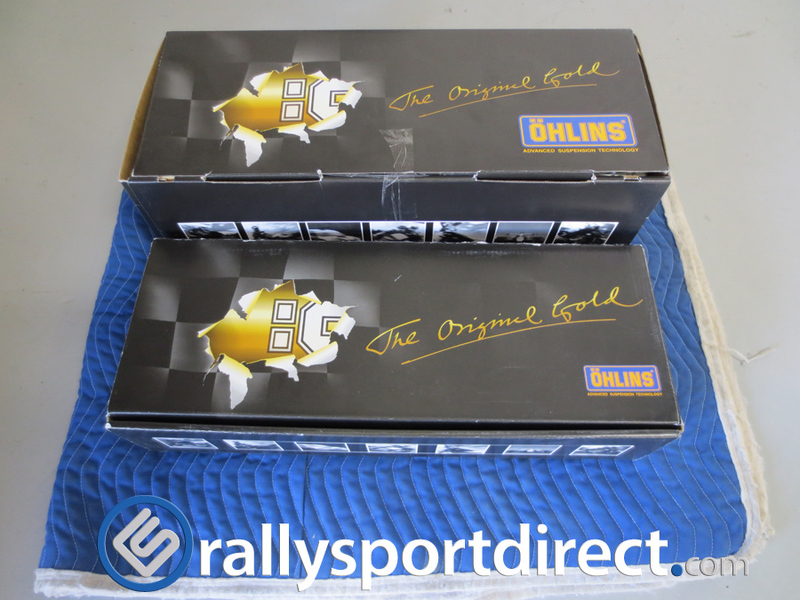 vs. Tomei’s Test Pipe 2.4 lbs! 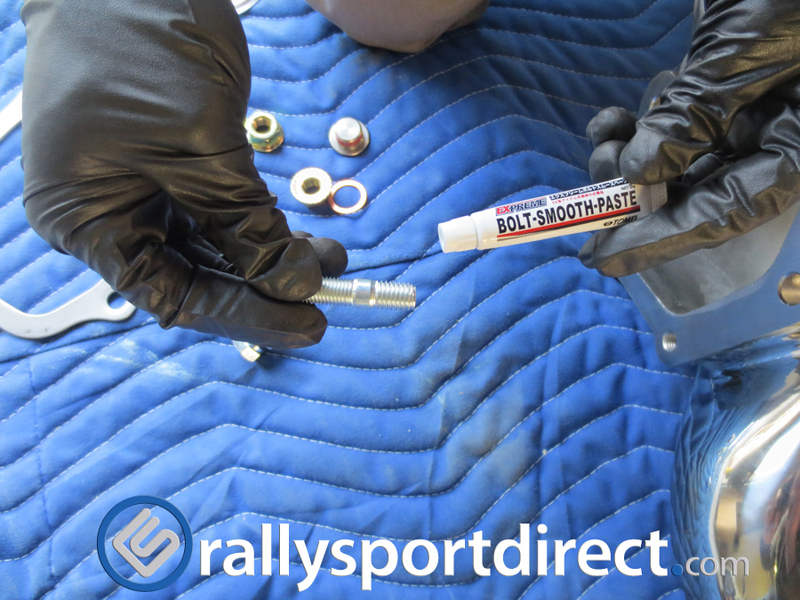 Take your new hardware and apply some Bolt-Smooth-Paste to them. 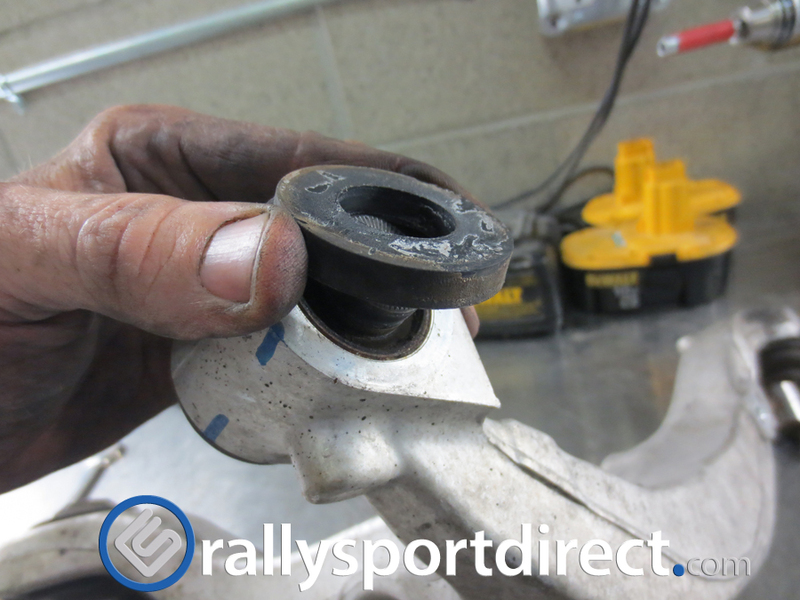 Slide them onto your down pipe and install new gasket that is provided. 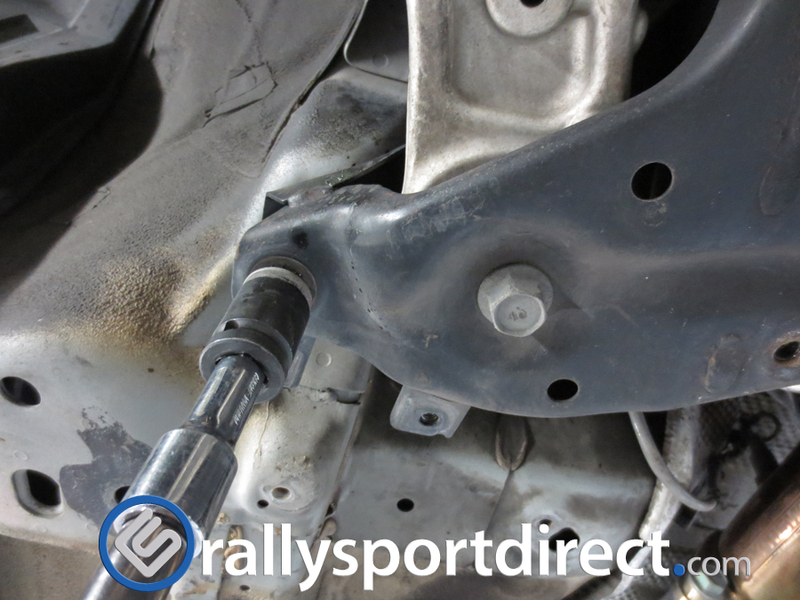 Install the test pipe and mount the bolts that are provided. 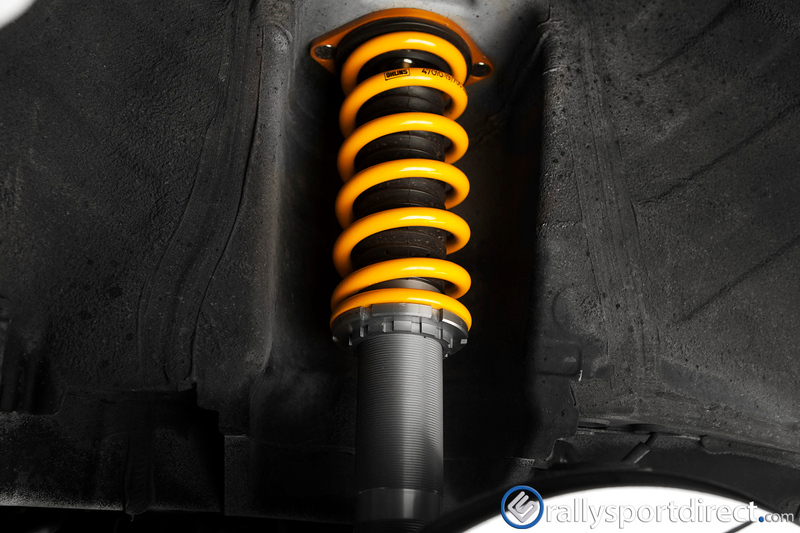 It is now time for the main event! 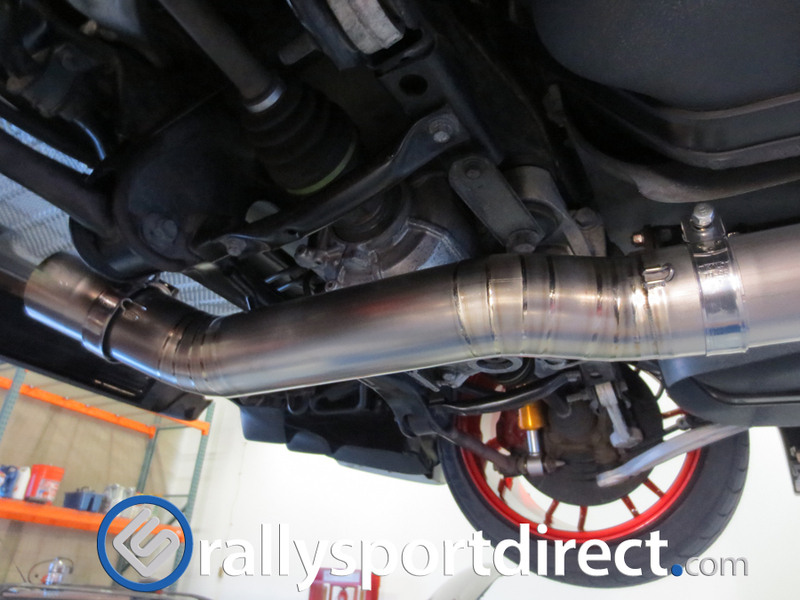 Tomei Titanium cat back install. 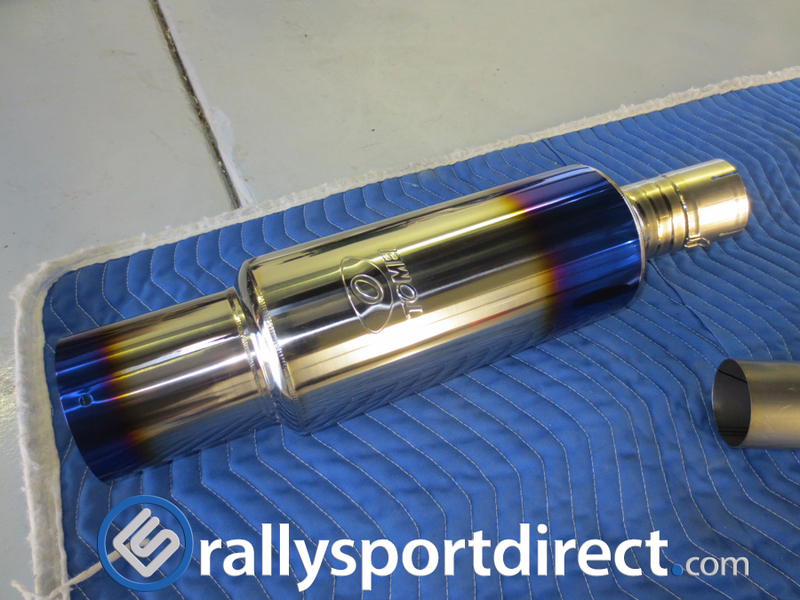 This extremely light weight and a work of art! 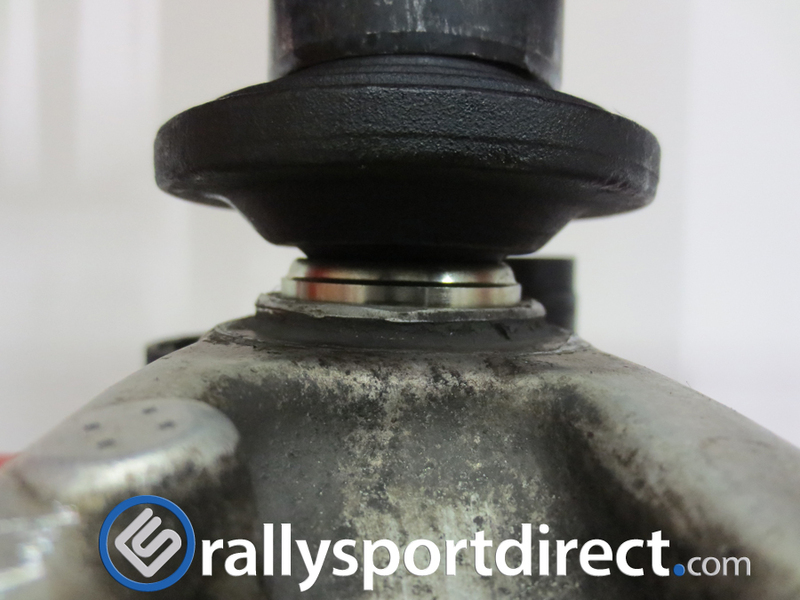 This system really is extremely light weight! 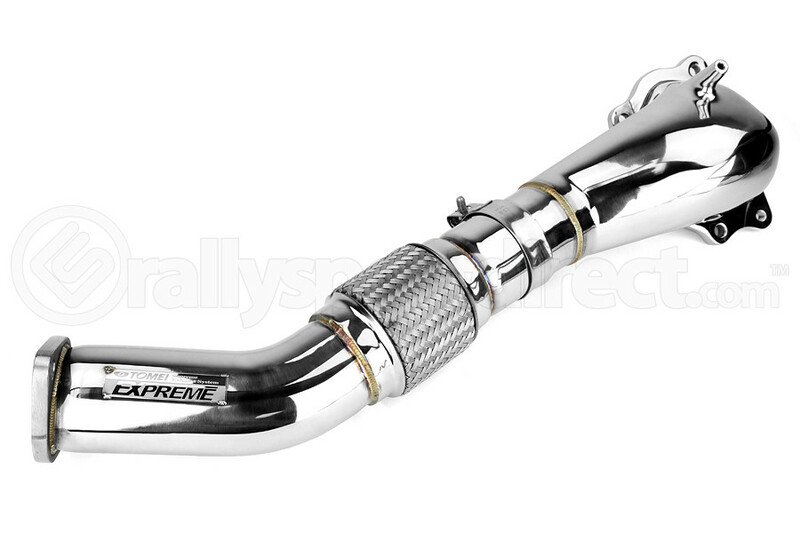 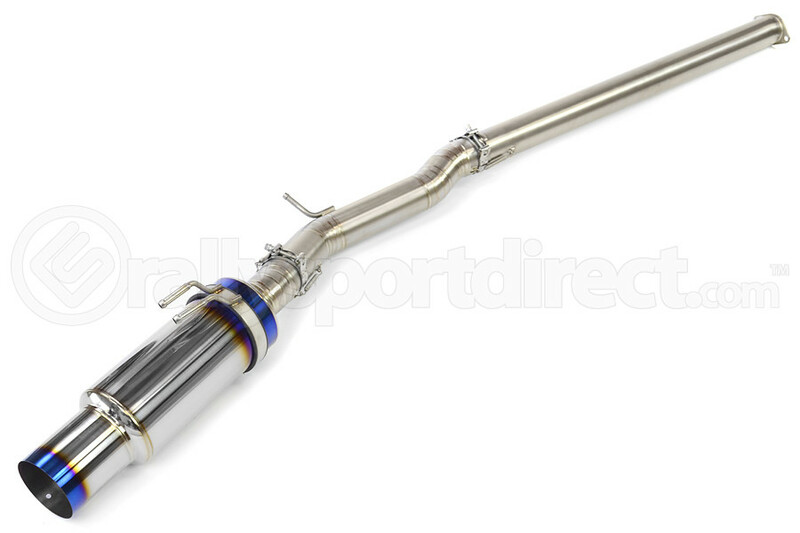 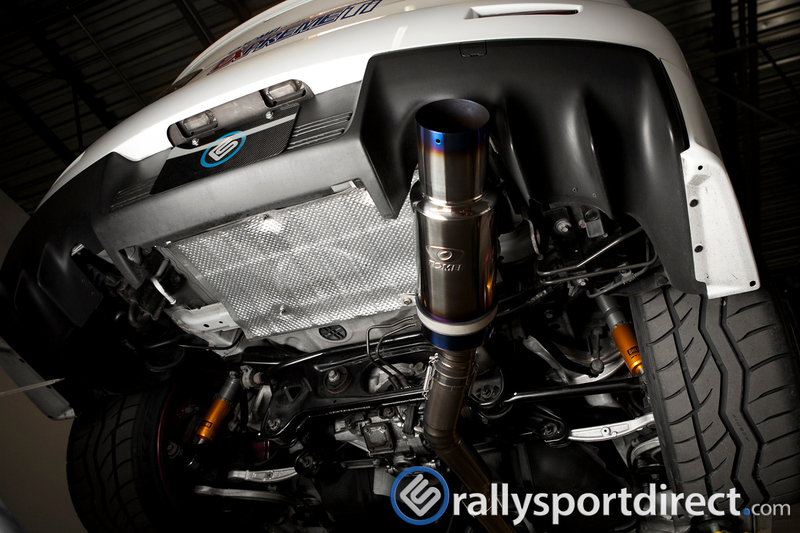 You will save over 34 lbs form your stock cat back with the Tomei Titanium Exhaust. 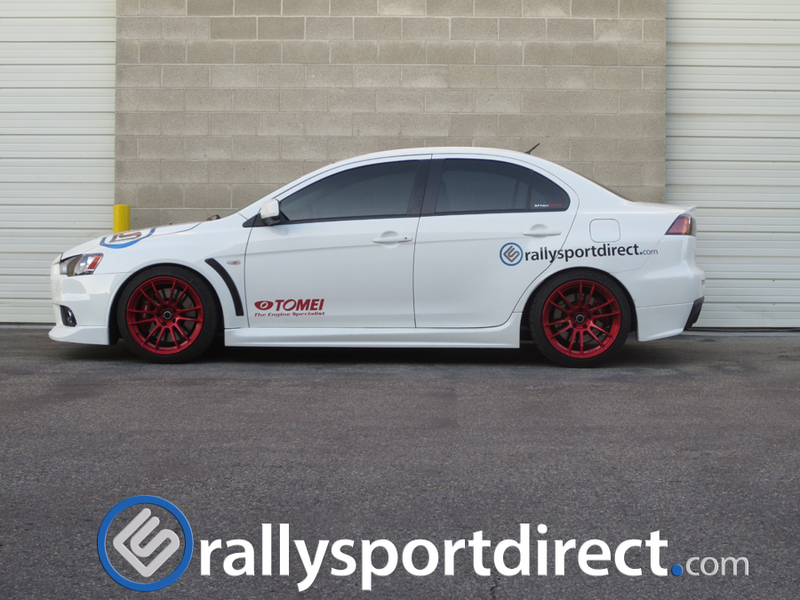 Stock 44.2 lbs vs. Tomei 9.7 lbs!!! 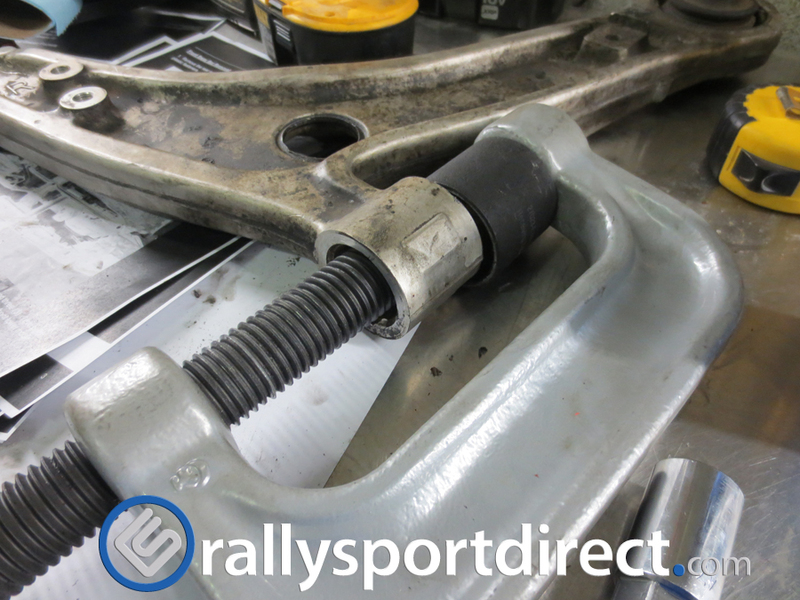 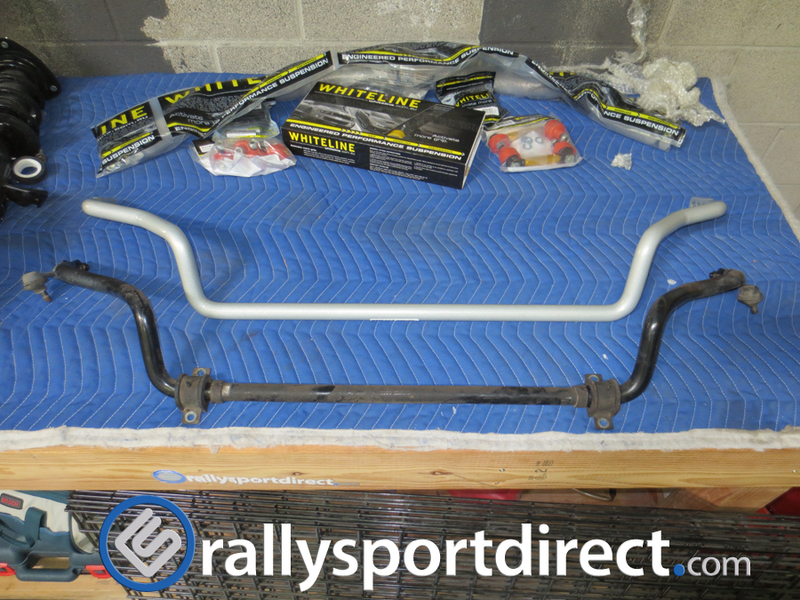 Slide your middle section onto the end of the straight pipe lining up the spring retainer hooks. 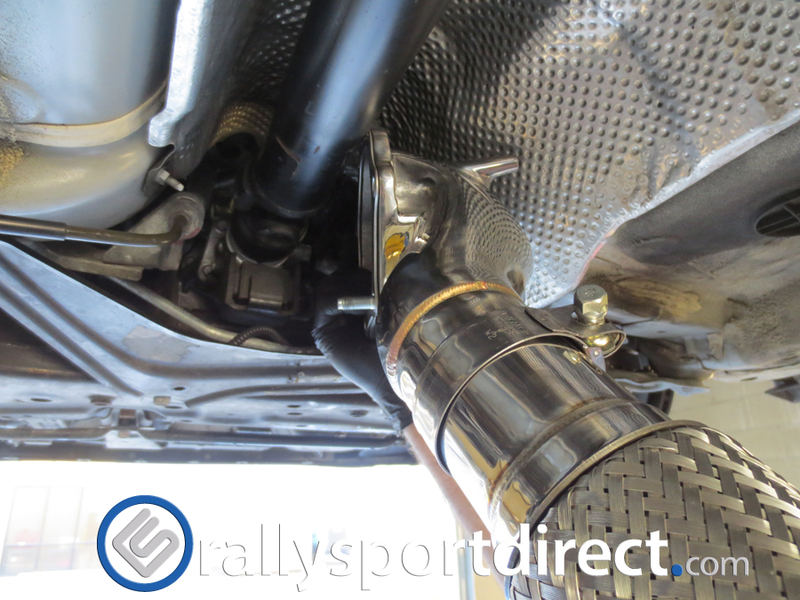 Once the two pre-muffler pipes are connected we hook the exhaust on the first hanger under the rear diff section. 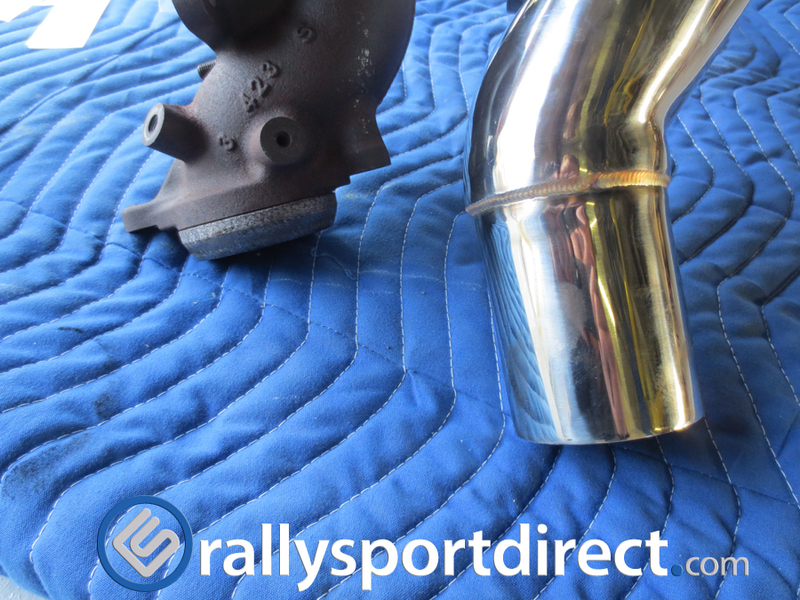 Your two pipes should look like so once installed. 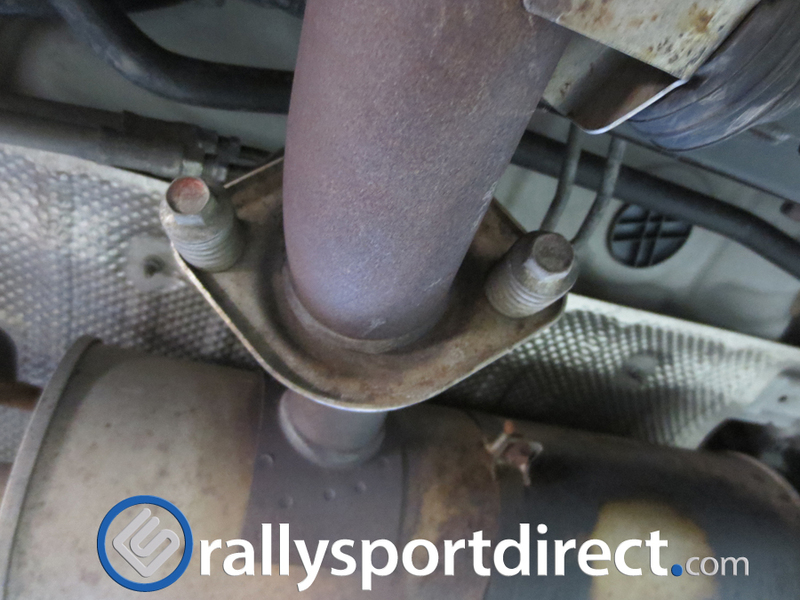 We snugged up our exhaust clamps and had the bolt on the top of the exhaust as to not hang down low. 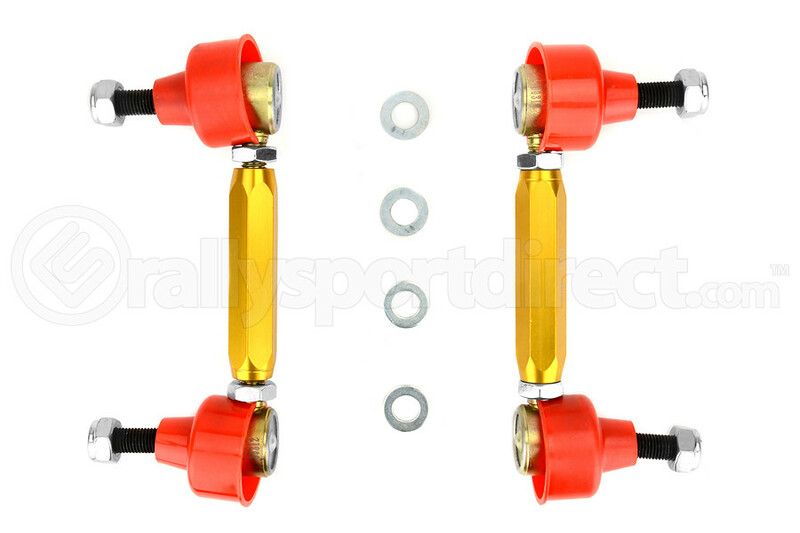 They could get caught or rub if your car is low. 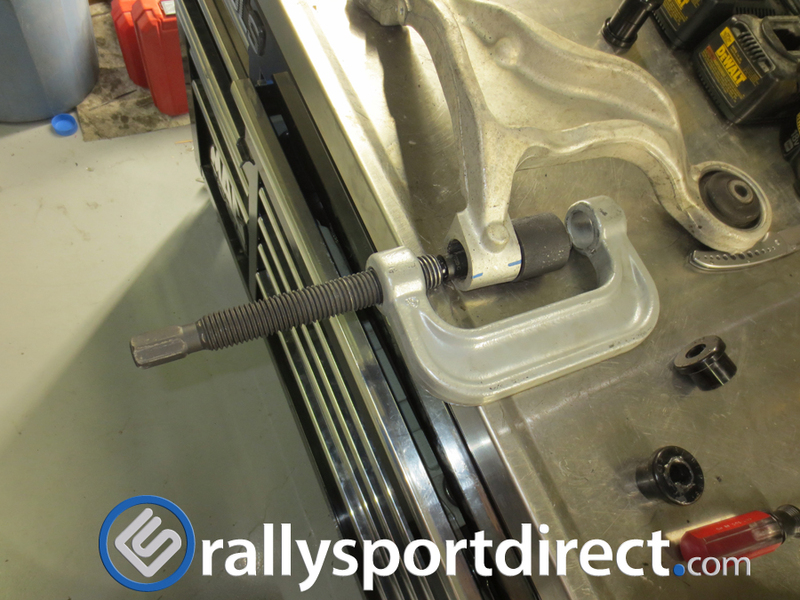 Install your retainer springs once your clamp is snug. 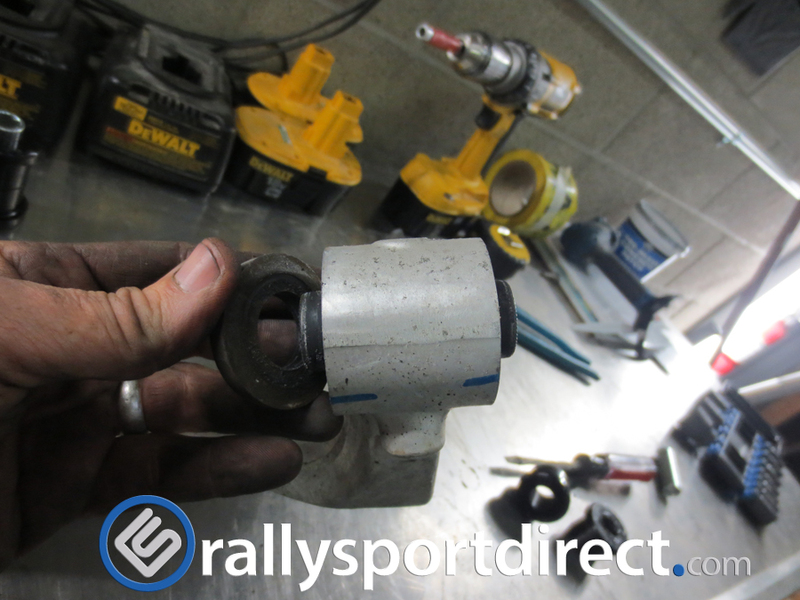 You may use pliers for pulling this enough to hook. 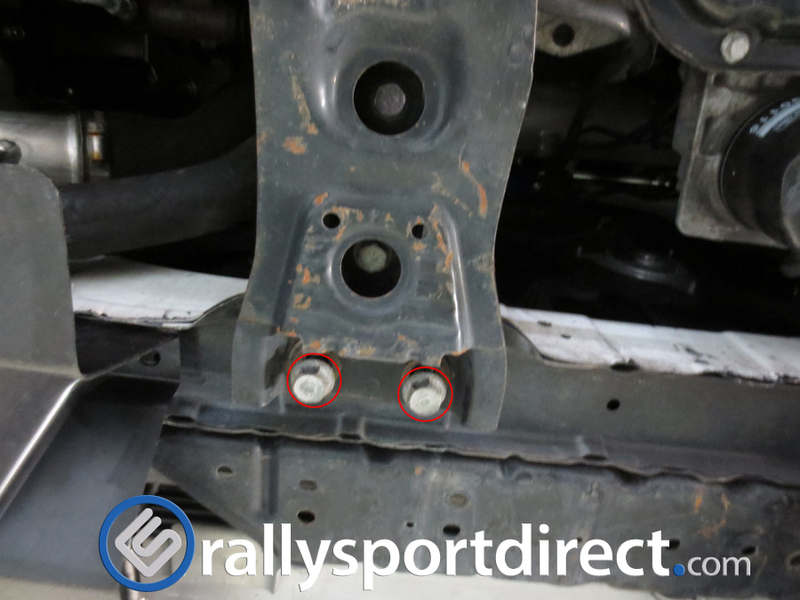 Once your retainer springs are installed it should look like so. 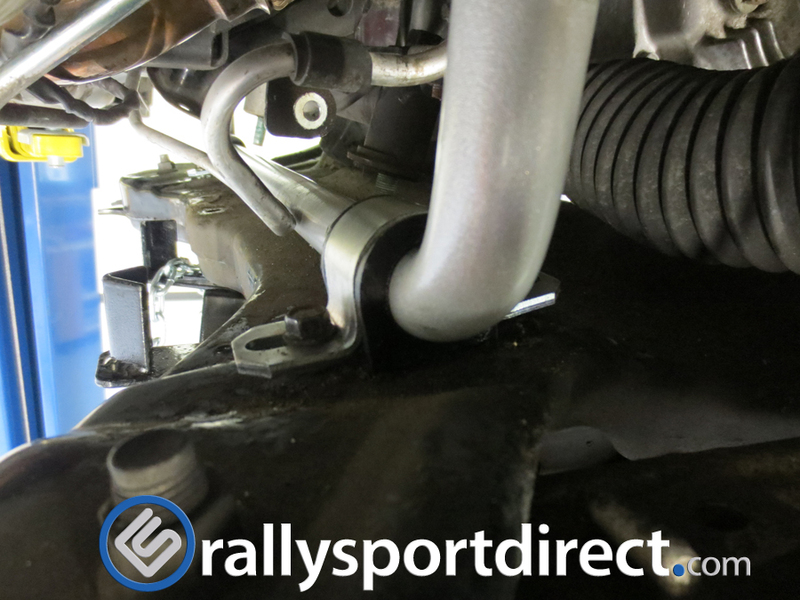 For the Muffler section we installed the muffler hanger and hanger before the muffler. 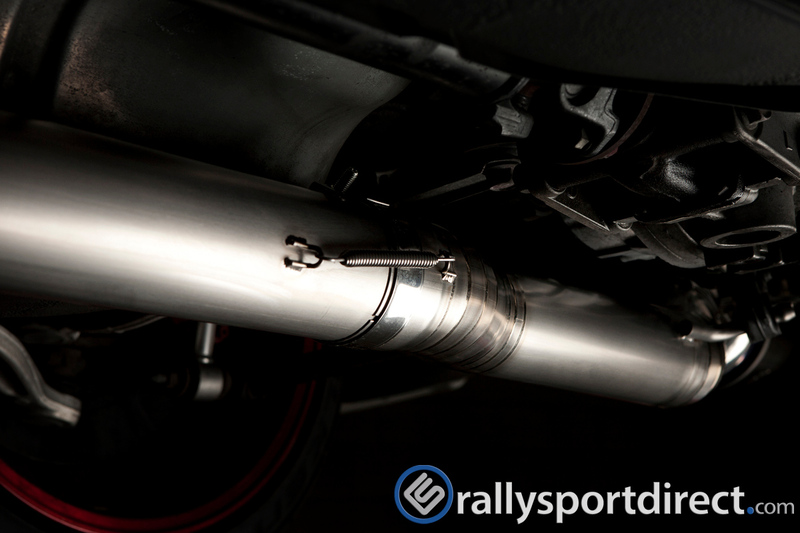 Slide the muffler through the hanger and line up the muffler to the middle section of the cat back system. 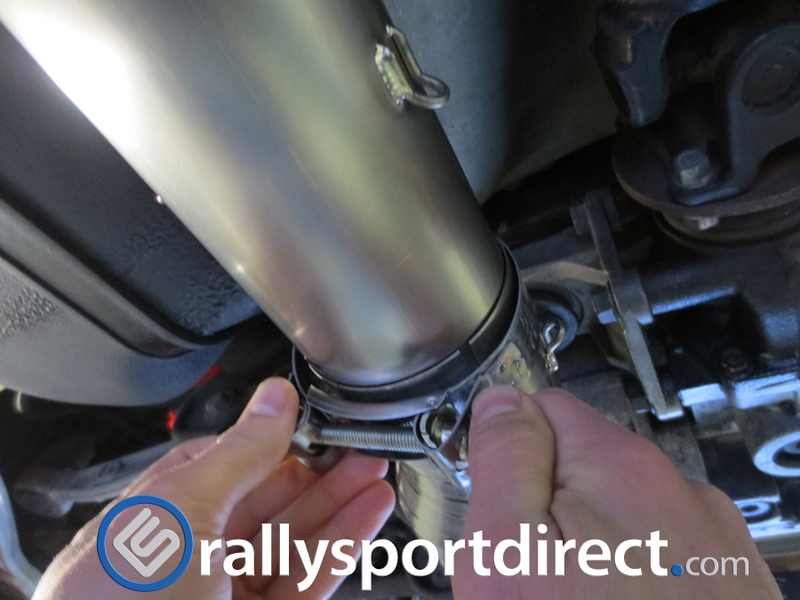 Once you have the muffler in place and aligned up snug up your exhaust clamp and attach your retainer springs. 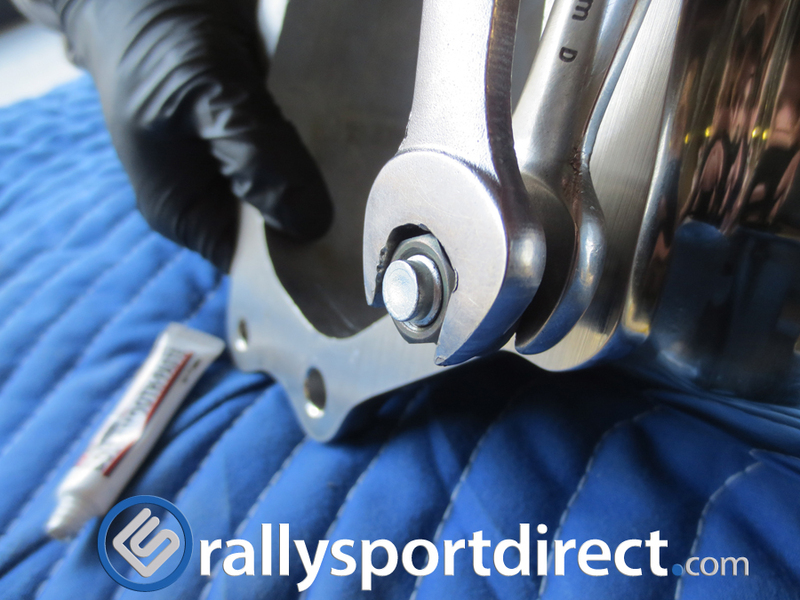 It is now time to tighten up all your clamps. 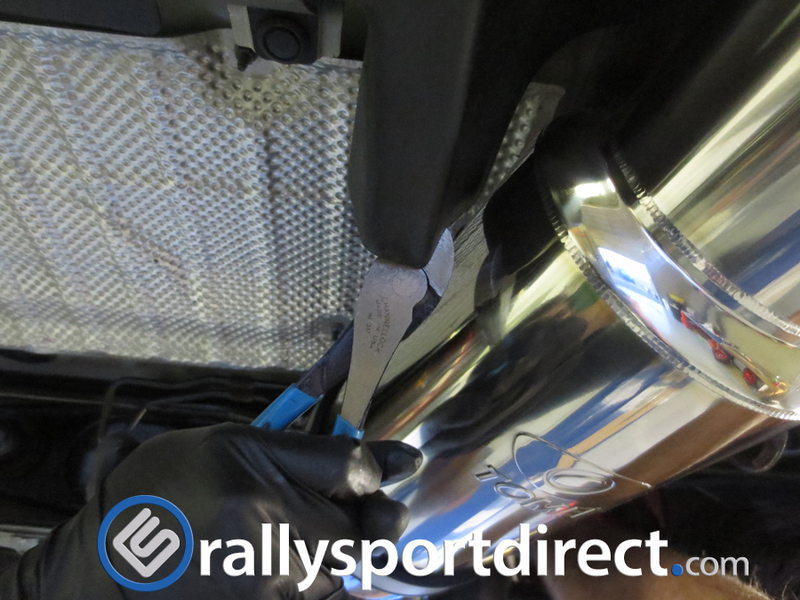 With the exhaust being installed you may notice that the exhaust tip has a slight angle that makes it come close to thebumper plastic. 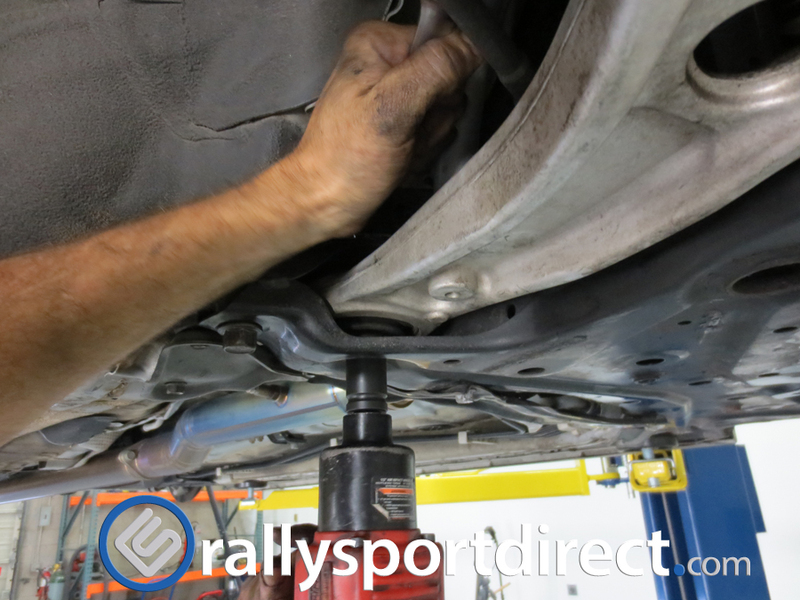 Using something to cut the plastic with carefully trim away what is needed to provide more clearance of the bumper to muffler. 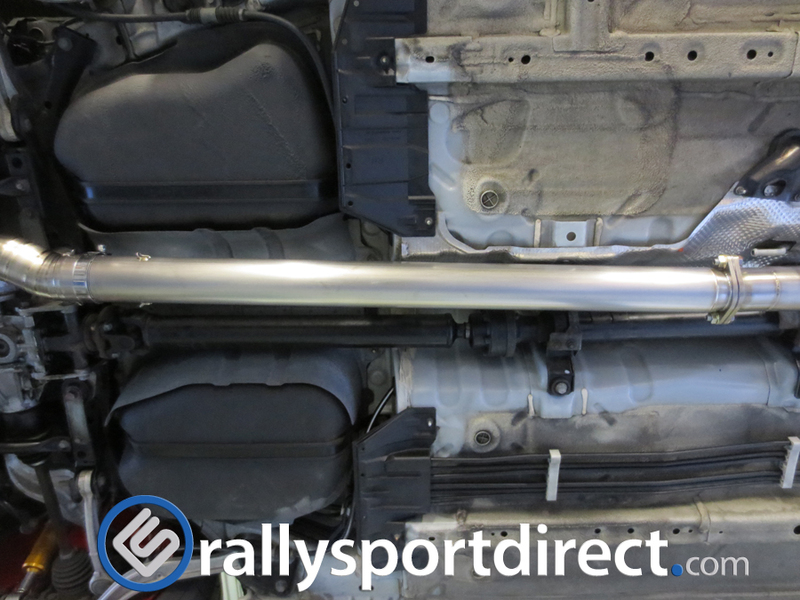 Bumper now has now been trimmed to fit with the muffler with plenty of clearance.